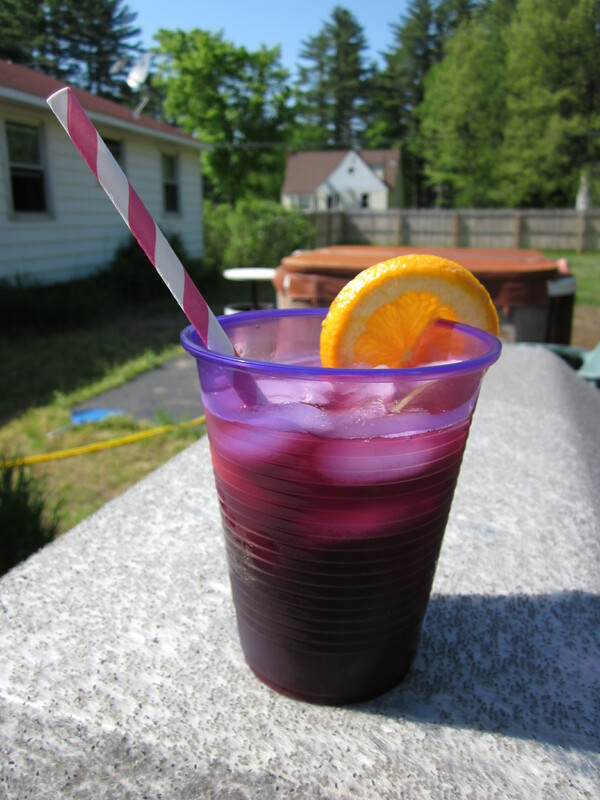 Start Summer at Mohegan Sun BBQ Fest! My US-based readers know that Memorial Day Weekend has (unfortunately) come and gone…I’m sure that reality was made very clear when rolling out of bed this morning. I don’t know about you all, but putting on my big-girl pants and going to work after a three-day weekend is always hard, ESPECIALLY when I wake up to a hot summer day like I did today. 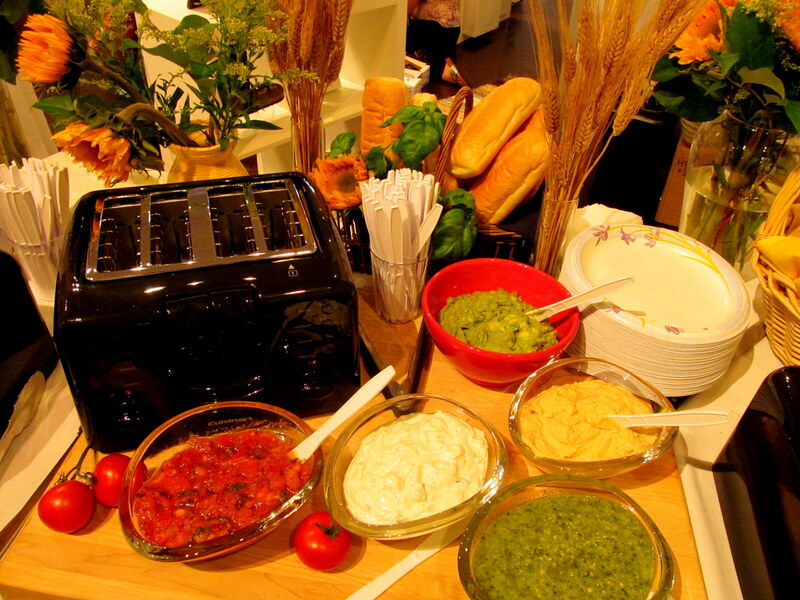 The appetizer fixings for a great BBQ! With Memorial Day Weekend came many barbecues I’m sure, along with the fun family and friends that typically accompany them. You’ve got the summer party momentum going…do NOT let it stop this weekend! If you’re looking for another BBQ with family and friends, but don’t exactly feel up to putting on your grilling/cooking/cleaning/etc cap again so quickly, let Mohegan Sun do the work for you. This Friday, Saturday, and Sunday (June 1-3), the casino will be holding its first-ever Sun BBQ Fest! Mohegan Sun is a city in its own right, and it’s a city that knows how to throw a party. Take it from me – I attended the Sun WineFest several months back and had an amazing time wining, dining, and watching master chef demos. However, the price tag on that main event and its surrounding “supplementary” events was, I have to admit, a bit steep for the everyday 20-30 year olds. That’s certainly not the case with the Sun BBQ Fest. Tickets are only $30 per day, and that INCLUDES eight food tickets! Oh, and did I mention this event is taking place outdoors in the casino’s Winter Parking Lot? 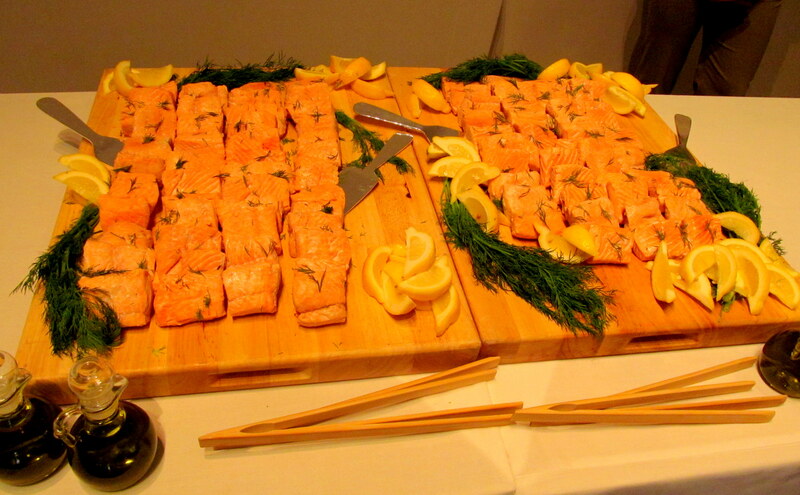 Because a BBQ isn’t a BBQ if it’s held in a convention center (where the WineFest was held)…that’s for certain. Obviously I’m going to start by talking about the food you can purchase with those eight food tickets. Both rib vendors and Mohegan Sun restaurant vendors will be dishing out tasty eats. I’m really excited to try a dish from Big Bubba’s BBQ, the casino’s barbecue-restaurant-in-residence, which I’ve yet to cross off my list of Mohegan Sun restaurants to dine at. New England readers may have dined there before, or at some of the other participating restaurants, like Michael Jordan’s 23 SportCafe, Jimmy Buffett’s Margaritaville, and Ben & Jerry’s (OK, I know for sure that even my non-New-England readers have eaten there before! Half Baked froyo is def an essential part of any visit to Mohegan! I’m really excited to see DJ Chef, a performer who combines two of my true loves, music and food. He spins records and cooks gourmet dishes at the same time! That is talent, my friends. DJ Chef and one of Jeff’s least favorite people, Guy Fieri. There’s even a fireworks display at 9:30PM on Saturday, but Jeff and I will be gone by then (I’ll be at home hanging with my just-arrived-to-CT best blend Heather…yay!) Still, our afternoon at Mohegan is sure to be fun and delicious, and I can’t wait to share it with you all via Twitter during the event, as well as here on the blog afterward. 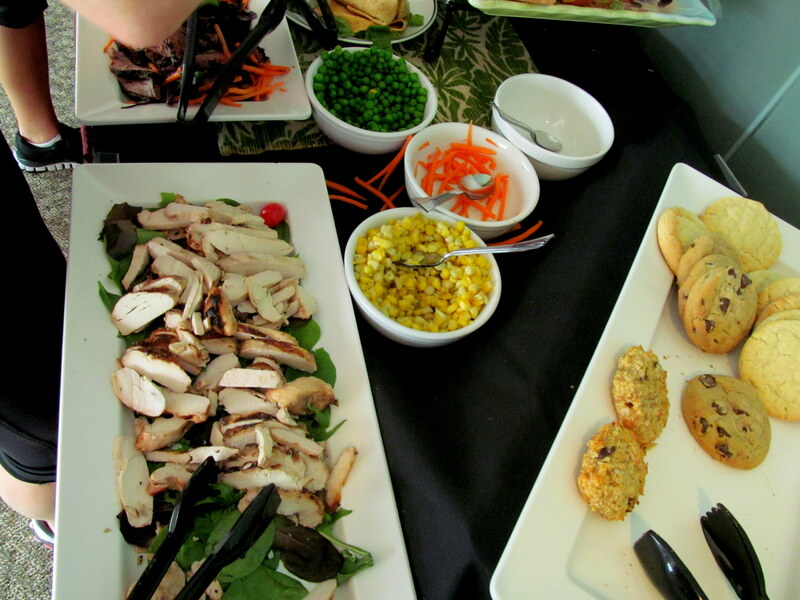 Have you ever been to a Mohegan Sun Casino event, or any kind of BBQ-themed festival? What is your favorite food to eat BBQ-style? That question goes for vegetarians/vegans as well! Tofu anyone?! Take a look at the schedule of events for each day of the Sun BBQ Fest and tell me what part of the event calendar you’d want to check out the most! I’m honestly almost as excited for the farmer’s market as I am for the restaurant food! 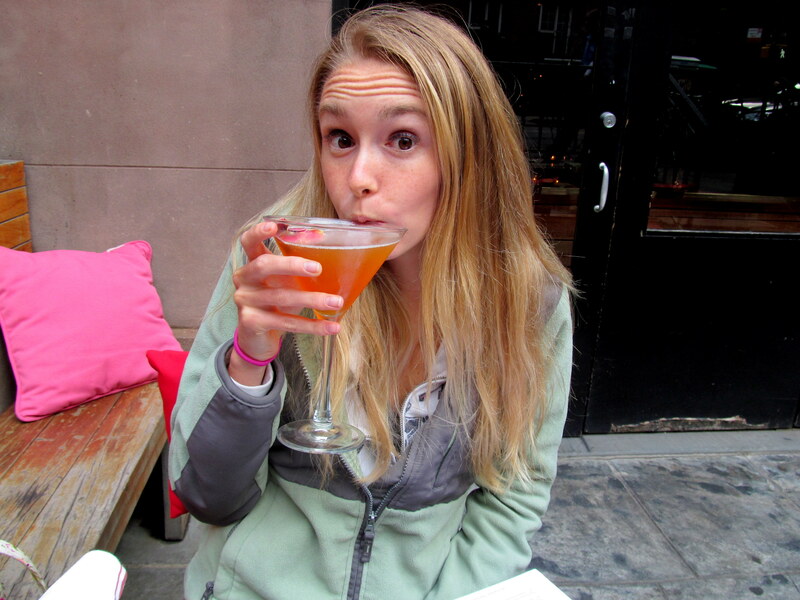 And so my adventures from NYC on Wednesday, 5/9/12 continue! 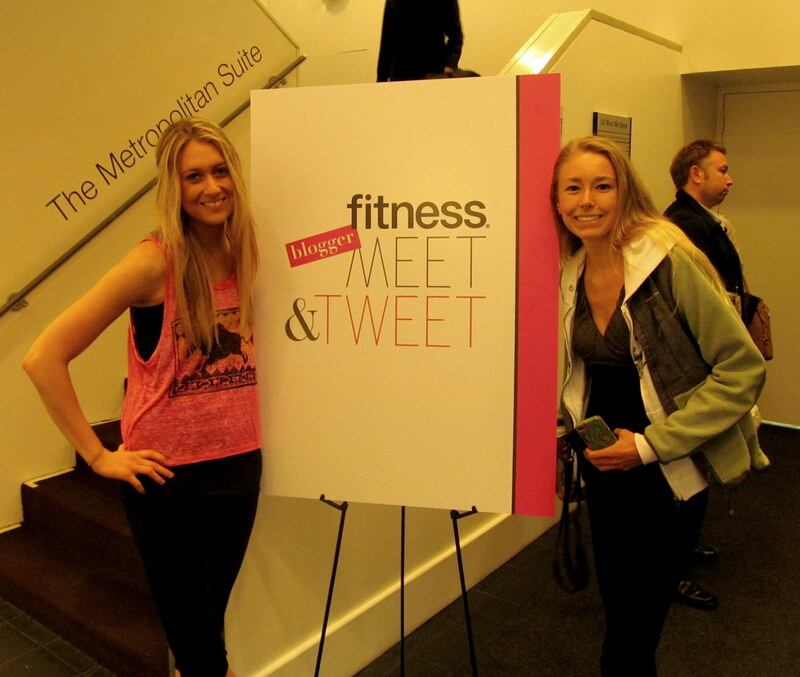 Don’t forget to check out my recaps of the Fitness Magazine Meet & Tweet and Tone It Up event at Oakley in Times Square as well! 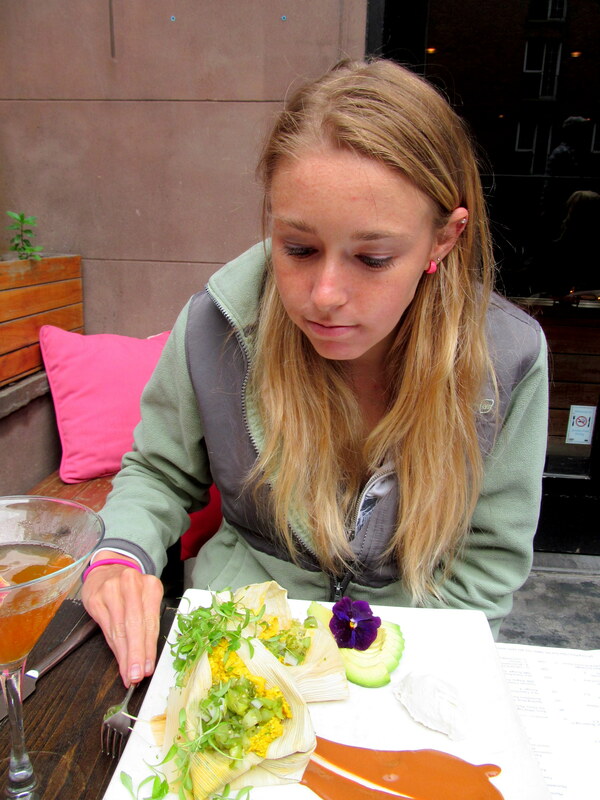 I adore vegan and vegetarian restaurants (despite the fact that I am not either), but they are hard to come by in CT. The only one I have visited near me (It’s Only Natural) is delicious and I’ve been there several times, but I like to try new restaurants…you all know that! So I’m sure you aren’t shocked that I was beyond-words excited when Heather and I realized during the Fitness Magazine Meet & Tweet, while conversing with Danielle over lunch, that one of NYC’s premier raw cuisine restaurants, Pure Food & Wine, was not only right in that very city, but a few blocks from our parking garage! Heather and I took this as SERIOUS destiny. We were starved for dinner after leaving the Tone It Up event in Times Square, so we hailed a cab (that took awhile) to lug our sweaty butts and swag to the restaurant, which had JUST re-opened for dinner (many raw food restaurants close between lunch and dinner because of the work involved in prepping the freshest of food for delivery to customers’ bellies). We started the meal with the patio all to ourselves, and a kind stranger outside offered to snap a photo of us posing in front of the restaurant with all our stuff, like nomads! 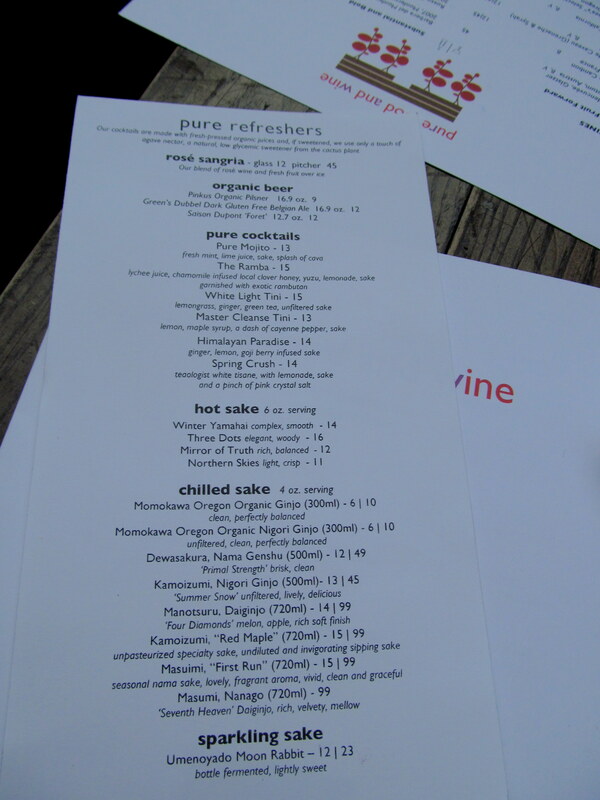 I love my unique cocktails, so I was all over that menu, which featured a line-up of drinks made with specialty sakes. I love me a good sake cocktail! 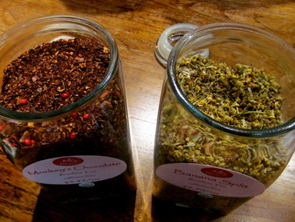 I selected the Himalayan Paradise: ginger, lemon, and goji-berry infused sake. 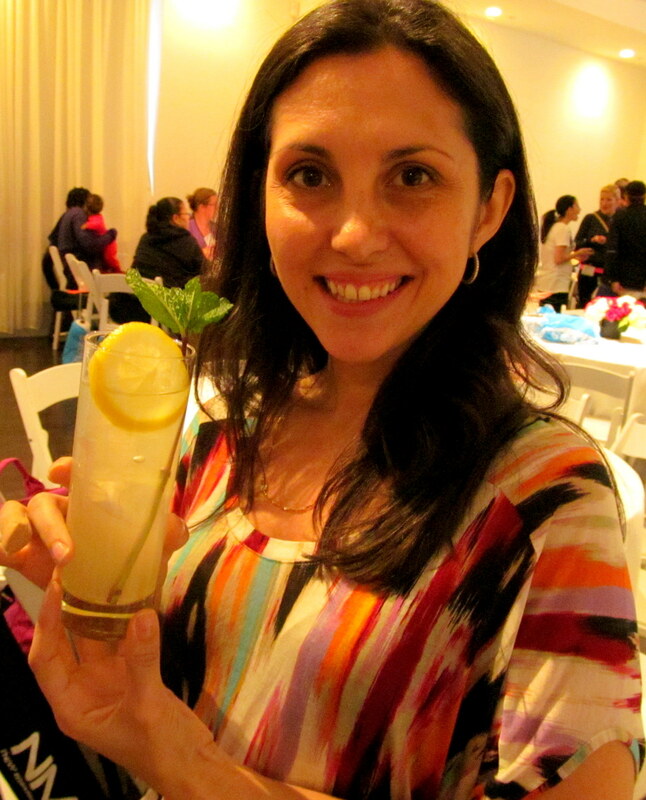 The cocktail was everything I hoped it’d be – and more, since its presentation blew me away. 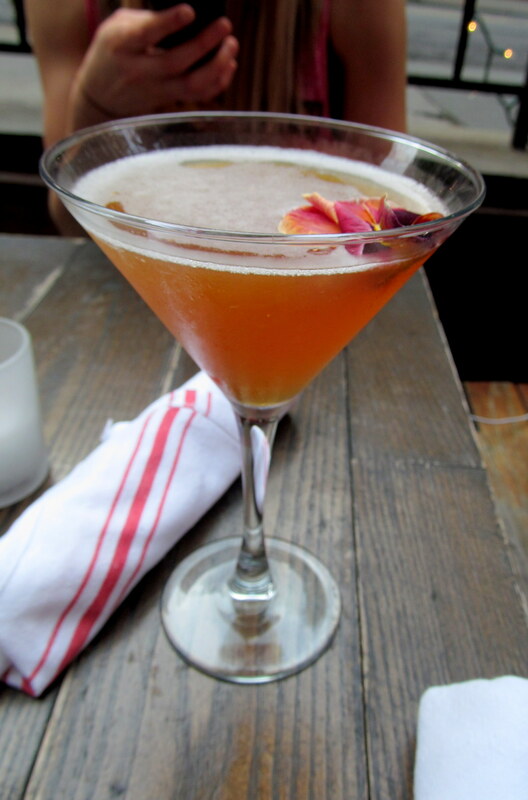 The flower floating in the drink fit perfectly with the peaceful vibe that had already settled over the meal – before we’d even ordered. 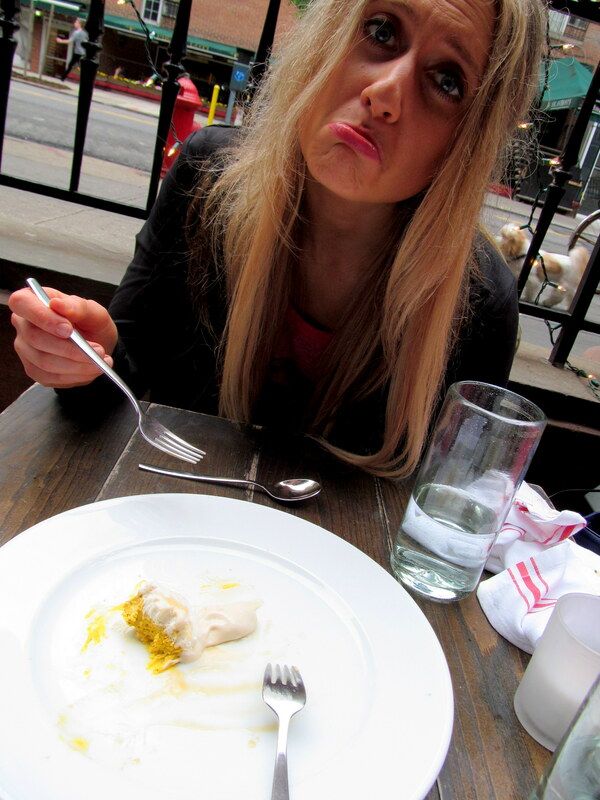 Speaking of which, does anyone else get annoyed when the food at a restaurant comes out TOO quickly? I know it doesn’t happen often, and perhaps since everything at the restaurant was raw it cut down on the time to prepare our meals, but our dinner came out literally about ten minutes after we ordered. I like to take my time with my drink and sip it solo, apart from the food, for a bit before I start pairing it with my plate. I suppose I also value the restaurant experience so much that I want it to last as long as possible, and the sooner the food comes out, the closer the visit is to being over. The fact that dinner was served so quickly wasn’t really a big deal at all though in the scheme of things, and Heather and I settled in to feast. But I’m getting ahead of myself! We had a tough time deciding – I so wish I had enough money and a big enough stomach to order EVERYTHING – but the combination of our helpful waitress and recommendations we’d received earlier in the day from Danielle helped us decide…eventually. Heather chose the Hen of the Woods Tacos el Pastor: smoked guac, hearts of palm, chayote squash, guajillo crema fresca, and pickled onions. She looooves da guac, so this was a choice that was right up her alley. And just look at how beautiful it is! However, it tasted BETTER than it looked. 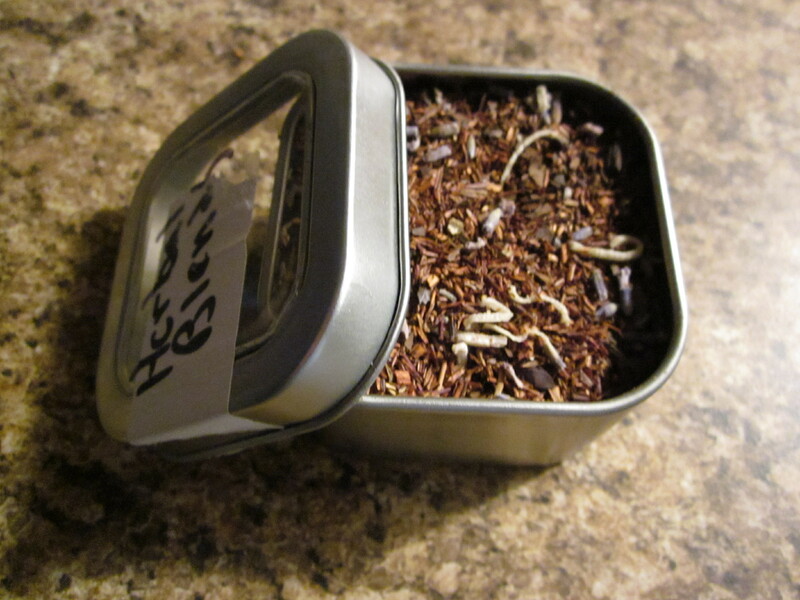 So unique and flavorful. We both took our time with this food, because we didn’t and still don’t know when we’ll have a chance to eat a meal like this again! Getting every last bit of sauce! 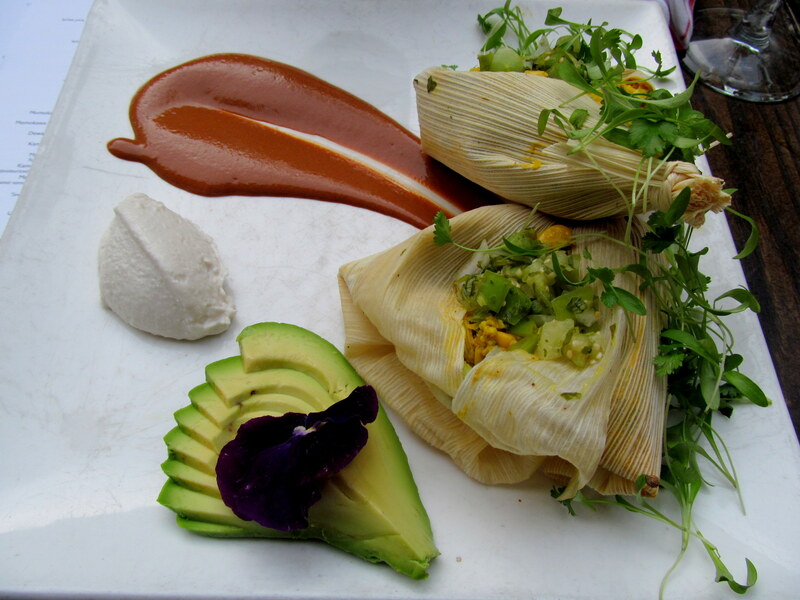 I ordered the Sweet Corn & Cashew Tamales with Chili-Spiced Portabella, which came with salsa verde, cashew coconut sour cream, avocado, and raw cacao mole! Another gorgeous presentation (that incorporated a flower) from the staff of Pure Food & Wine. I had the idea of asking Heather to capture my face at first-bite. At peace with my meal! 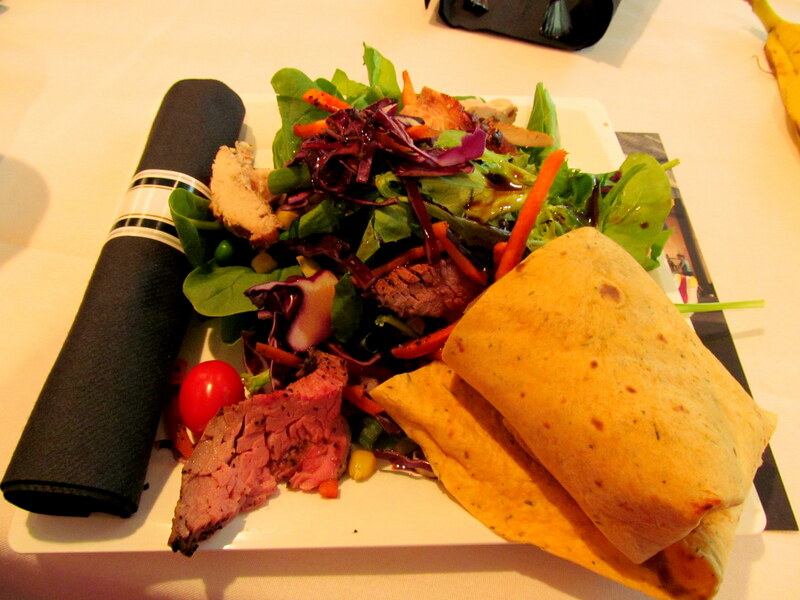 Yup – one of the best meals of my life. I was speechless! And it’s NOT because my mouth was stuffed…I was taking this slow. I didn’t want it to end! But alas, it did! 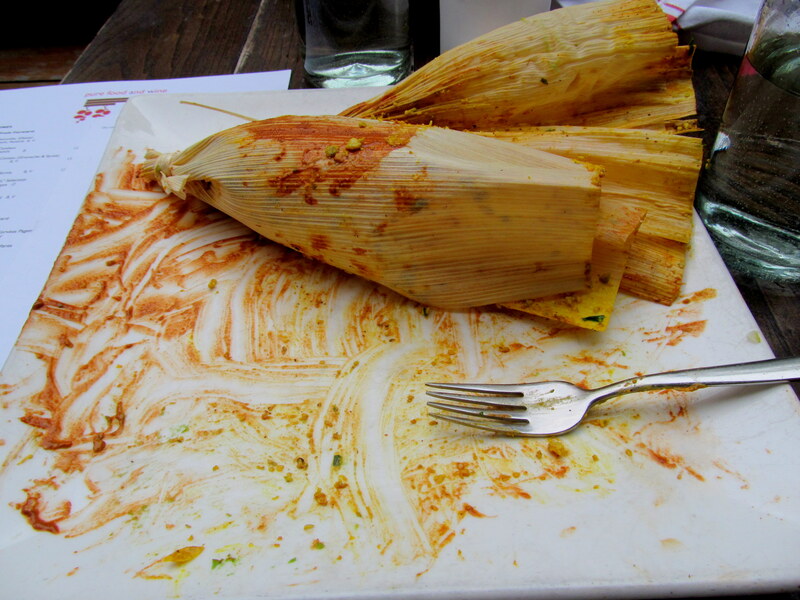 Heather the avocado-lover helped me with that portion, but I dominated the rest, and all that was left was that sad-looking empty tamale. 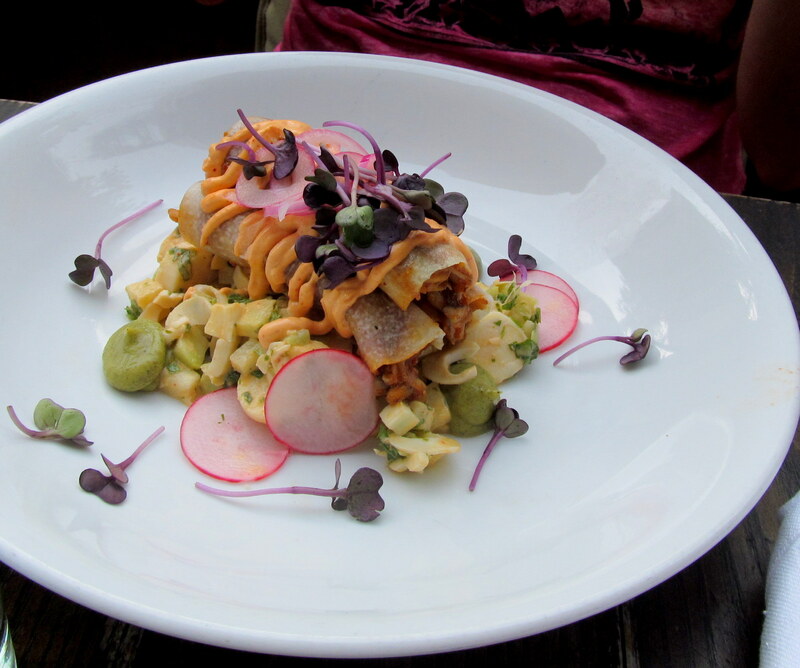 Thanks to Danielle for mentioning this dish to me! I wasn’t sure if I had any room for dessert after dominating my main plate, but Heather helped me realize that I definitely needed to live in the NYC-moment, because I don’t visit the city or restaurants like this every day! So, we ordered something VERY special. It was the last day the seasonal pumpkin cheesecake would be on the menu, so that made our decision a bit easier. This dessert induced plenty of inappropriate-sounding moans and groans from both of us! There actually was NO pumpkin in it. 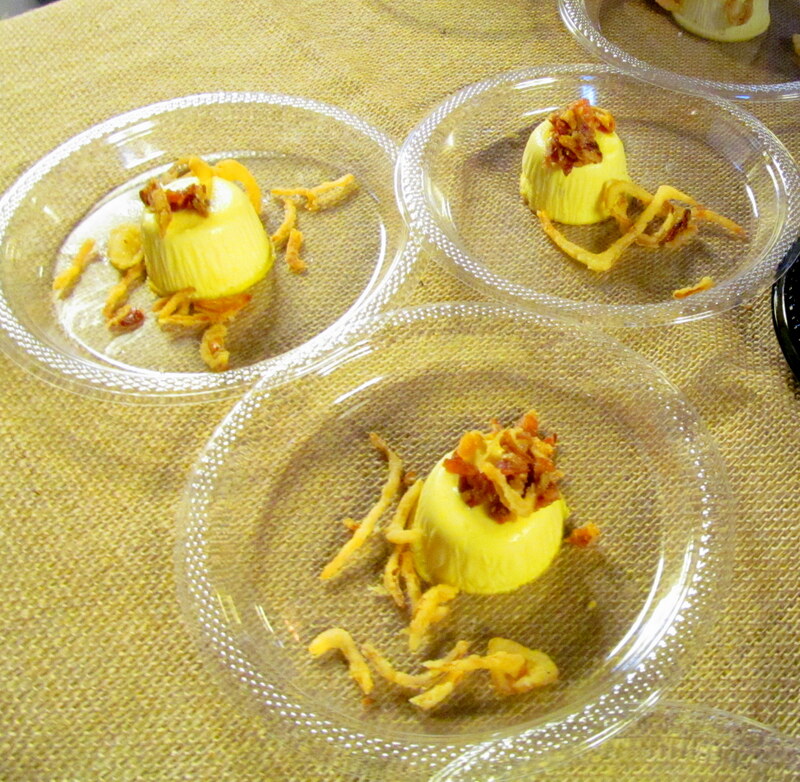 Instead, the “body” of the cheesecake was composed of a squash and carrot puree. 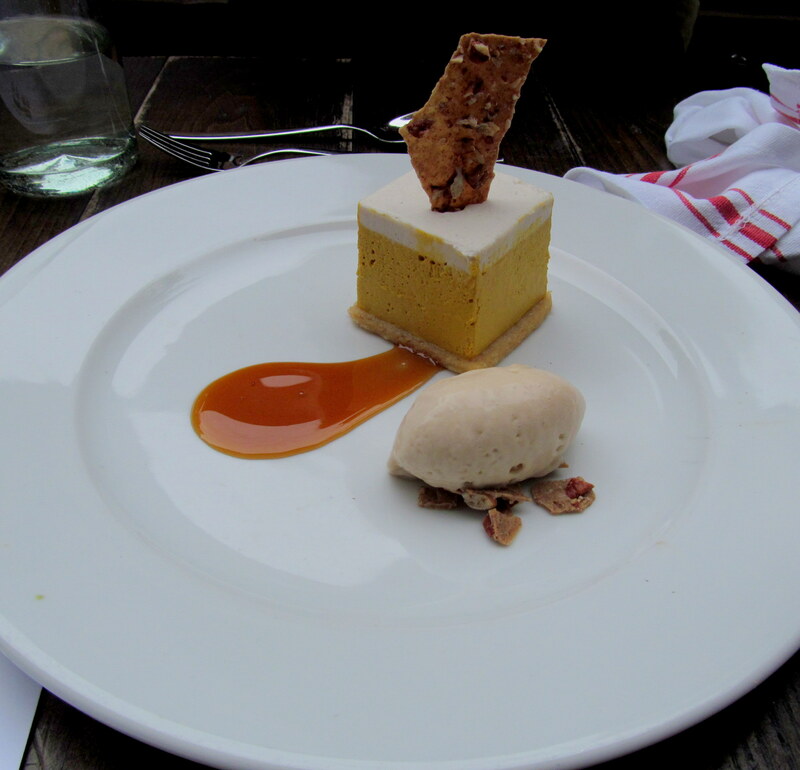 The crust was almond meal and the ice cream was of the cashew variety…I got my fill of cashew “dairy” at this meal and loved every bite! I wish I could remember specifically what the syrup, icing, and crispy cookie were made of, but let’s just say it was something akin to puppies and rainbows and all kinds of other wonderful things. 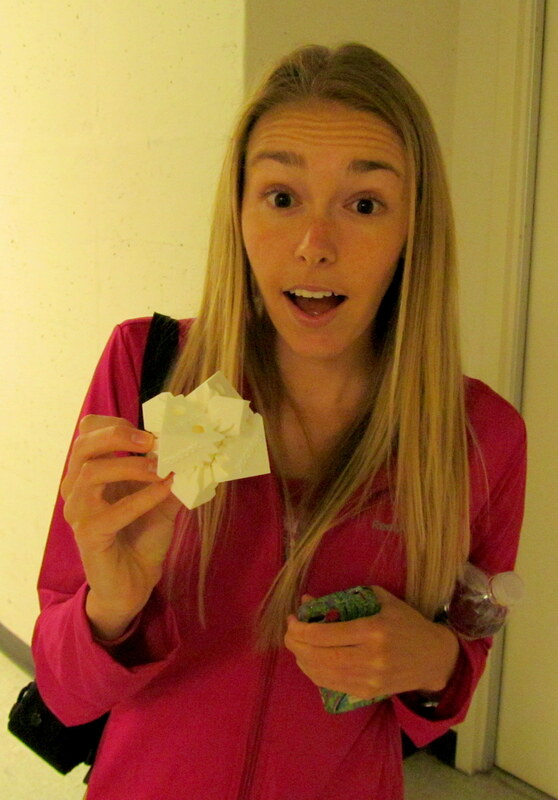 I gave Heather the last bite. 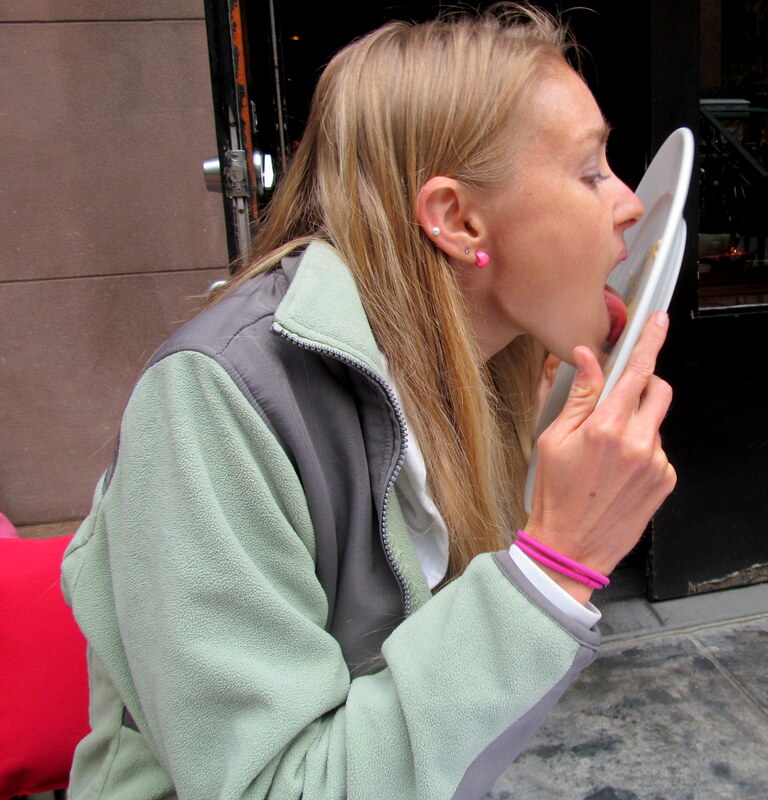 In exchange, she let me lick the plate. That’s what foodie friends are for! Sad that it’s the last bite! 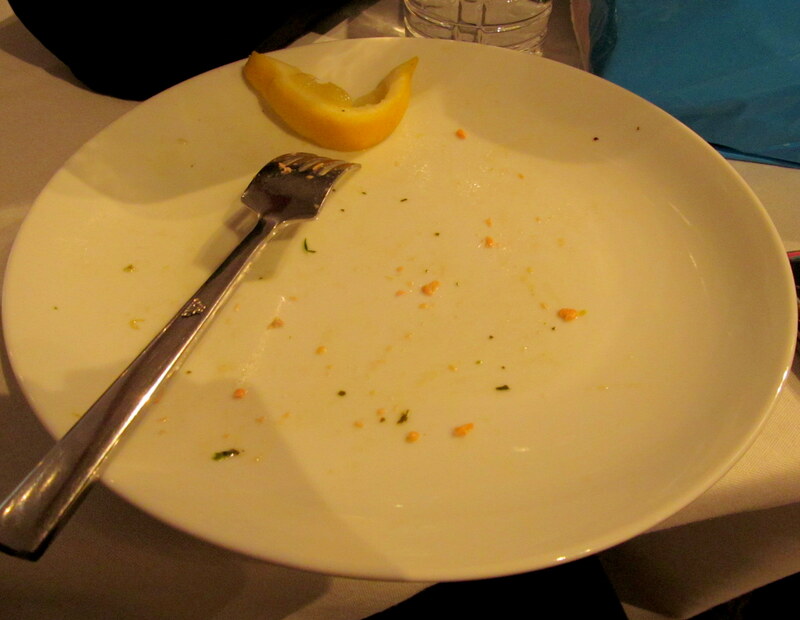 We were so, so very sad when the meal came to an end, but our bellies, bodies, and hearts were certainly pleased. Love the way the check was “served”! 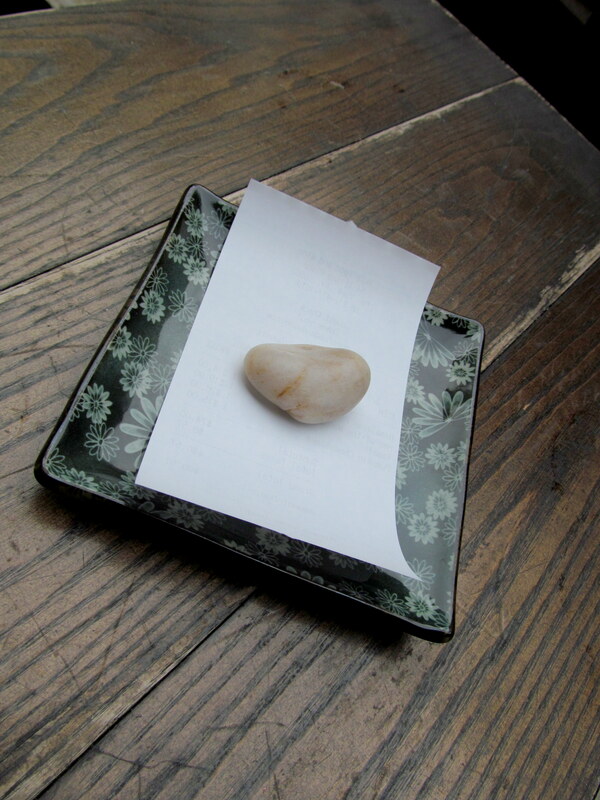 Since it was such a bloggy day, we left our business cards with the check! Thank you to Pure Food & Wine for providing an unforgettable experience to Heather and I! 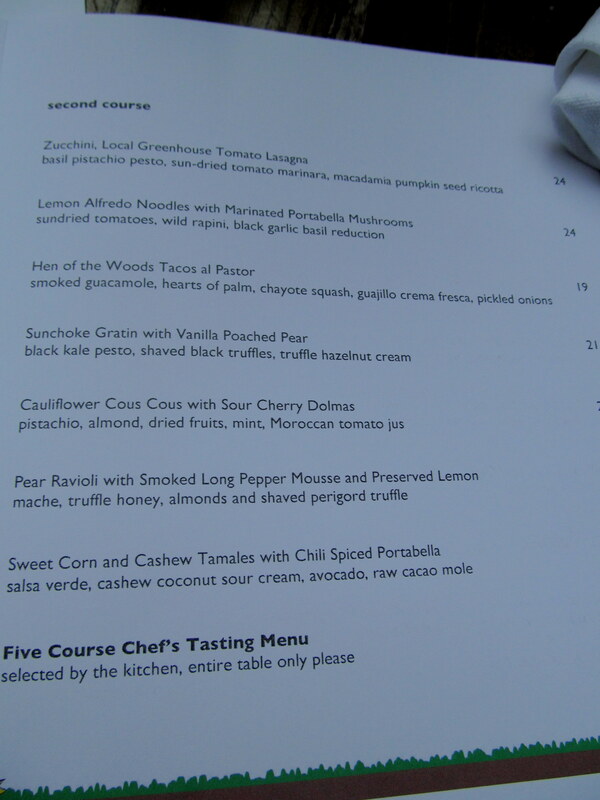 The restaurant surpassed our expectations and I only hope we can dine there again some day. 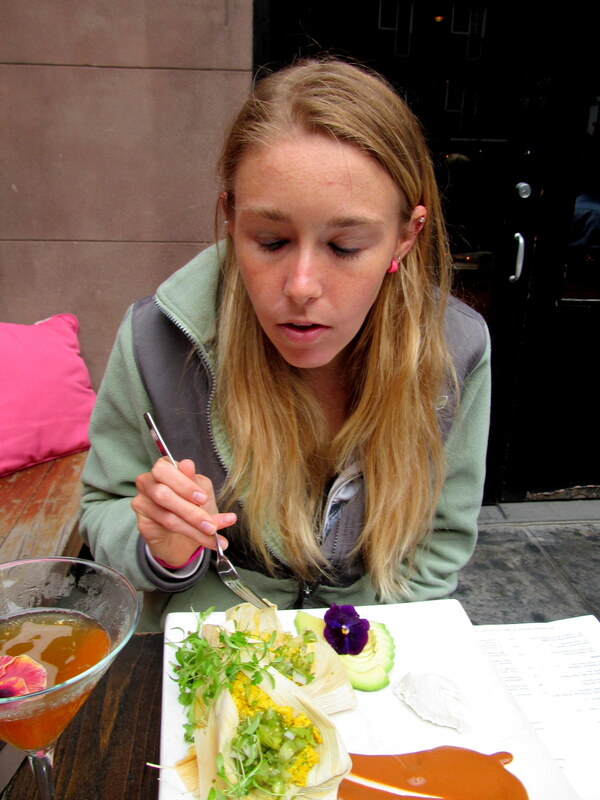 Have you ever been to a raw food restaurant? Have you ever encountered a meal that you can truly say is one of the best you’ve EVER had? 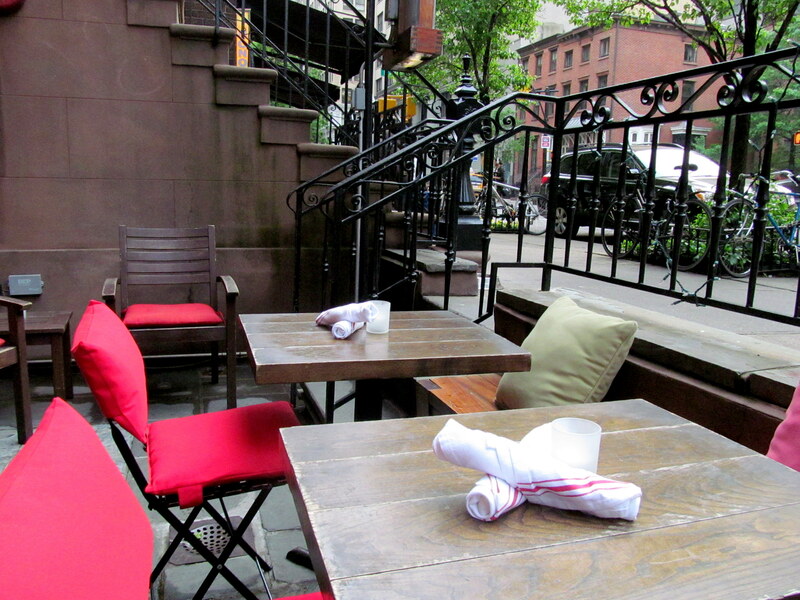 If you’ve ever been to NYC, what’s your favorite restaurant you’ve been to there? Tone It Up in Times Square! Huge thanks to fellow Fitfluential Ambassador Carissa for featuring me on her and her husband’s blog, Fit2Flex, as part of their “5 Questions With…” series! Check out my answer to her five questions here! 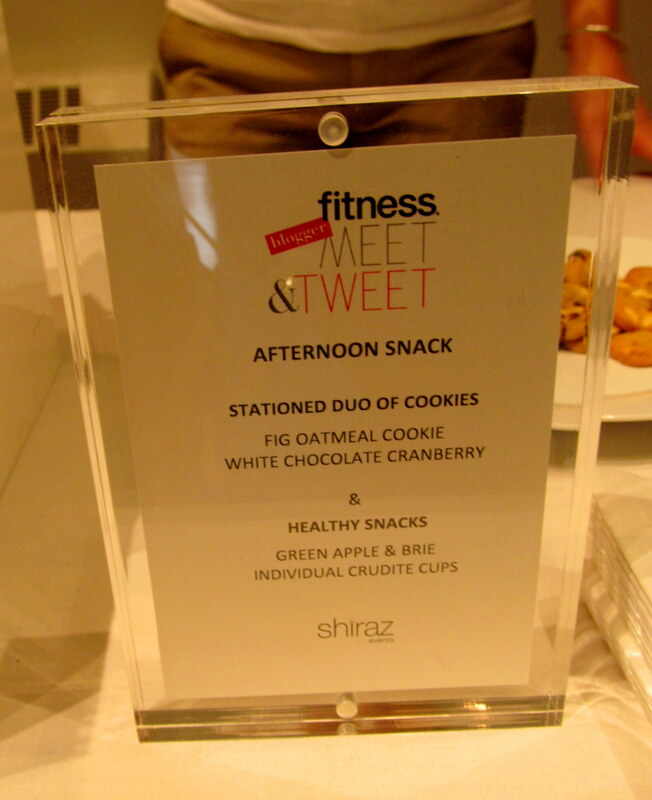 In the Meet & Tweet recap, I mentioned that after our time at Fitness Magazine HQ, Heather, Bess, and I trekked ourselves and our swag (commence viewing of silly vlog by Heather here) through the streets of NYC to the Oakley Store in Times Square for an event that meant a lot to my two blends – the Self Magazine Tone It Up Meet-Up! The event didn’t disappoint! We arrived early enough (among the first 50 guests) to be gifted with more swag. And how appropriate for the event to be held in the Oakley Store, after we’d just received a pair of their fabulous new active wear sunglasses! 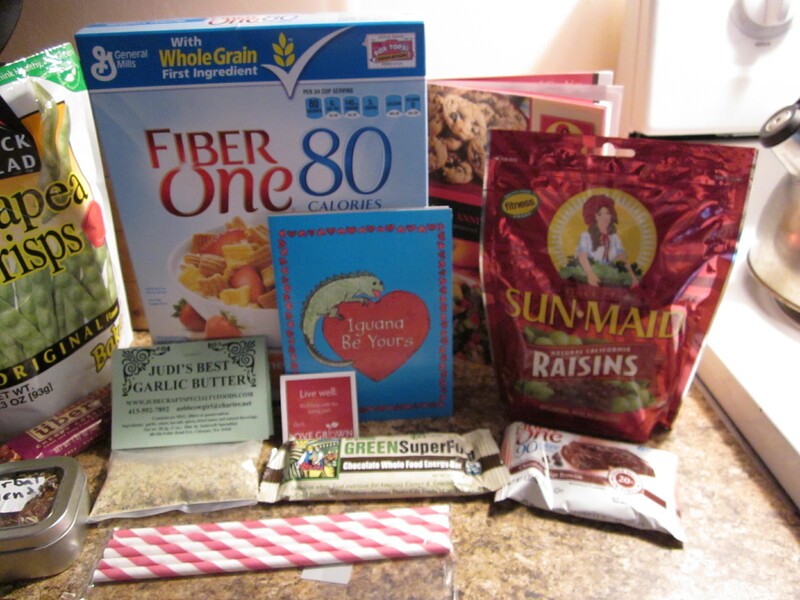 In our gift bags we found a $10 Oakley gift card, a copy of SELF, an Oakley towel and reusable water bottle, TIU’s Perfect Fit Protein Powder (not a user of powders so I gave mine to Heather), and best of all, a copy of their much-raved about Beach Babe DVD! Heather, Bess, and the rest of the TIU ladies I’ve met through blogging just LOVE these quick and efficient workouts. I’ve already tried HIIT the Beach, Long & Lean, and the abs segment. I really like how I can just pick segments and put them together based on what I’m feeling each day. I’m taking this DVD with me on a trip this coming weekend for potential hotel room workouts…and will also be using it this fall, once my night classes start back up, to get in quick morning sweats that will replace my usual evening gym trips! Heather shows off her DVD – I love this pic! 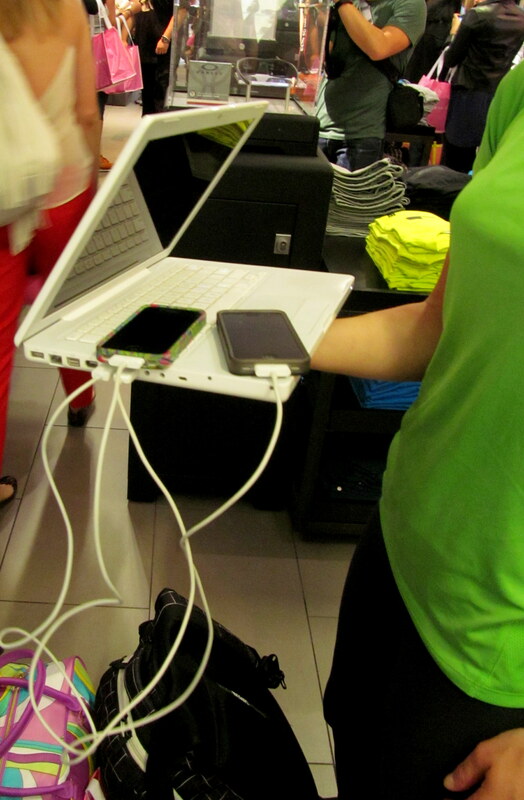 Our electronics were dying slow painful deaths, and Mattie had the brilliant idea to bust out her Mac and turn it into a portable iPhone charging station. Desperate times, desperate bloggers. The event progressed very smoothly and in what seemed like not much time at all, we were at the front of the line and just moments from meeting Karena (in love with that spelling of that name, by the way) and Katrina. Heather met the girls first, which seemed appropriate to me given the fact that they and their program have played such a huge part in her life, both personally and blog-related. Seeing her meet them was so much fun for me because I could tell just how much the chance meant to her! Sappy moment, but I just love seeing people happy. The TIU trainers seemed to be all about the hugs! Cannot help but notice some similarity in arm tone-age there! Go Heather! 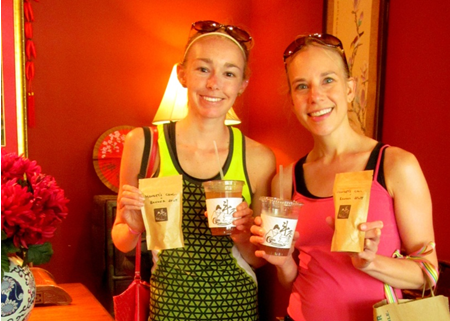 Karena and Katrina even featured Heather and a recipe she made with the Perfect Fit Protein Powder on the TIU Facebook page after the event! Next up it was time for Bess to meet the trainers! Bess is also a huge part of the Tone It Up team. Mattie got some q-time in with the girls as well! Then it was my turn! I have to say I was in awe of these two women. They are so, so beautiful and really radiated warmth and what I can only call a sort of “light”. And no, it wasn’t the camera flashes going off! How much do you love the pink carpet?! Such a fun event to attend…I felt so swept up in the atmosphere of the city and the opportunities that I felt were awaiting me around every corner. I didn’t want the day to end. And luckily, it wasn’t going to! Next up on the agenda for Heather and I was a meal of a lifetime at Pure Food & Wine, which as fate would have it, was right next to where our car was parked. 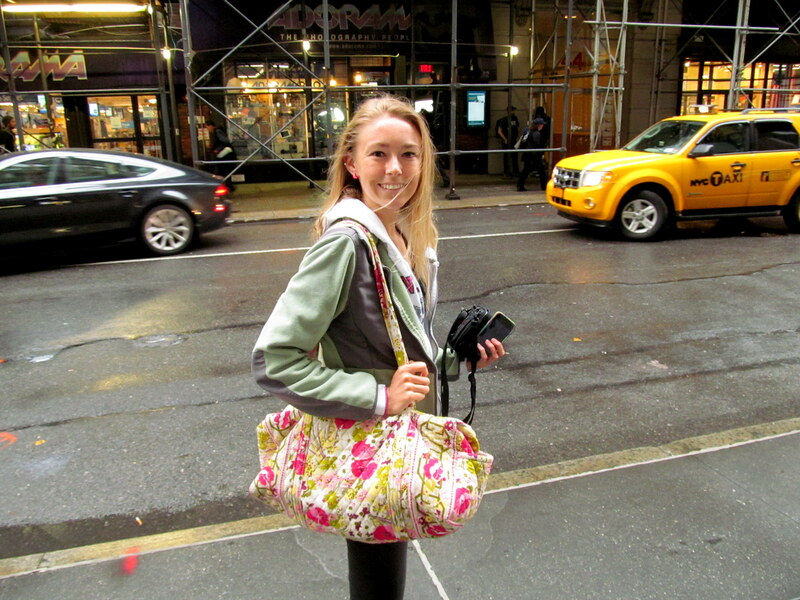 So, she and I hopped in a taxi (no more swag-lugging for these girls), and set off for some clean eats…to be continued! 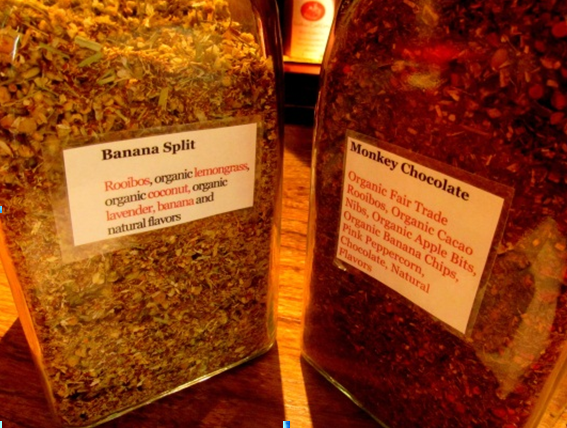 Have you ever heard of Tone It Up and/or tried any of their workouts or recipes? 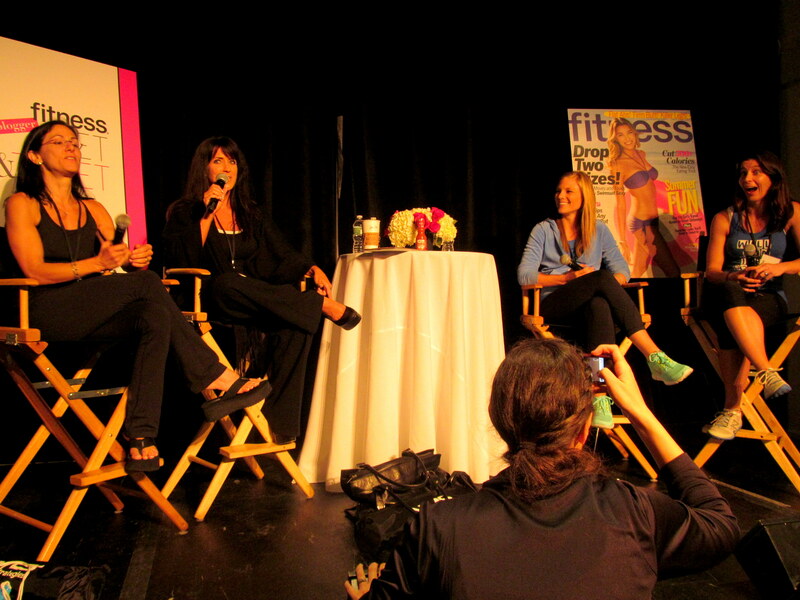 Have you ever met a “celebrity” of the fitness world in person? What was it like? 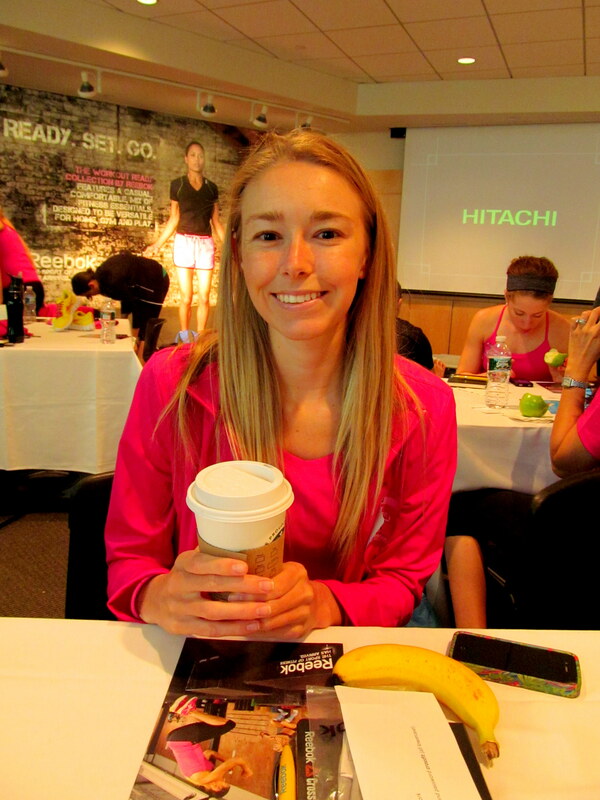 If you didn’t get a chance to see my recap of my day at Reebok World Headquarters with FitFluential, you can check it out here! 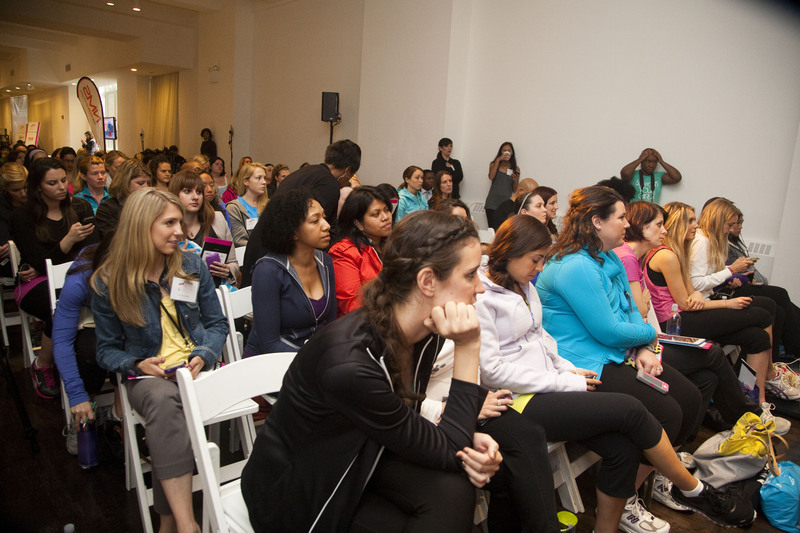 I’m a sucker for all things fashion-related, even when it comes to working out. 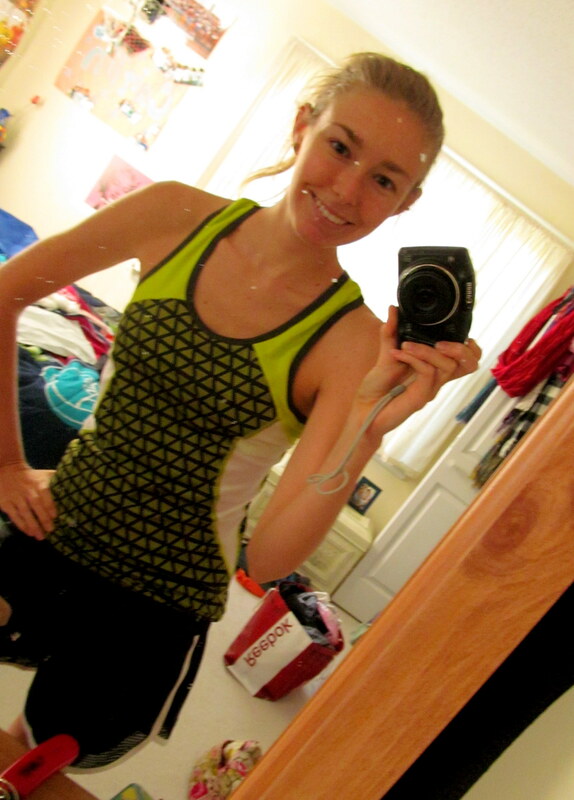 Nothing gets me going at the gym like a cute new workout top or some sweet yoga pants. I swear, my performance in a group fitness class is improved when I wear a piece for the first time. It’s for that reason that I save the first-time wear of any workout gear for a day when I plan to take a group fitness class. Yes, I know it’s all mental, but I accept it and just let myself get that extra push from feeling extra-fly. I adore pink workout gear. Call me Gym Barbie, I don’t care. I’ll take it as a compliment. 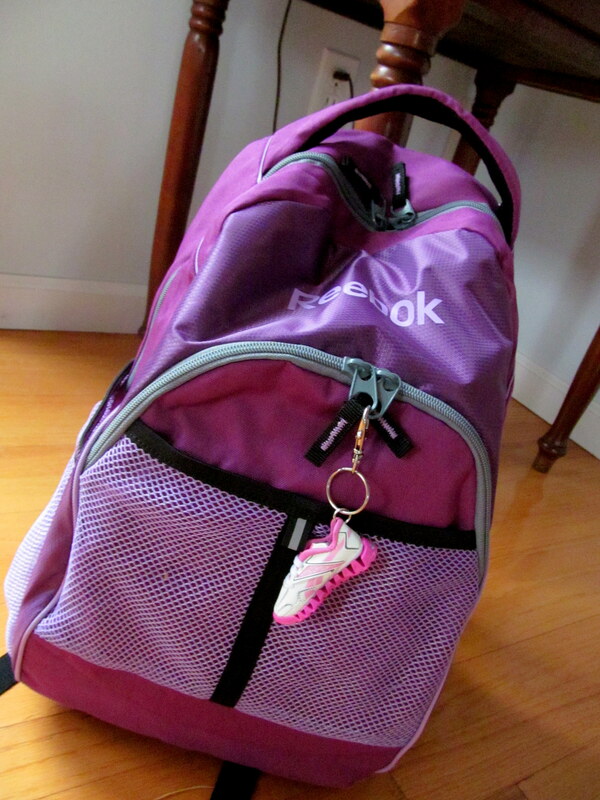 I was so happy to receive the above Reebok backpack in PINK! I was also squealing with delight over the keychain. After the Reebok event, during which I toted my backpack-adorned-with-keychain with pride, I wasted no time transferring the tiny sneaker to my car keys. I don’t use the backpack everyday, but I do use those keys, and I want to be looking at that sneaker allllll the time. 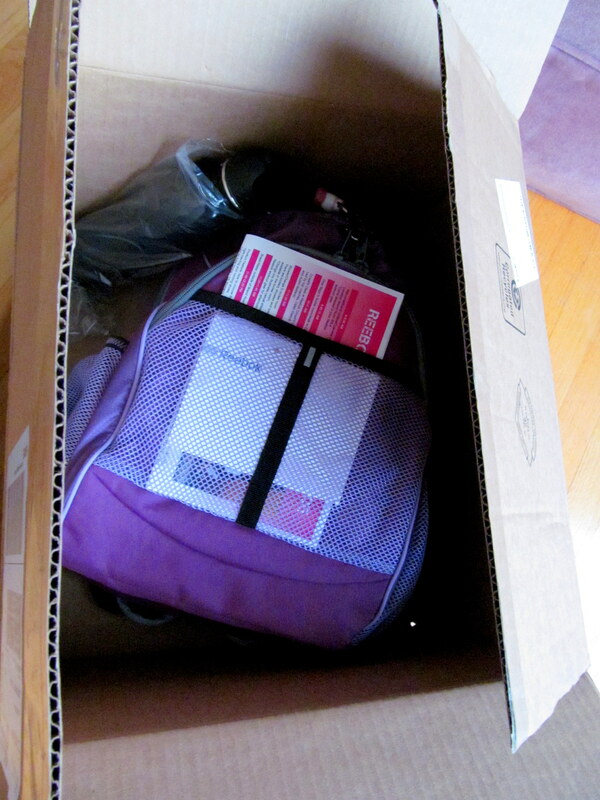 It even came with tissue paper in it like a full-size shoe. Adorable. I opened up the backpack and, cheesy as it sounds, couldn’t believe my eyes. I should stop here and add that upon unpacking my loot and trying on the clothing, I discovered that some of it was too big. After mentioning this to Danielle Liss, who forwarded my request for new sizes to Reebok, I received a package with replacement sizes just a few days later. Now that is service! So kind of Reebok to replace the clothing with sizes that would fit me better – that way, I was able to give their clothes the most accurate test-drives possible. 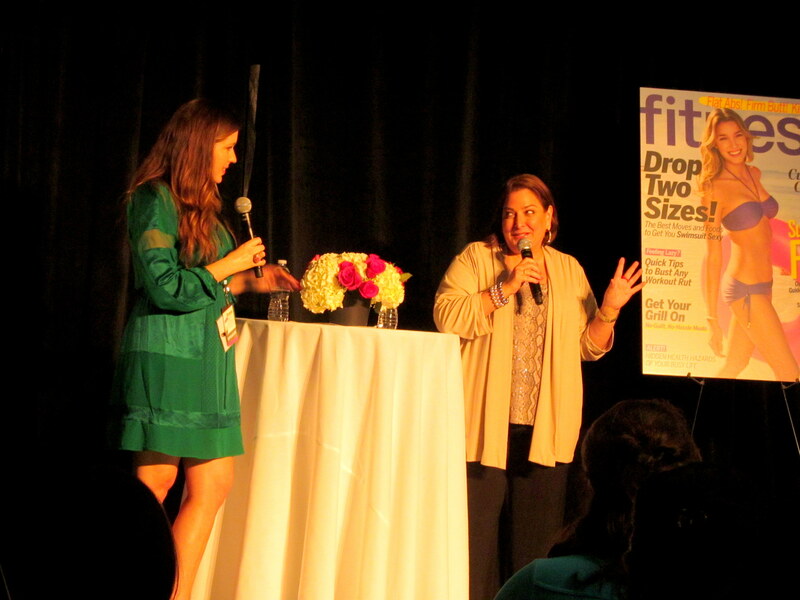 I simply brought my larger sizes with me to HQ the day of the event and handed them off to Johnice Graham of the Women’s Marketing Team – along with a huge THANK YOU! 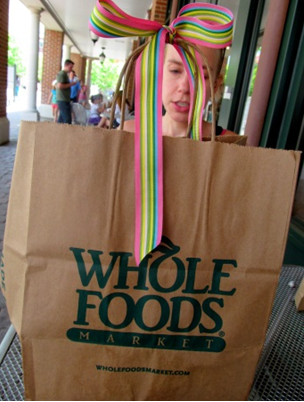 Not just for carrying workout gear! 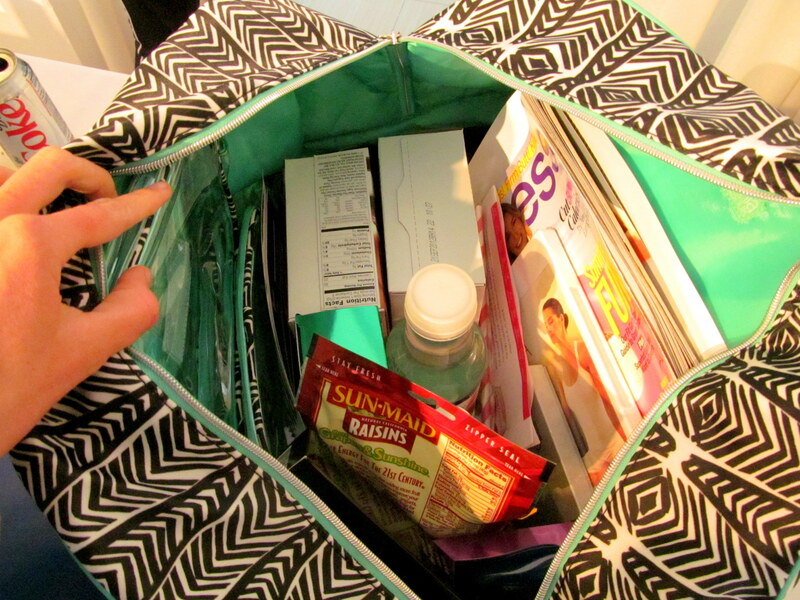 Used my backpack to carry fashion magazines, my camera, snacks, and water to the beach on Saturday. The gear below all fit, though! 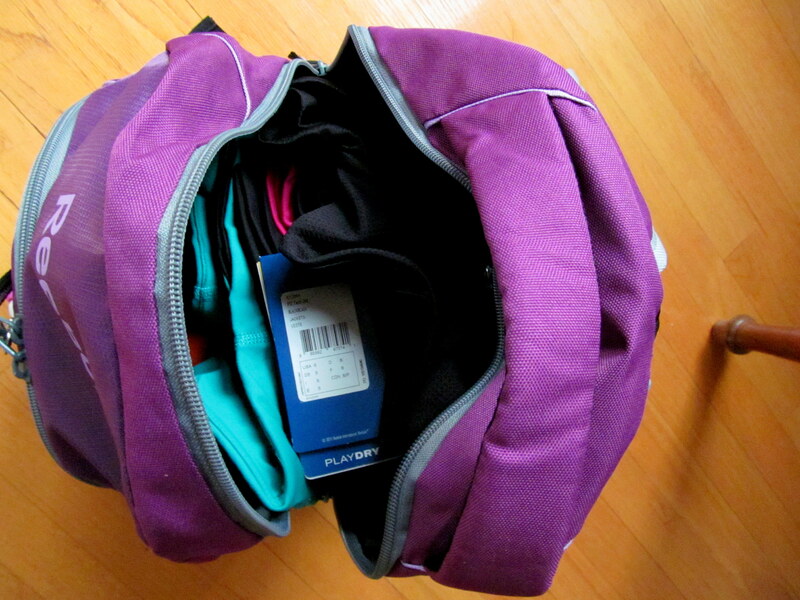 I love the Reebok CrossFit Racebrack Bra with removable inserts (I kept mine in). It’s really comfy and has taken me through a couple workouts by now. It doesn’t ride up either. The socks fit really well too and the material feels really high quality. They don’t ride down and bunch under my heel like workout ankle socks often do. 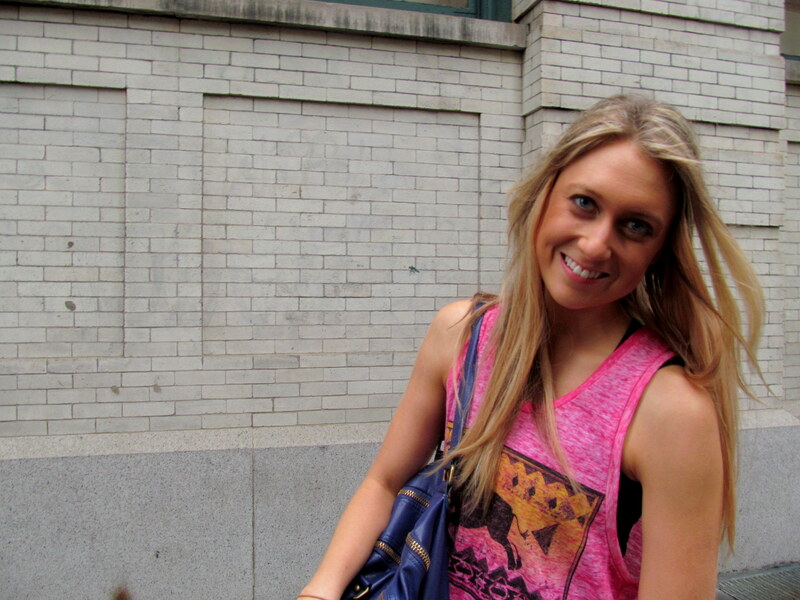 Really like the CrossFit tank with built-in sports bra as well. My girls aren’t in need of too much support, and any girl with a C cup or bigger would probably need a sports bra along with the one attached to the top, but for me the bra included did a good job supporting me through a Tone It Up Beach Babe DVD workout with Heather, which we completed the morning after our day at Reebok. Also enjoyed planking in it while tweeting some #PROOF at the gym last weekend, after a spin class. You may have noticed me wearing the Reebok Crossfit headband that I received at the event in the picture of my TIU outfit as well. I considered the TIU HIIT the Beach cardio segment of the Beach Babe DVD to be the ultimate test because of the plyometrics involved. I had high hopes that the band wouldn’t come off due to the gel lining on its interior. Unfortunately almost halfway through the workout, my band slipped off my head. Heather’s made it through the HIIT workout as well as the ab and stretch segments, though it was close to the “edge” by the end there. After taking it through a test drive during spin back home though, I found that it did not give me any trouble, since spin doesn’t involve jumping around. 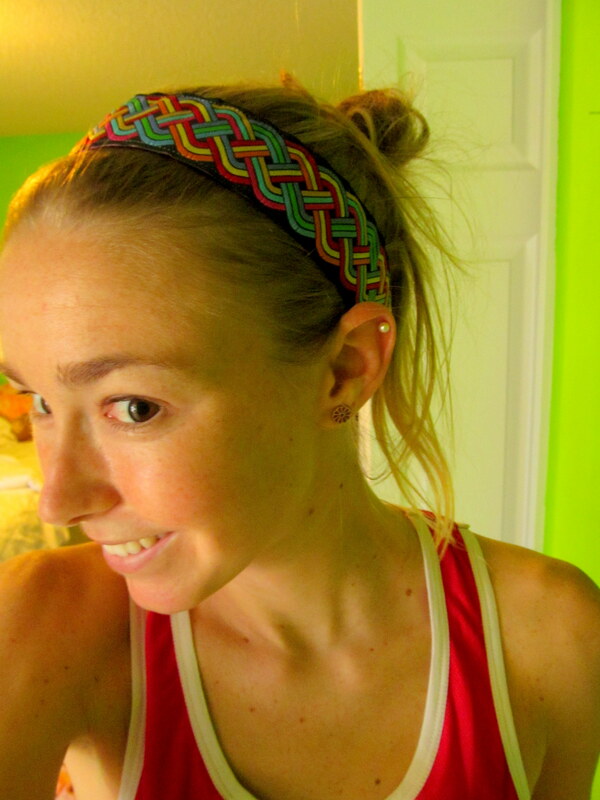 I plan to definitely rock this headband during my non-Step or HIIT workouts, but just like all other workout headbands I’ve tried, it cannot survive one of my dance or plyo-based group fitness classes! Band still in place after spin class! Ugh gross look. I even threw on a cardigan after doing the TIU workout with Heather, though I know it didn’t match the workout gear at ALL, and wore it her favorite local cafe, Wildflour (more to come on that later), to do some blogging, coffee drinking, and scone consuming. I was quite comfy! And Heather was quite fashionable. 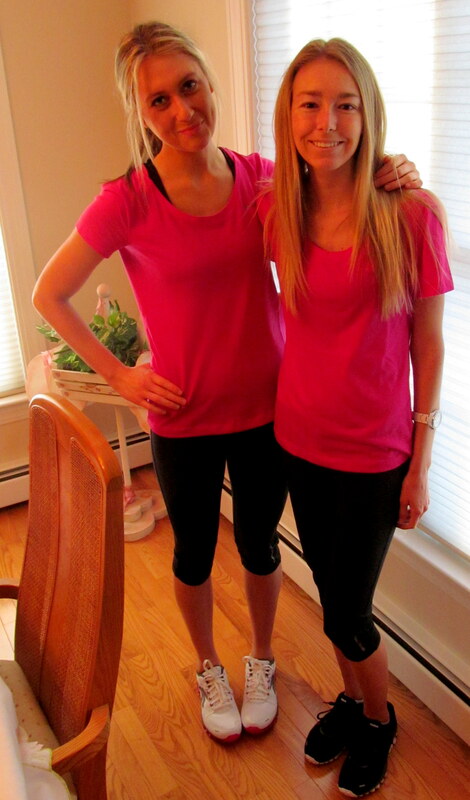 Heather and I decided to go all matchy-matchy for the visit to Reebok HQ (are you at all surprised?) 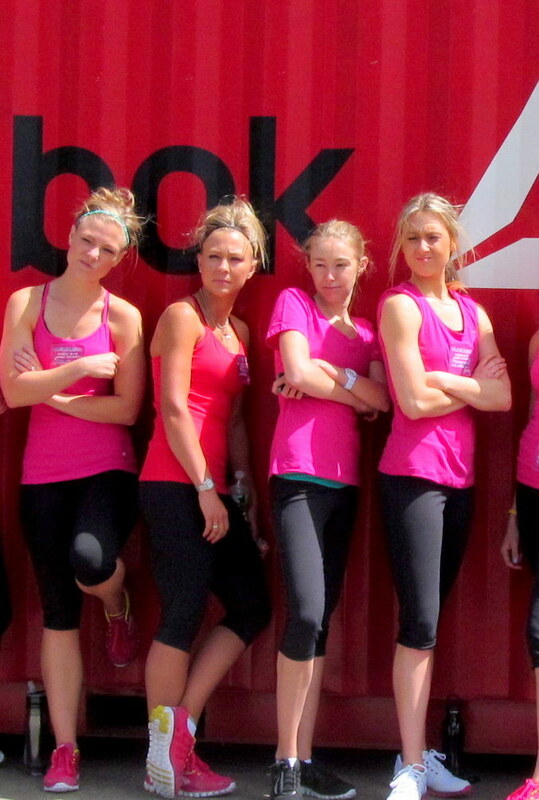 and wear our Reebok Essential Short Sleeve Tees and Crossfit capris. 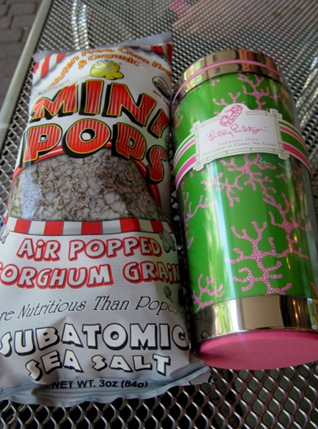 I liked the pink and green color combo. The tee is not something I would usually wear to the gym. If I wear a tee, I prefer either a fun, more laid-back style – literally a very plain t-shirt shape, not the slightly fitted shape of the below tee – or a very form-fitted top. This style was a bit too in-between for me. However, I can’t say it wasn’t comfortable – the fabric was soft and handled a of day sweat from two workouts and trekking around HQ very well. The slightly-fitted style is also one that I know many women do enjoy (for example, my mom prefers it), so I don’t doubt that it has appeal. Being a goof at the gym in the pink tee. The capris were pretty comfortable, though like the headband, they did not hold up (literally) during an HIIT workout. I don’t think that was the fault of the pants’ quality though, I think it was the fault of the fit. Most bloggers wearing them during the event were having no trouble, but I just felt like I had to readjust the waist several times during each cardio-workout-centric portion of our day. Yet again, I wore the capris to a spin class AKA not much jumping around, and they felt much better! 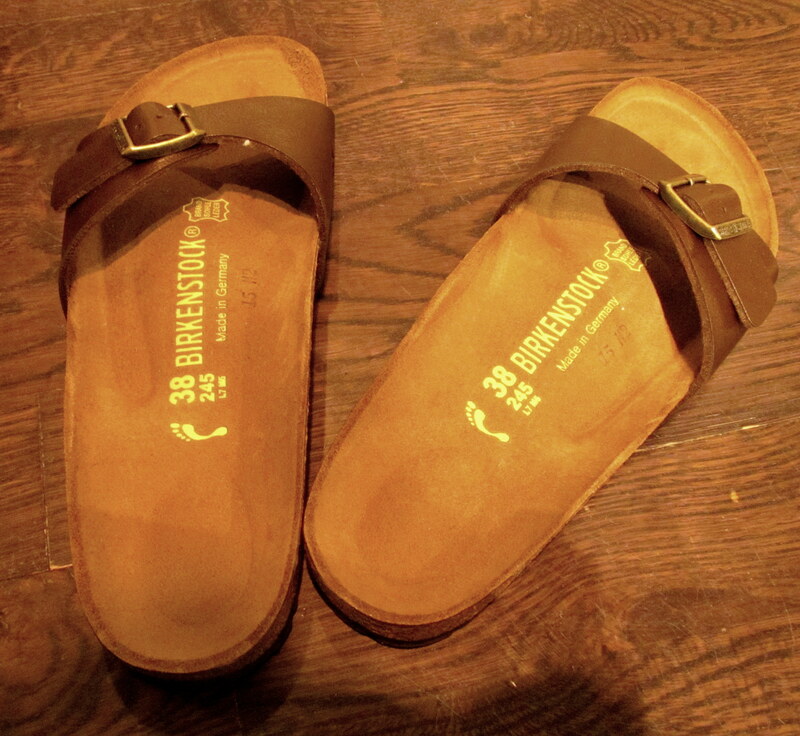 I’m wearing them in the photo below. 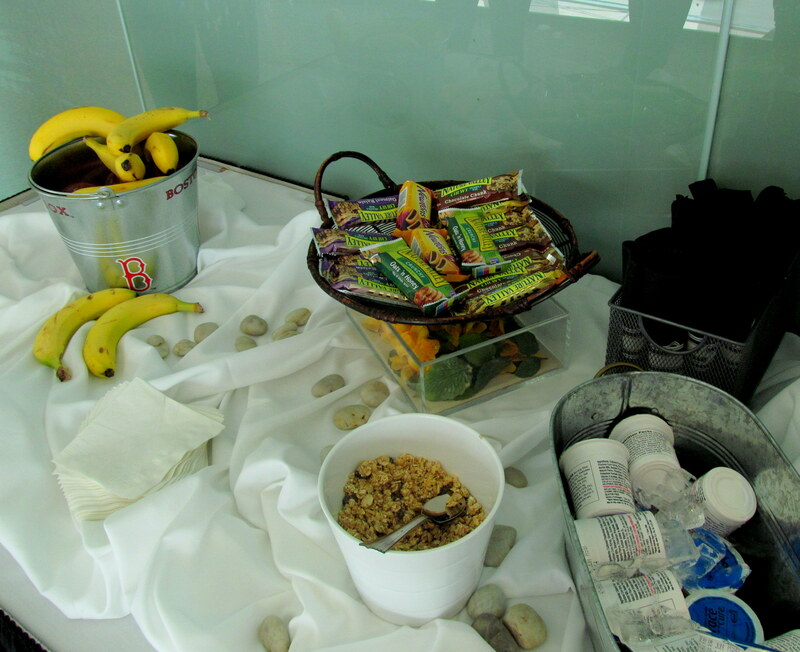 After the Crossfit class we did with Reebok’s head coaches, we bloggers were pleasantly surprised to find Reebok drawstring bags waiting for us at the tables that had been set up for our lunch and focus groups. MORE workout gear?! We couldn’t believe it! Heather and I felt like the luckiest girls in the world. Wore these to my favorite high-intensity Step class. The above shorts were my first foray into the world of workout bottoms with built-in underwear-like liners. I wasn’t sure if these liners are meant to be a sub for undies or not, so I still wore them (TMI?) underneath the shorts. However, having two “underwear” layers didn’t bother me at all and the shorts didn’t inch their way up over my hips like I’ve found happens with cheaper brands (I like to wear my workout shorts resting around my hips, not up around my waist). I really love them! I also received the above outfit in my drawstring bag. 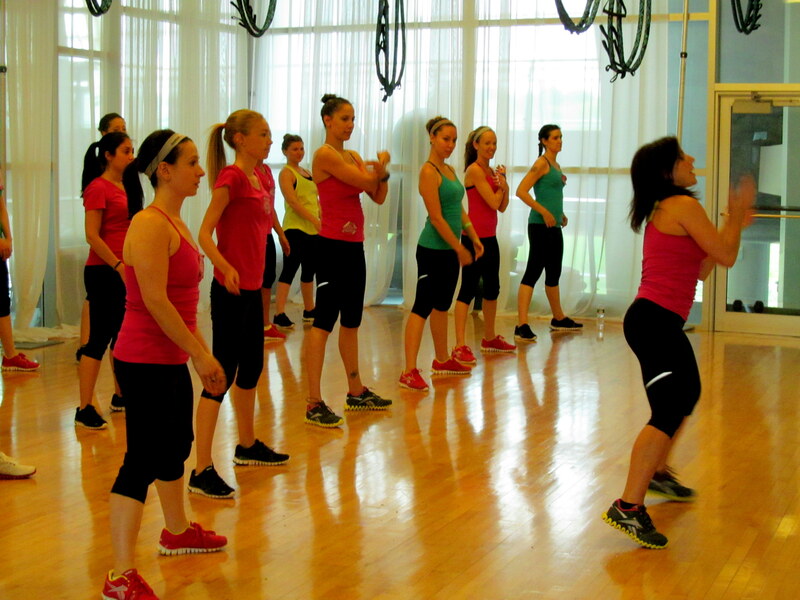 I once again used my gym’s high-intensity Step class to test out a portion of this gear – the Skinny Capris. It’s hard to tell on the website and in the above photo, but the blue on bottom is actually a mesh material that adds a really cute, feminine flair. The top portion also goes over the hips and hugs the stomach at a perfect level of tightness, which I believe is why they named the capris the way they did – they are meant to have a slimming affect through the stomach and hips. I just liked the design because they didn’t fall down at all and stayed in place quite perfectly despite the fact that during the Step class, I was bouncing and kicking all over the place. I haven’t gotten a chance to wear the blue top to a workout yet but it’s the same pink and yellow one Ilyse Baker wore in my cardio dance pics in my recap post, just a different color. These are the shorts I received. 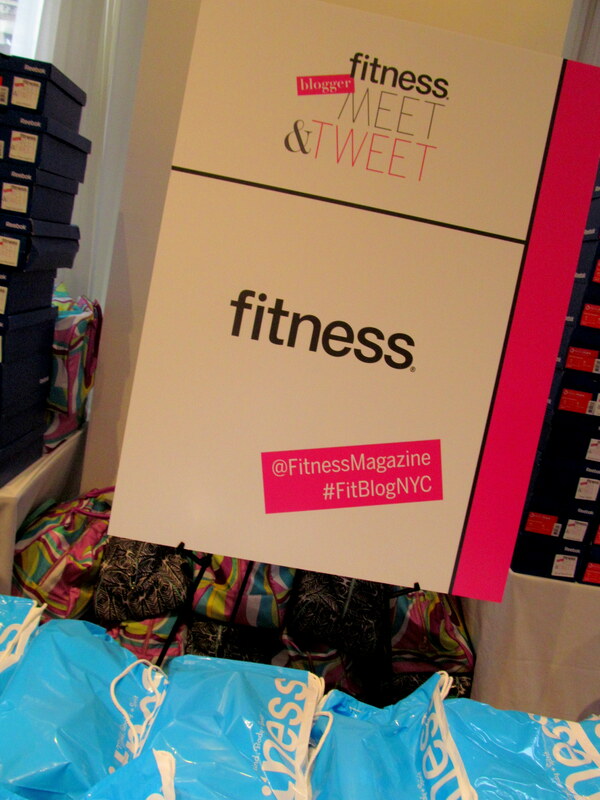 If you read the recap or followed my tweets the day-of the #RBKFITBLOG event itself (shame on you if you didn’t :-P) you may remember hearing that I won a $100 gift card to the Reebok HQ Store during the event’s closing – and everything was already 50% off for us that day. I went a little crazy as a result! I got myself the above tank top in two colors. 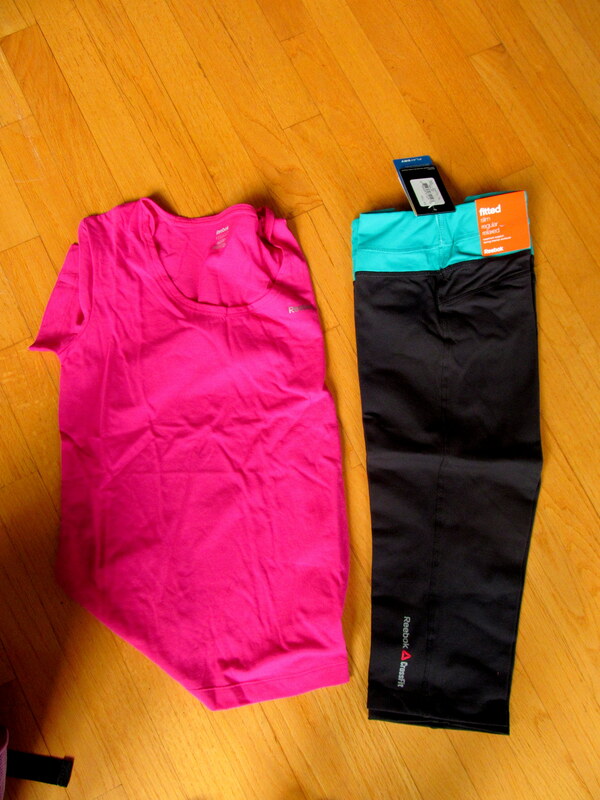 I haven’t worn the pink version yet, but I did wear the other color (see below) to spin and weight-lifting on Sunday. 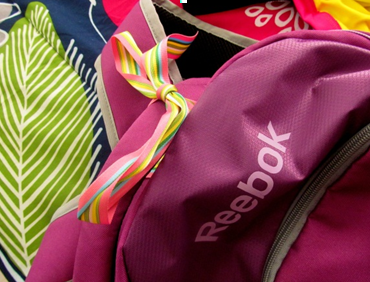 I spy a Reebok shopping bag! So comfortable! The siding is mesh and made the top VERY breathable during a sweaty cardio workout. I know what you’re thinking. This post is about Reebok. WHERE ARE THE SHOES?! 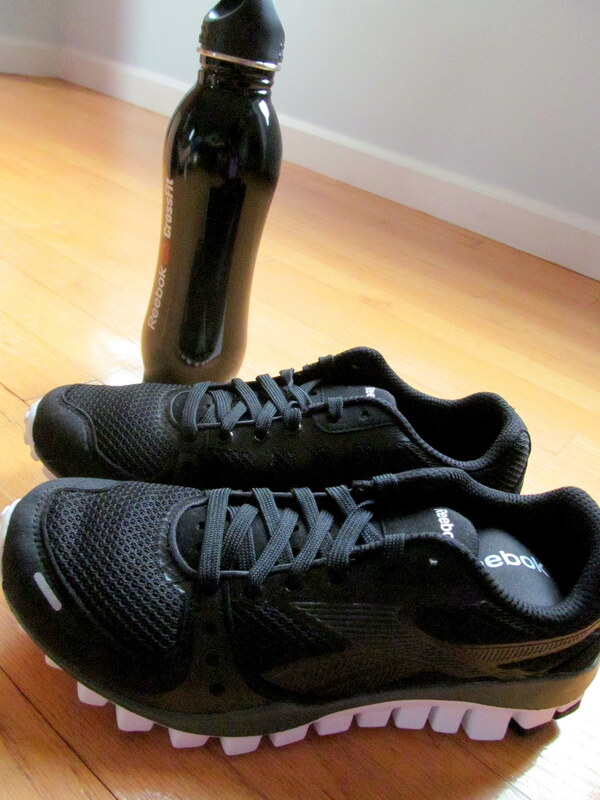 In the package shipped to my home I received the above reusable Crossfit water bottle and RealFlex Transition sneakers. They fit perfectly and I wore them all day to the Fitness Magazine Meet & Tweet. Even for my first time wearing them, they were so flexible, breathable, and comfortable for a full day on my feet. I also wore them during both the Crossfit and cardio dance workouts at Reebok HQ, and am pleased to say that they performed as promised. The RealFlex Transitions are really ideal for an all-around fitness girl like me who likes to constantly switch it up. I may run once in a blue moon, but mostly I’m spinning, lifting, and taking cardio classes. I’ll also do the standard StairMaster fare – you just never know. In fact I often don’t know what I’m doing workout-wise until the afternoon of, so it’s great to have one sneaker I can pack and know it will function for whatever I choose to do once I get to the gym. 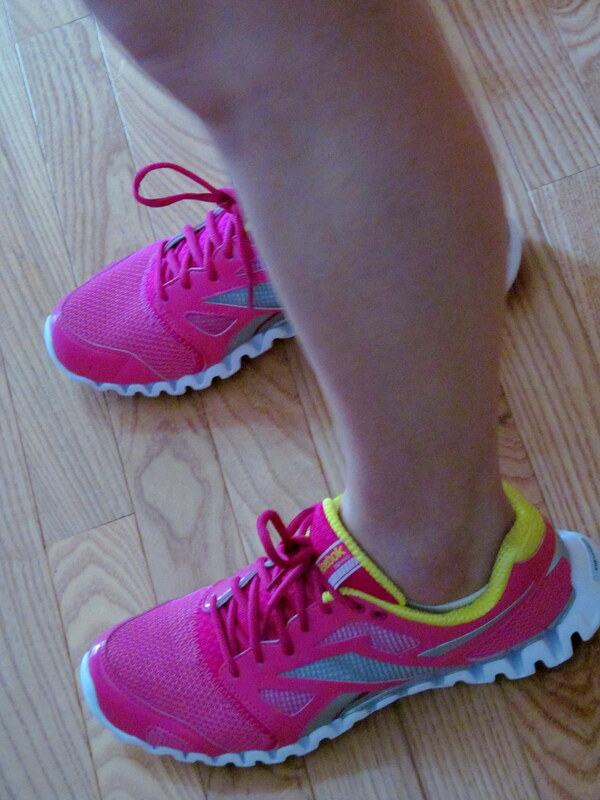 We also received a pair of the RealFlex Transitions in hot pink at the Meet & Tweet. 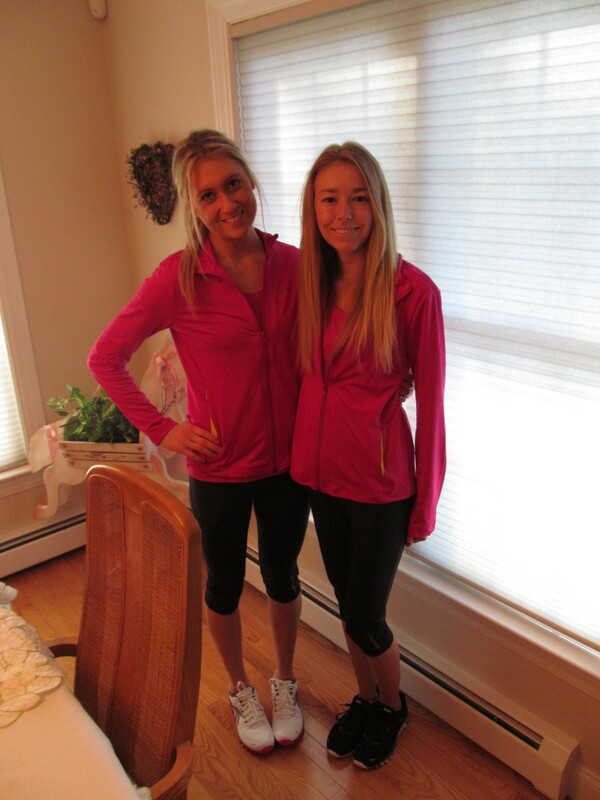 Yayy Gym Barbie! The sock liner in these sneakers is made of poly-urethane (PU for short – ha, a pun that Reebok’s merchandising team did not even realize existed!) to cut down on stench. 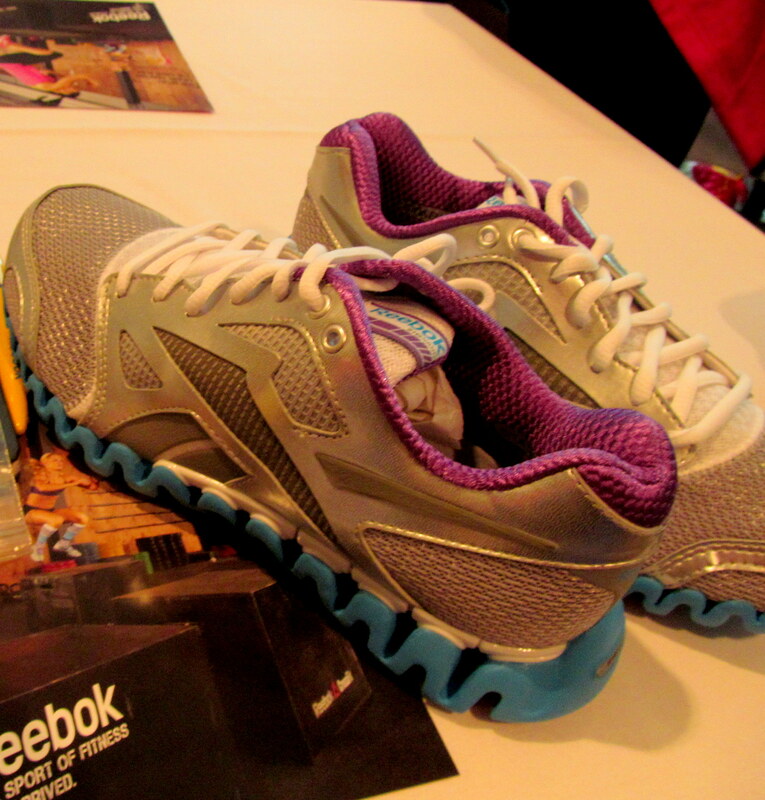 This design (not necessarily color) is Reebok Women’s key shoe, and its most popular. Creepin’ on Heather in her hot pink RealFlex. 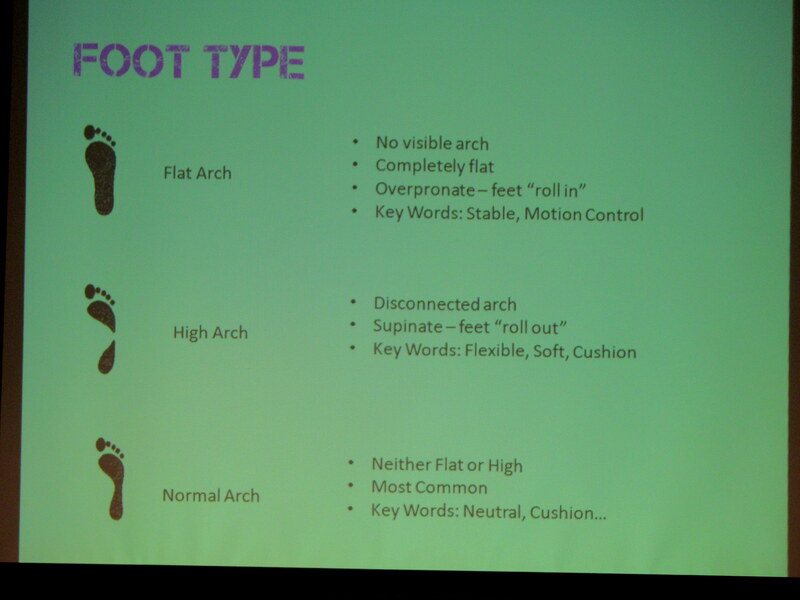 It provides neutral support for those with normal to high arch feet. 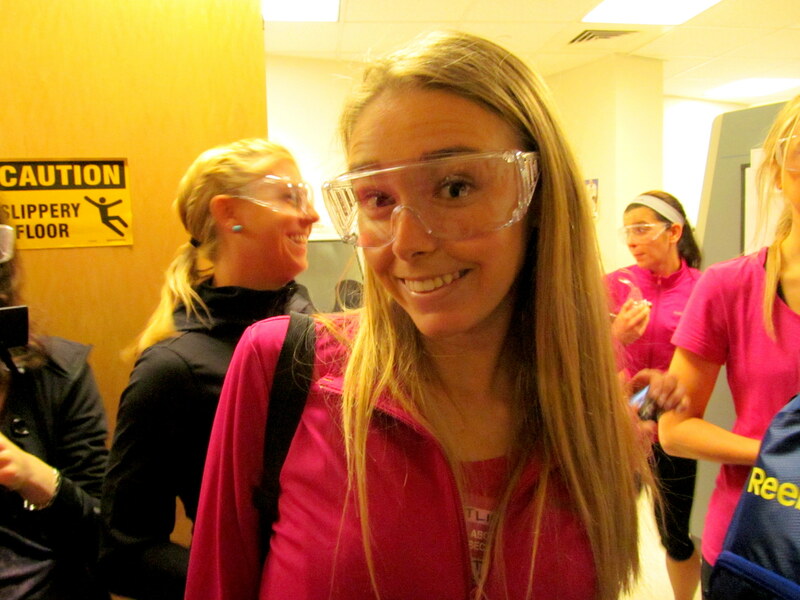 Of course I’ve already worn mine to Group Step (see below, taken pre-class). 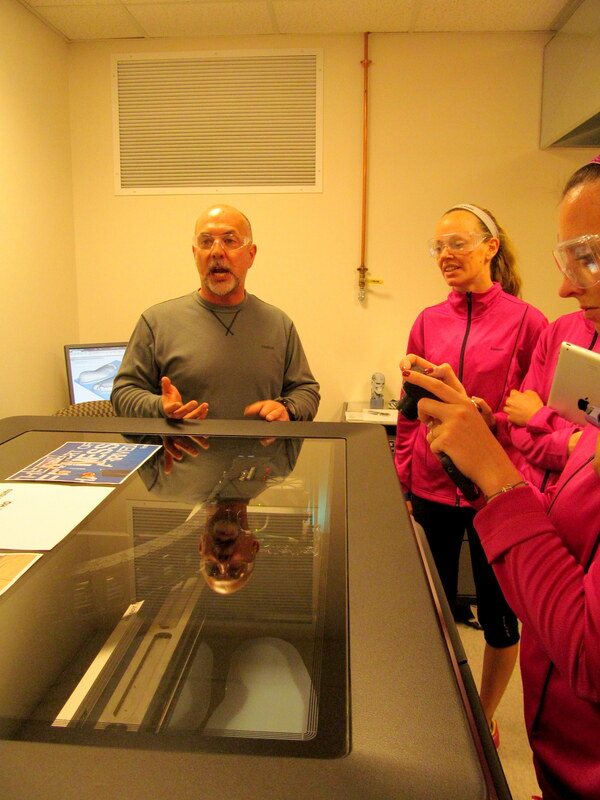 If you’re more of a runner, you can still take advantage of RealFlex technology and go with the Optimal design. Finally, we have the ZigNano Fly II sneakers, which utilize Reebok’s Zig Technology. I gave you guys a sneak peek of these during my recap. This is Reebok’s running platform. The wave design is meant to propel a runner forward and toe-off as fast as possible. 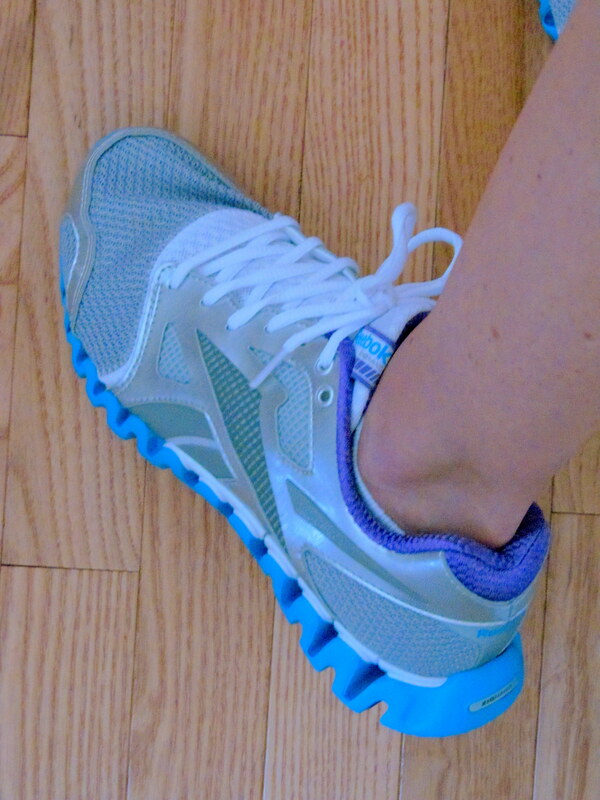 This is also a great shoe for the versatile woman, but is specifically a better choice for runners than the RealFlex. As I recapped on Sunday, even if you’ll be training for any race, no matter the distance, you should really be wearing a runner shoe. This is advice straight from the mouths of Reebok team members! I’ve worked out in these shoes twice, during the previously mentioned TIU workout with Heather and last night during that go-to Step class. So far each time I’ve put them on, I’ve literally breathed a pleased sigh as it felt like a cloud was encasing my foot. I can tell they’re built to keep the foot safe from jarring, whether from the pavement or plyometrics. I was doing the latter in class last night, and felt well-supported in the foot and, most importantly, in my ankles. Whew…there you have it! 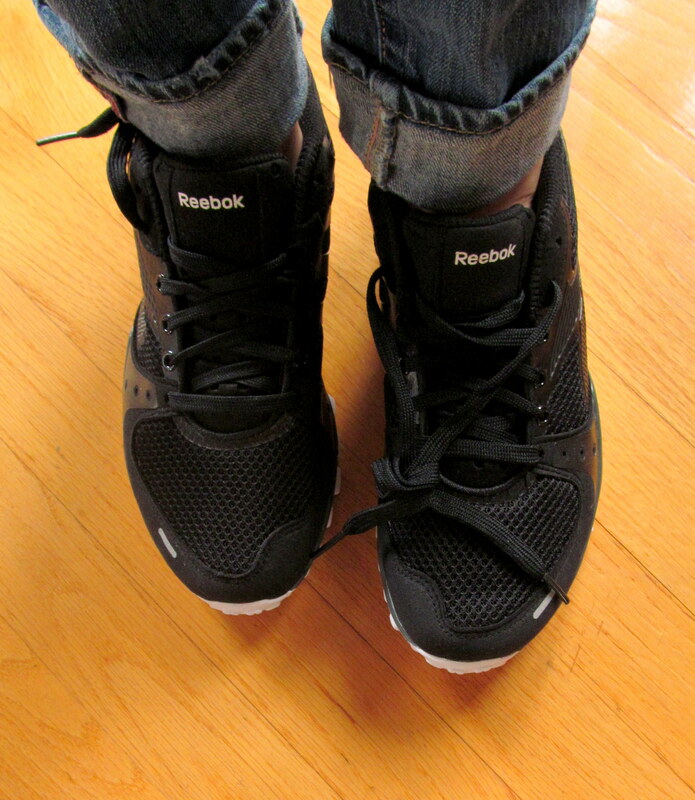 Everything you needed to (and wanted to, I hope :-D) know about Reebok Women sneakers and workout gear. Be sure to check out the online store and please contact me if you have any questions! If I don’t have the answers, I can certainly try to get in touch with the appropriate parties at Reebok, or other FitFluential Ambassadors, to find them for you! 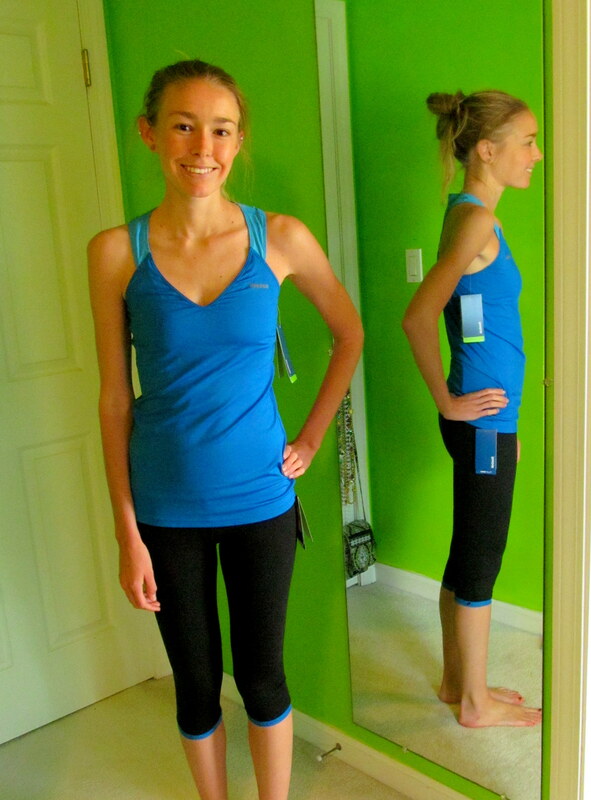 Have you ever found a workout headband that will stay put during a dance or plyo cardio workout? Anyone know if workout shorts with built-in underwear are actually meant to be worn without “real” underwear? Which of the three sneakers I received would you want to wear most from a fashion standpoint? How about functional? Same question as above – except with the clothes! 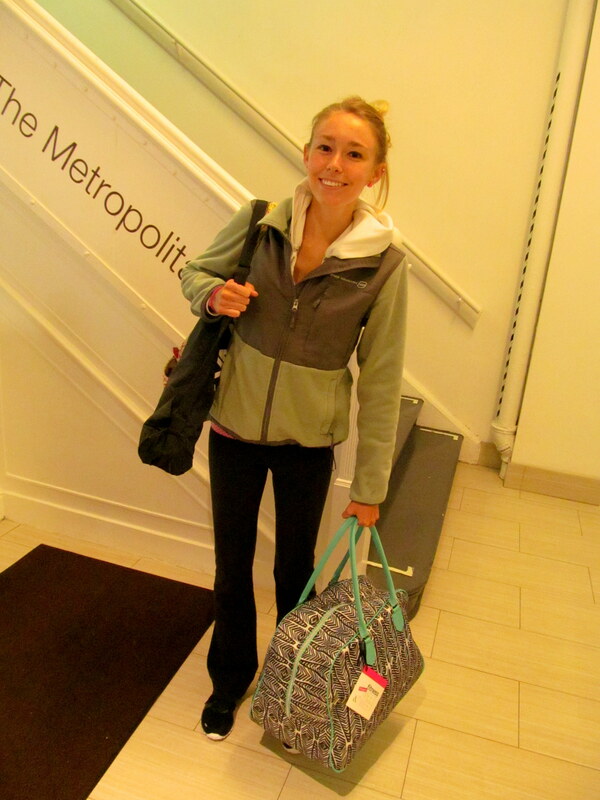 Where’s your favorite place to get workout gear, be it a brand or just a store that sells all different kinds? 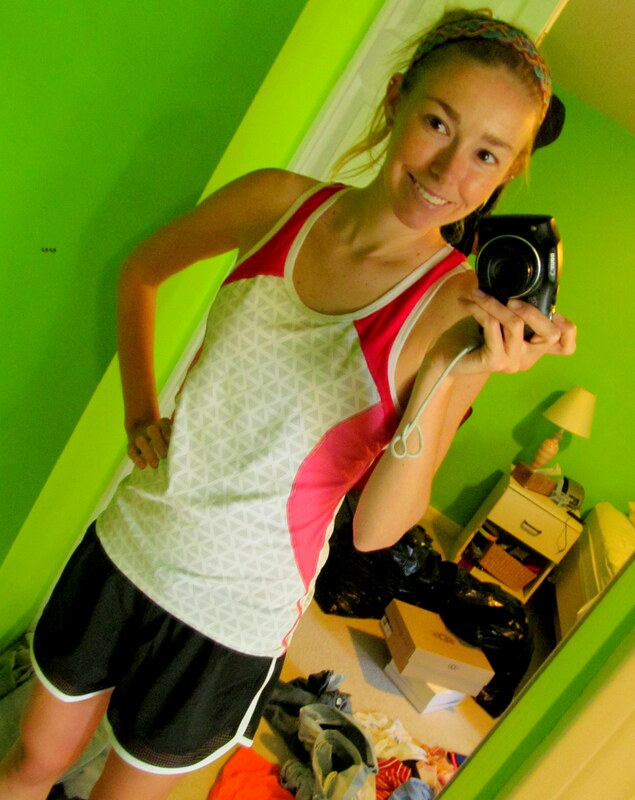 Gotta admit I’m in love with TJMaxx or Marshall’s to find affordable and cute sports clothes! A Day at Reebok World HQ! Oh my goodness. WHERE HAVE I BEEN?! I’m sorry that I haven’t been blogging…work has been crazy this week and in my down time I have been spending time with friends (old and new) and family, wine tasting, restaurant-ing, and working out. I’ve been doing the things I love when I’m not at work! Don’t get me wrong, I love blogging, but I get LOTS of computer time at my desk job. Being PC free is the way-to-be (ha) sometimes. 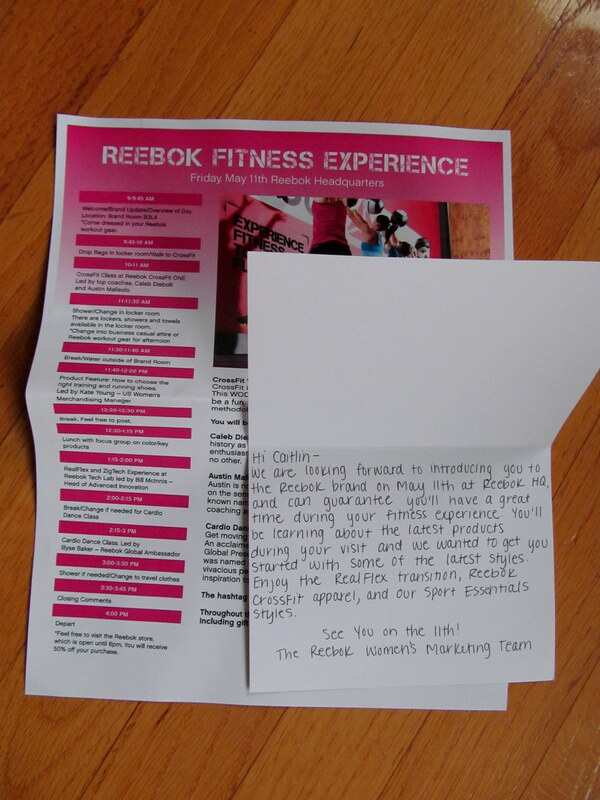 The kind hand-written note Reebok sent me before the event, along with an agenda of the day and some fashionable goodies! 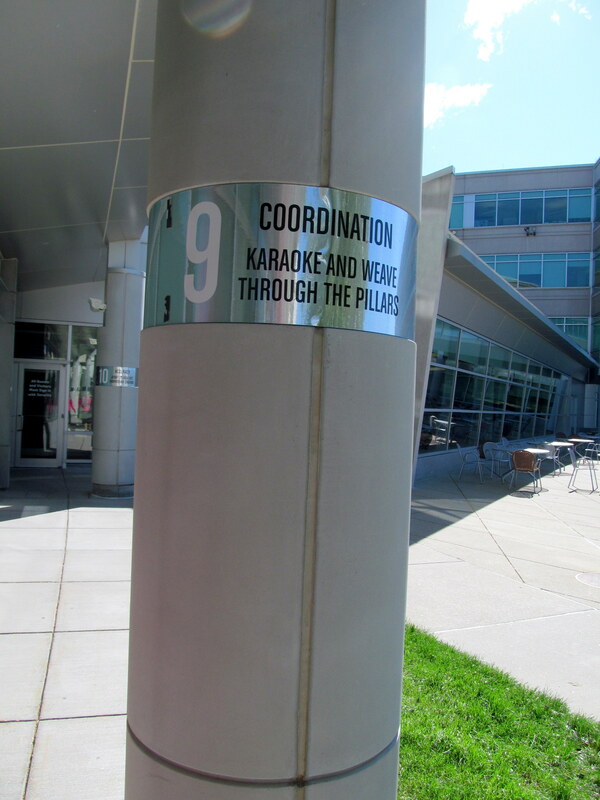 Random workout challenges were spread all about the campus, including on a row of 10 pillars – #9 was my favorite! You can probably see why! 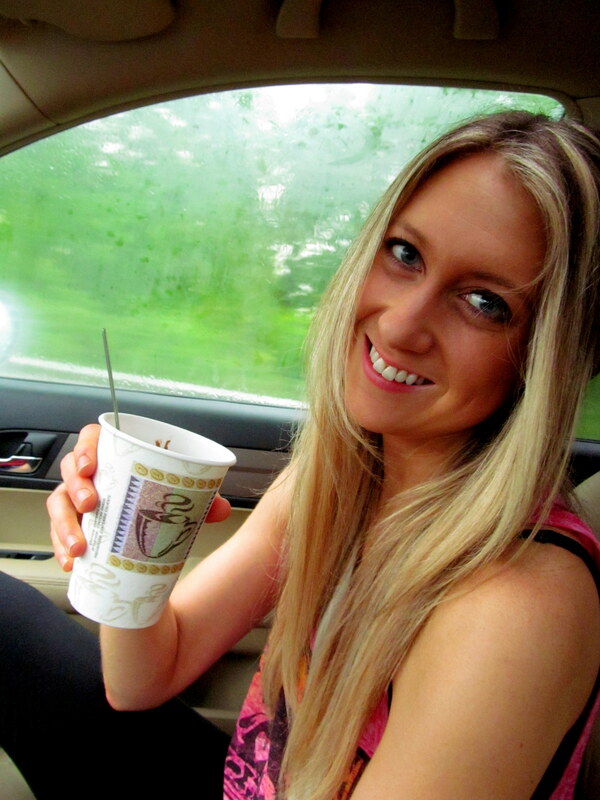 I headed to Heather’s house in MA the night before the event so that the next morning we could wake up and drive there together. 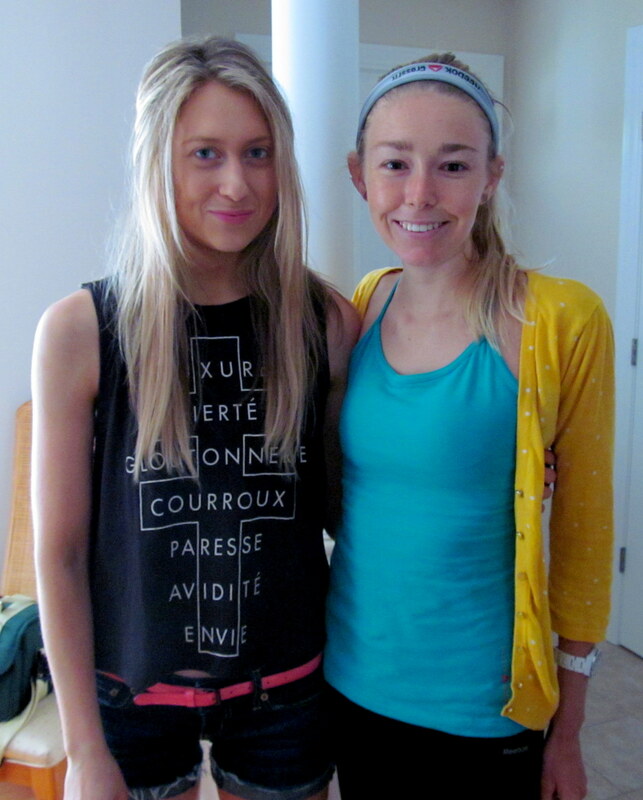 It was so convenient and I loved being able to visit her house for the first time! 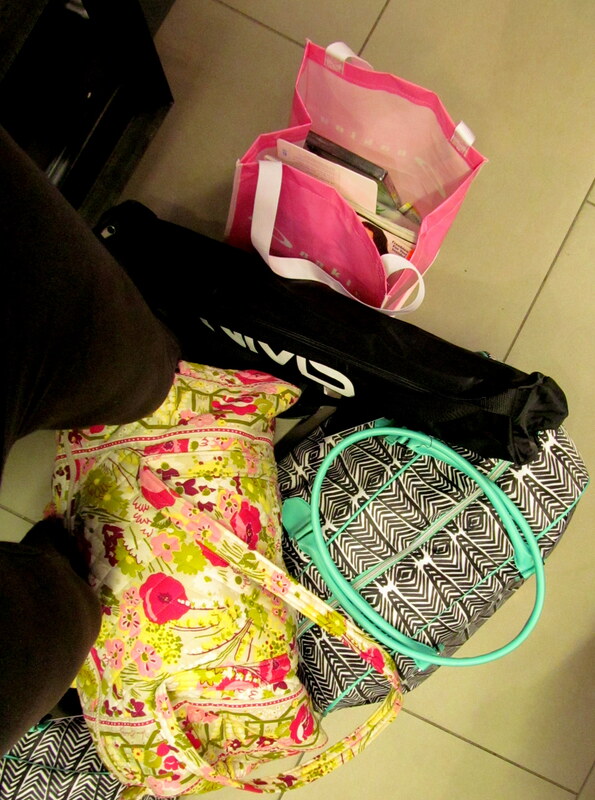 She and I arrived (albeit a bit late…oops!) 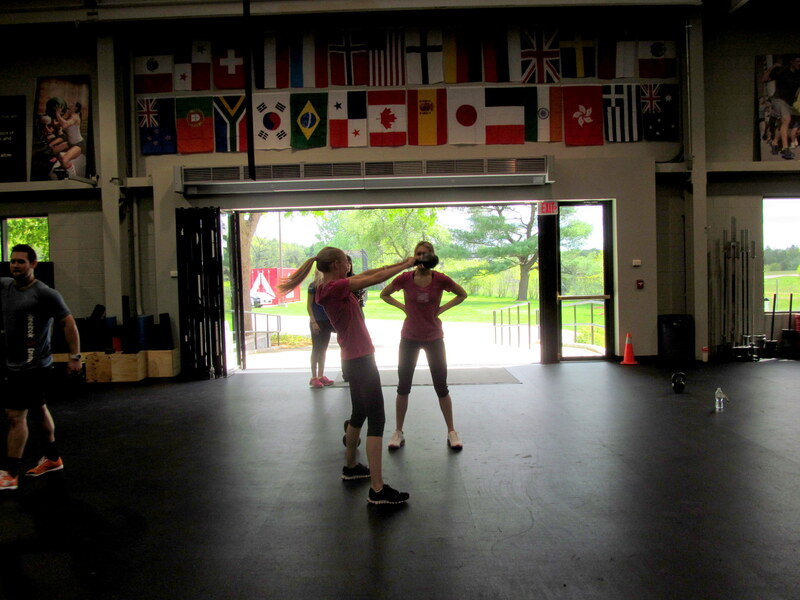 at Reebok World HQ in Canton, MA and were greeted by the fantastic intern we spent the day with, Kathryn Lewis, a Crossfit junkie and an extremely hard worker. We were led upstairs to a VERY impressive meeting room that we came back to throughout the day. 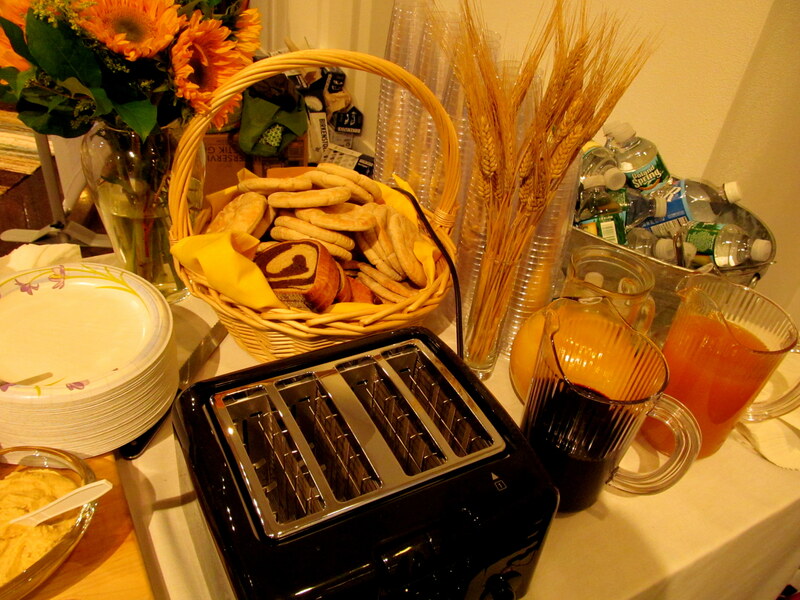 I was aching for some caffeine and I got it…the coffee was amazing and the breakfast spread looked great! 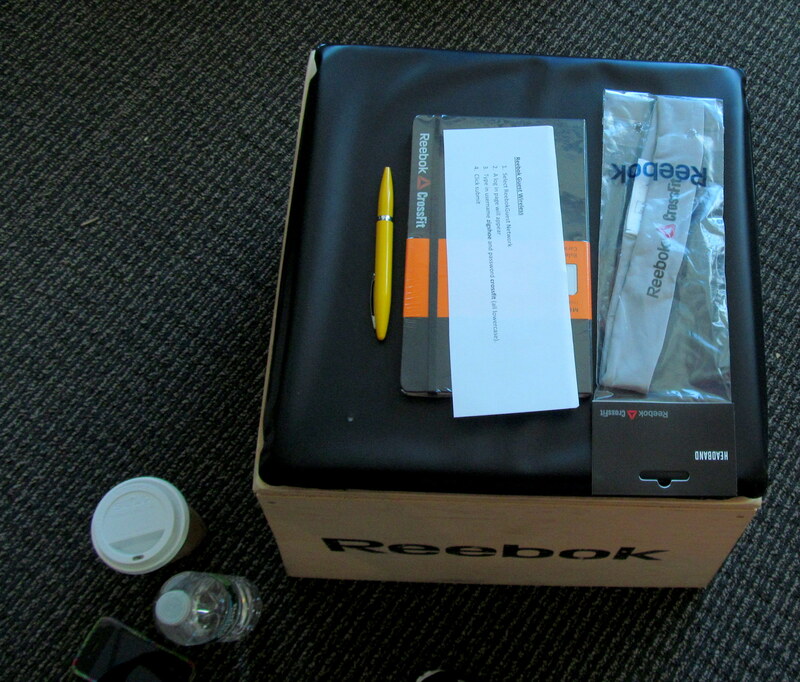 My Crossfit box seat, headband, writing utensils, caffeine, water, wireless info…basically, all set! Can you spy any of your favorite bloggers in my photos? Just like at the Fitness Magazine Meet & Tweet, I was given the chance to hang out with some of the women who inspire me and have been doing so for years! 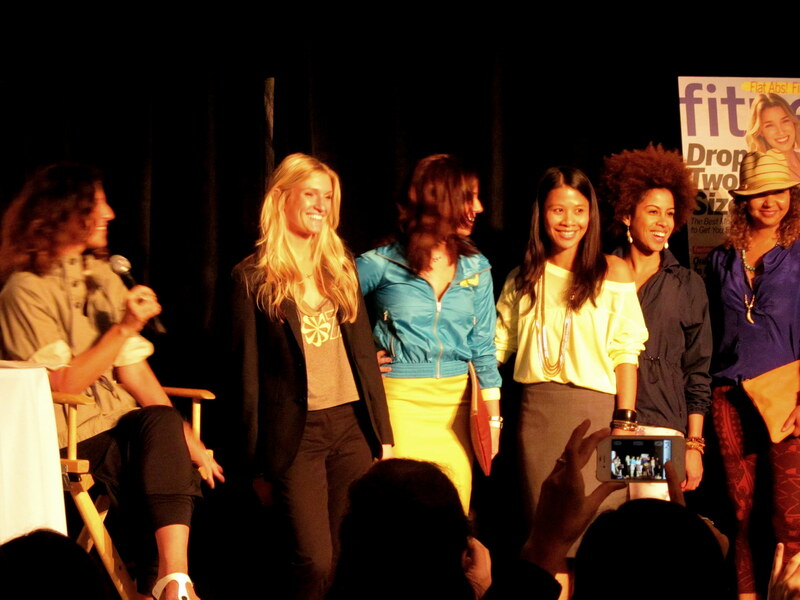 I saw Julie, Courtney, Tina, Anne, Maria, Bex, Nicole, Cat, and Sarah again. 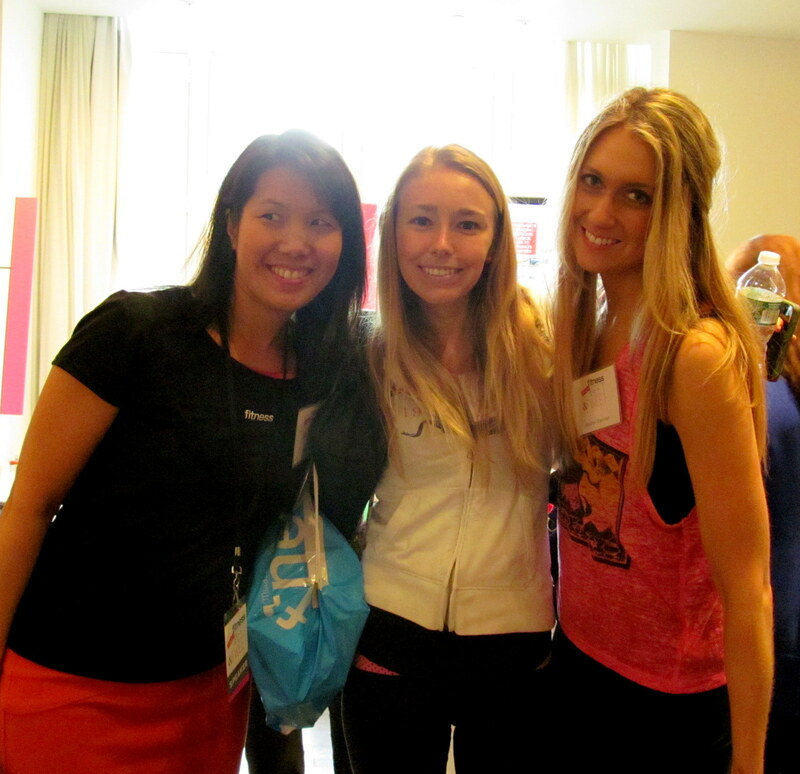 But I also got to meet some lovely ladies that hadn’t been in NYC the previous Wednesday – Sarah of Skinny Runner and Ashley of Healthy Ashley! I was a bit of a nerd when introducing myself to Ashley, gotta admit it. She is just so strong and has overcome so much…and I’m a big sap (thanks, Heather ;-)) and adore her love story. Sarah is just as funny in real life as she is on her blog and was really cool! She has the same laptop as me and, like me, hers often can be found to have a ton of food in the keyboard. Sorry, technology. 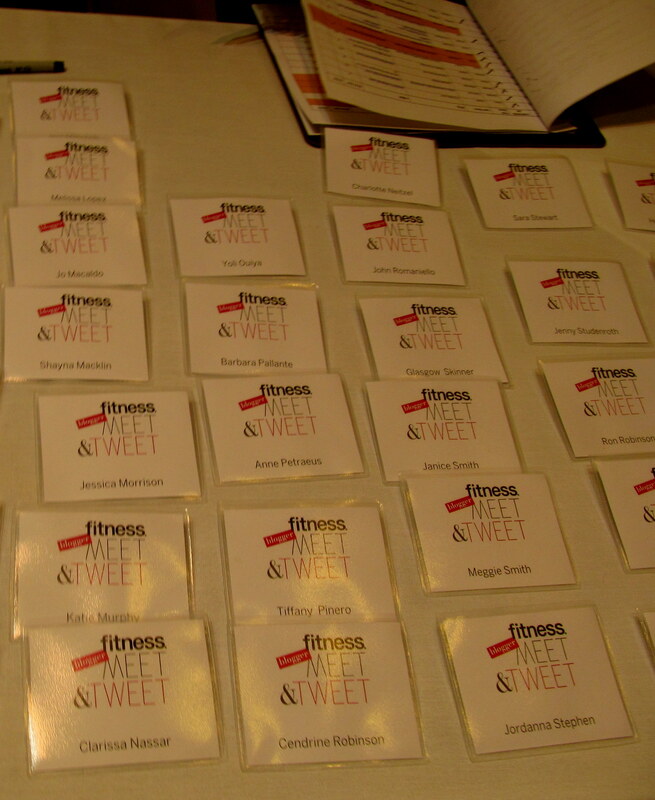 Our nametags – we got to write why we loved fitness and blogging! Johnice Graham, Reebok marketing manager (I mentioned her in my Fitness Mag recap because she was at that event too), kicked things off welcoming us, thanking us for coming, and giving a great overview of the brand’s history and how it came to be where it is today. 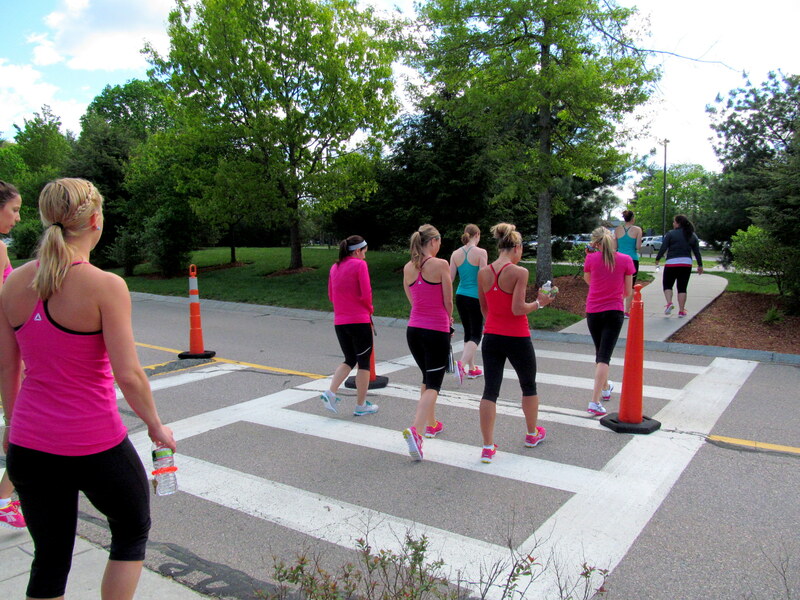 Reebok started out being VERY big with Step aerobics, which is currently my favorite form of exercise! My mom used to teach Step and she still remembers loving all the Reebok clothes and wearing their trademark white sneakers while she taught. 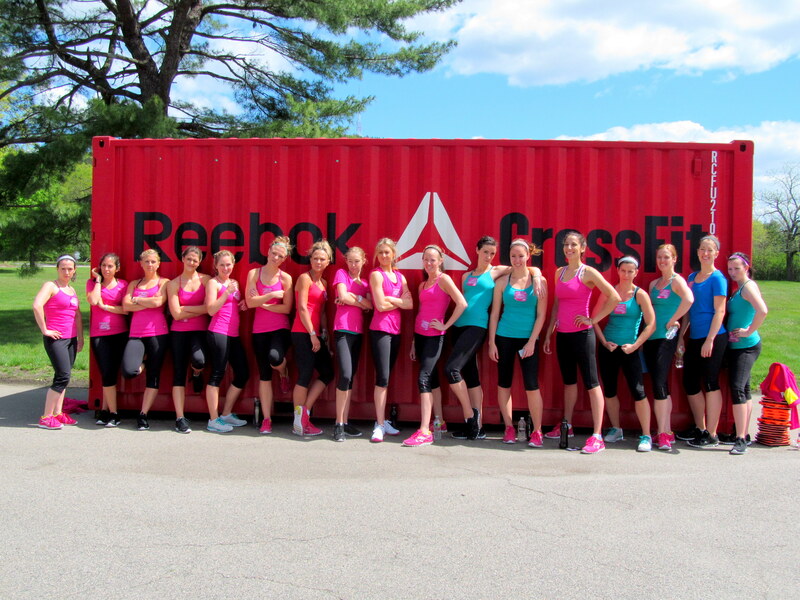 Now, Reebok is focused on a broader category – FITNESS. I love that idea! It’s smart of them to keep it broad because really, anything can be fitness. Different activities are fitness to different kinds of people. Everyone has a form of fitness they enjoy or can find and enjoy. My blogger brain is a sponge! Ready to learn! 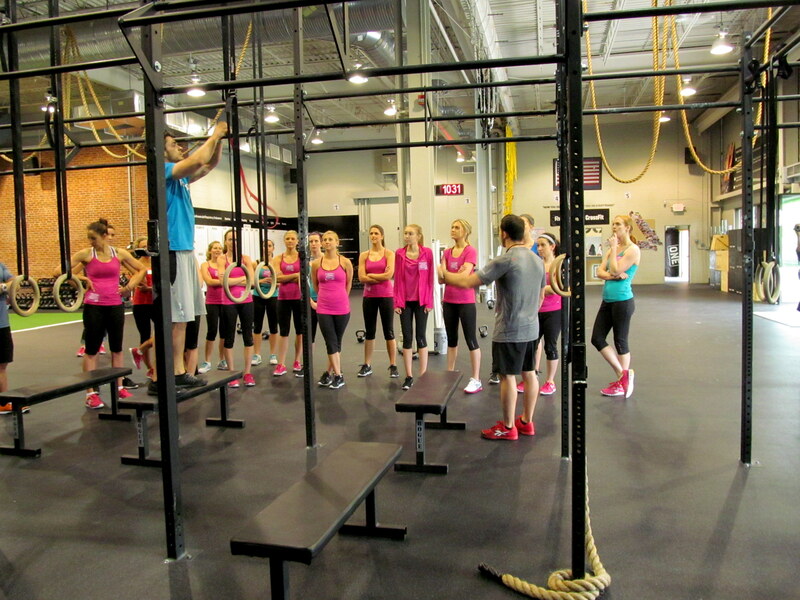 Then we got to watch some videos that got us REALLY pumped up and ready to go try Crossfit. We learned about Reebok’s involvement with Crossfit specifically, and saw several montages and commercials that communicated a clear brand image. I felt so truly inspired! From a marketing POV, I really respect the creative minds behind those pieces that we viewed. 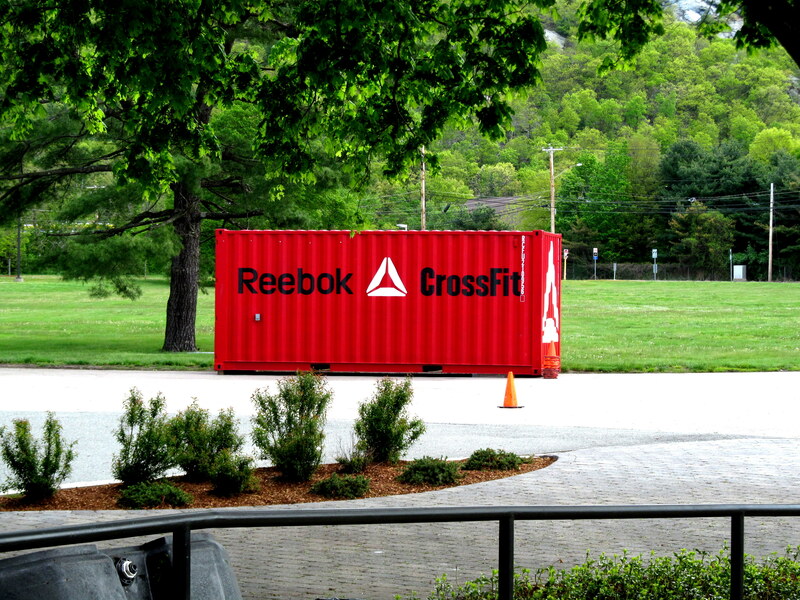 Next, off to Reebok’s Crossfit box. Yes, they have one on campus! 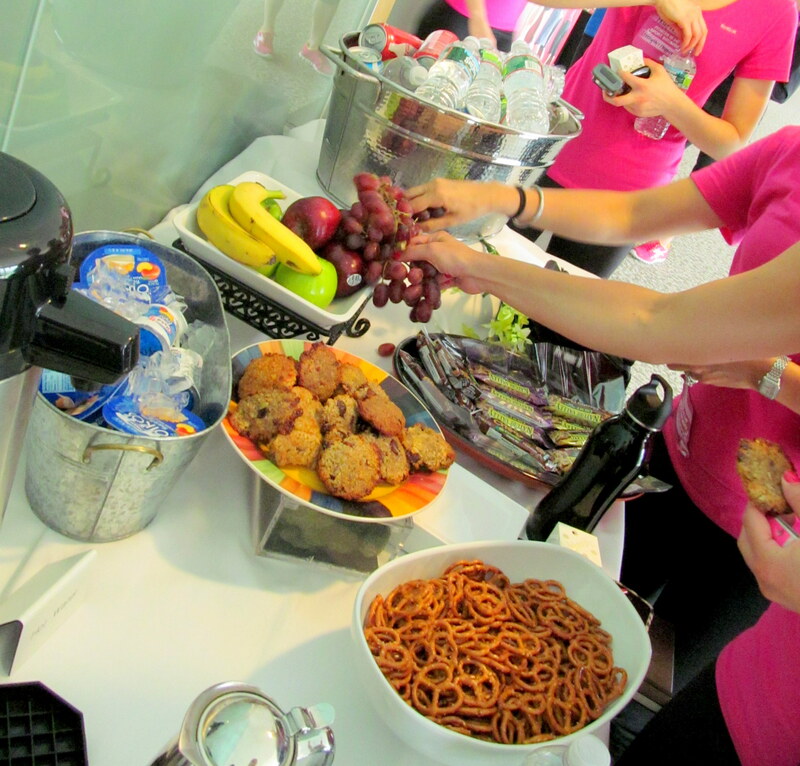 I am actually completely envious of all the fitness options the HQ has for its employees. Classes are going on ALL the time. Heaven for a group fitness junkie like myself! The gym is also gorgeous. 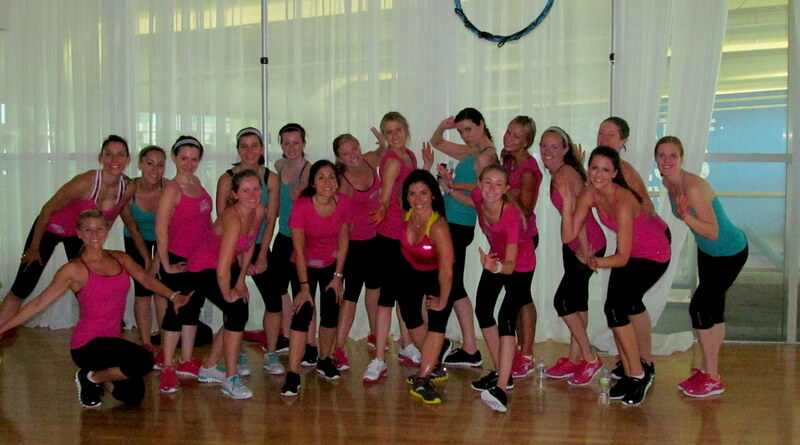 You may be wondering where we all got the fabulous workout gear we’re wearing in our pictures! And how we all got the same clothes! Well as I mentioned before, I’ll be going more into the fashion-aspect of this in my next post. After all, I love fashion, and thought that everything I wore before, during, and after this event DEFINITELY deserved its own post. That’s Kathryn (the great intern) on the left! I was nervous to try Crossfit at first, but the Reebok top Crossfit coaches Austin Malleolo and Caleb Diebolt did an excellent job easing us into the WOD (Workout of the Day) with demos and chances to practice two of the workout’s three portions – kettlebell swings and pull-ups with bands. It quickly became apparent to me that anyone can do Crossfit because there many modifications available to make each WOD accessible to anyone. For example, bands of varying thickness could be looped around the pull-up bar and then around our feet to assist us. Check out this video from Kelly Olexa to see what I mean – Heather and I are in there doing our pull-ups! The ladies circle around Caleb…we didn’t need much convincing! The kettlebell swings were also easy to modify because of the different weight levels available to use. Caleb demonstrated the proper form to us, but only after we had all practiced some squats first. Owww. We did three rounds of sprinting, swinging, and pull-up-ing. 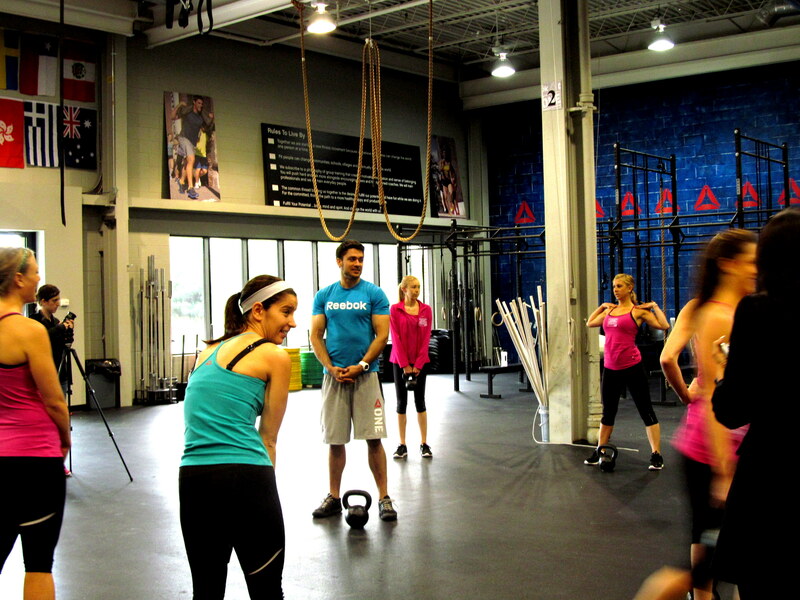 I liked the cardio and strength interval aspect of Crossfit, as well as the varying kinds of moves. I like a workout that switches it up and gets a lot done in a short period of time! 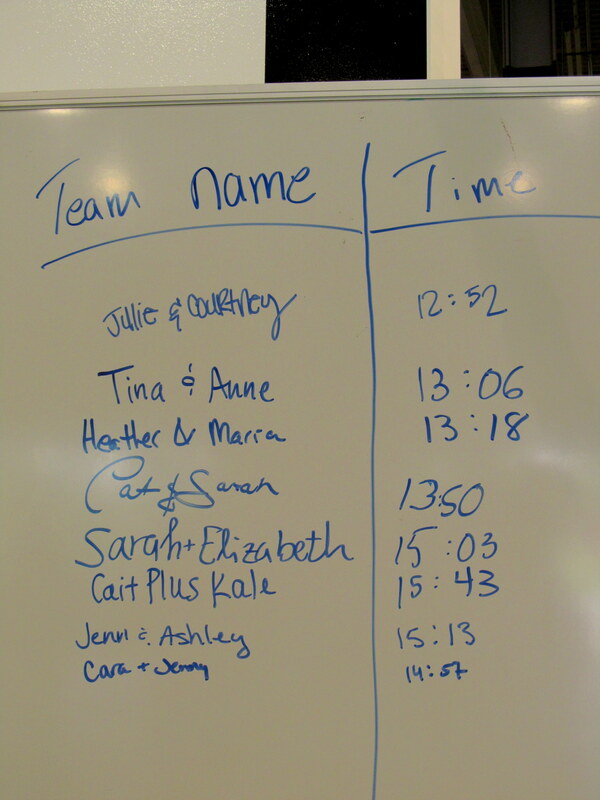 I was pretty satisfied with Cait Plus Kale’s performance, especially for first-time Crossfitters! 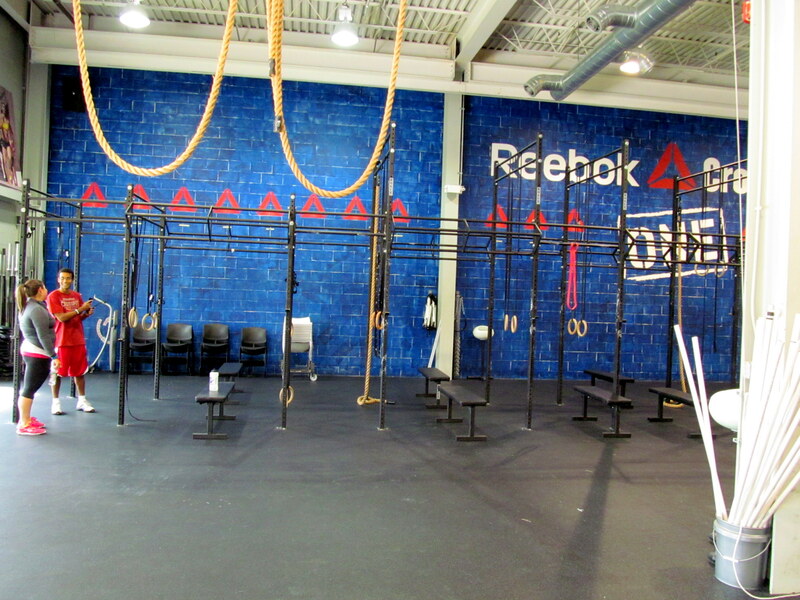 Reebok did a great job making sure we were well-trained and well-versed in the Crossfit ways. I learned a lot and would totally do it again! Wait…can we just look at this close-up? Oh yeah. I went there. Apologies to Julie, Sarah, and Heather. 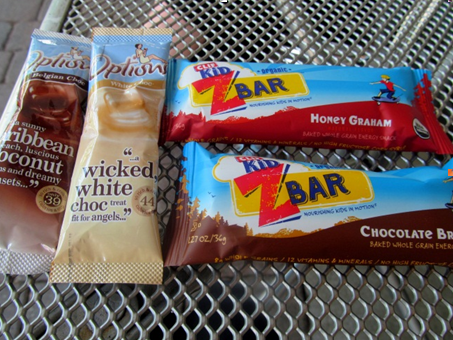 We walked back to our central meeting place, where snacks awaited us so we could re-fuel. I had a banana, and felt another caffeine craving. Kathryn kindly offered to grab me some coffee, but I had no idea she’d have to go down to the basement, where Reebok’s Starbucks is located, to get it for me. I was blown away! 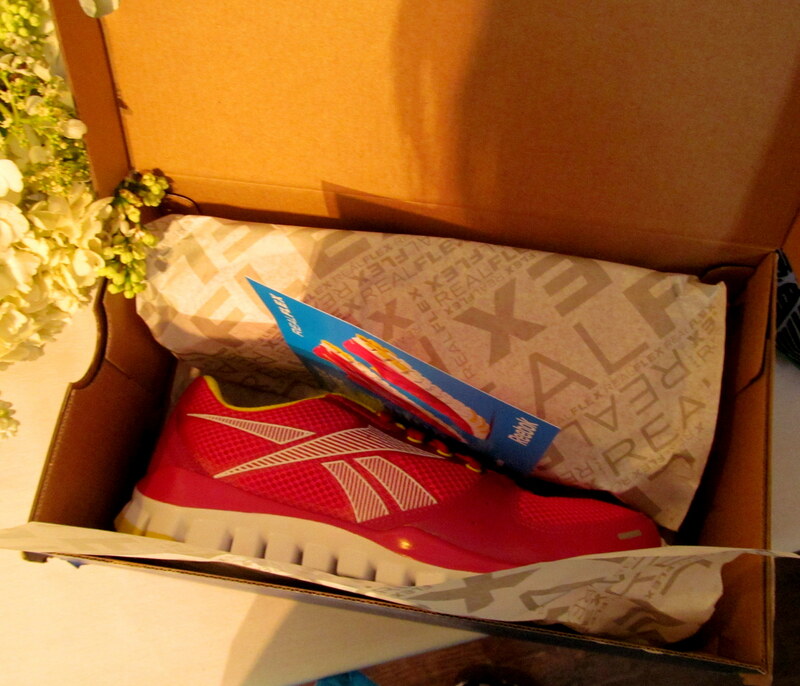 Reebok seriously treated us like queens the entire day and I am so thankful. I was certainly not expecting that! Thank you Kathryn! 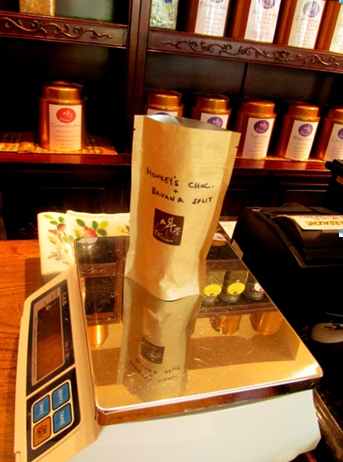 The coffee was amazing! 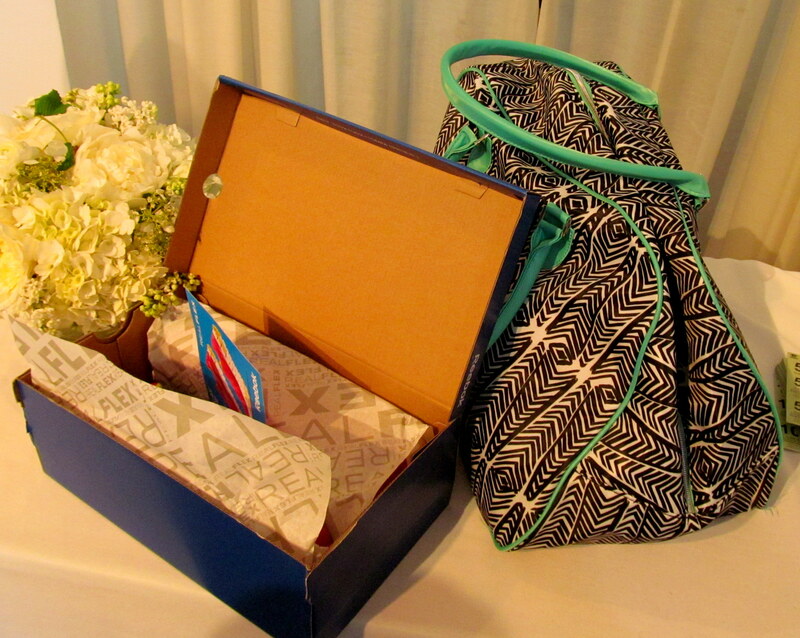 And things only got better – on each of our seats was a bag of more Reebok goodies! I couldn’t believe it – I’ll go more into detail about what I received when I do my fashion-related post, but here’s a sneak peek! Reebok ZigNano Fly II sneakers! Nicole and I rockin’ the goody bags! If you were watching my Twitter during this next part, you may have seen my live-tweeting everything we were learning from Kate Young, the US Women’s Merchandising Manager, about Reebok sneakers. Reebok’s Crossfit shoes were the first built purely for function – the colors and styling came later. 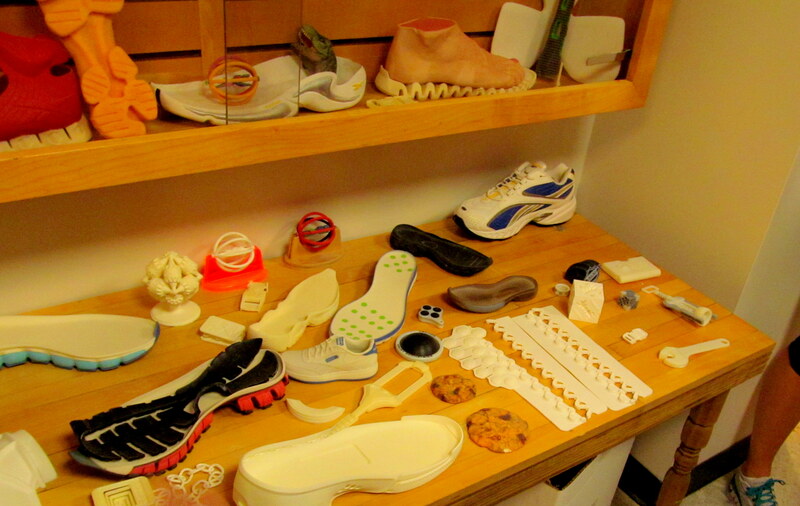 U-Form technology is pretty amazing – any shoe possessing these capabilities has a U-Form logo. Just hold a hair dryer to it for 20 minutes (you can prop up the hair dryer and let it run), and when the logo shows up on the tongue, that means the shoe is ready for molding. 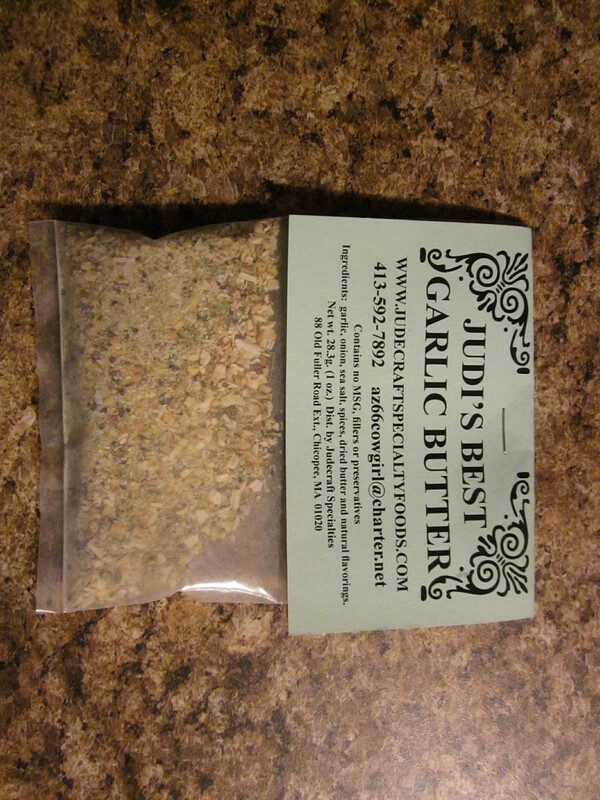 Just put it on and it will mold to your foot for fit-perfection! The last of a shoe is its mold, and every shoe has one. This includes characteristics like width and toe spring. The Oly is Reebok’s Olympic lifting shoe. Just holding one of these was an experience – the heaviest sneaker I’ve ever held! Certainly not meant for running. 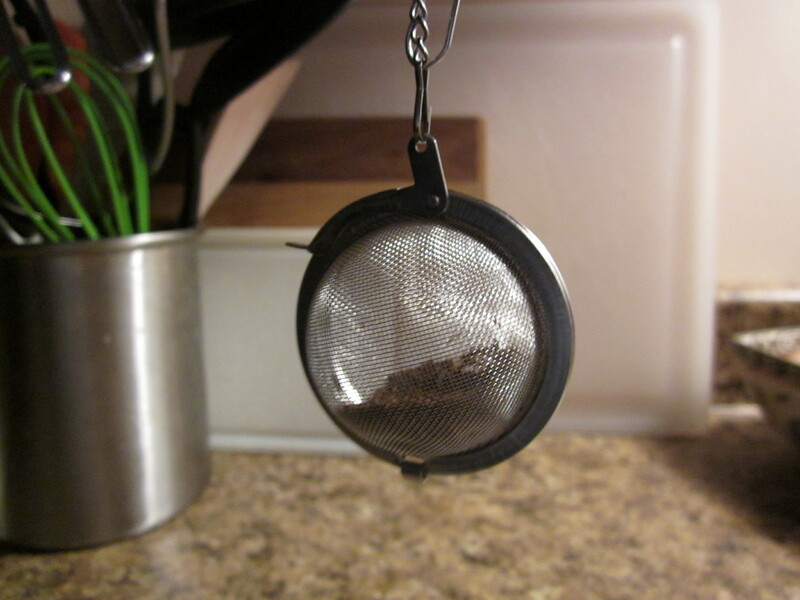 It’s designed to encourage keeping weight in the heels. Sneaker liners can be molded or di-cut (flat). The drop of a sneaker is very important. It’s the difference in height between the heel and the forefoot. A zero drop would be a barefoot shoe. A flatter drop is the best for strength training, because a lifter wants his or her feet planted firmly on the ground. That’s why you may often see people lifting weights in barefoot shoes! Overlay is anything stitched on top of the mesh of a sneaker. For any race you train for, even a 5K, you should go for a running shoe. That’s because since you’ll be doing training runs, you’re more likely to be running more often, even if for shorter distances. To determine your foot type, try either looking at your sneakers to see where the most wear is, or try getting your feet wet and walking on some newspapers or a brown paper bag. The majority of folks are in the “normal” space. For more about the sneakers I received, stay-tuned for that fashion post! 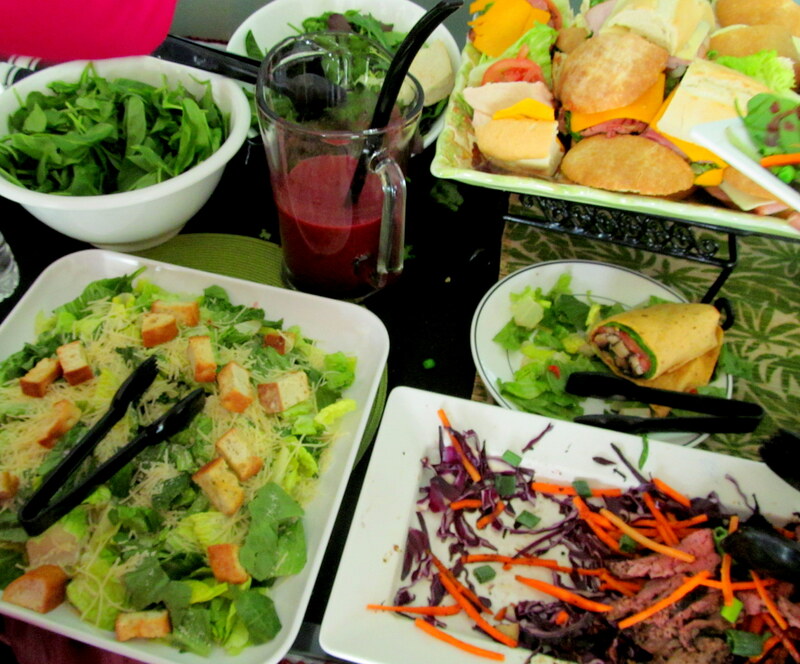 Then it was lunch time, and the lunch was seriously amazing. 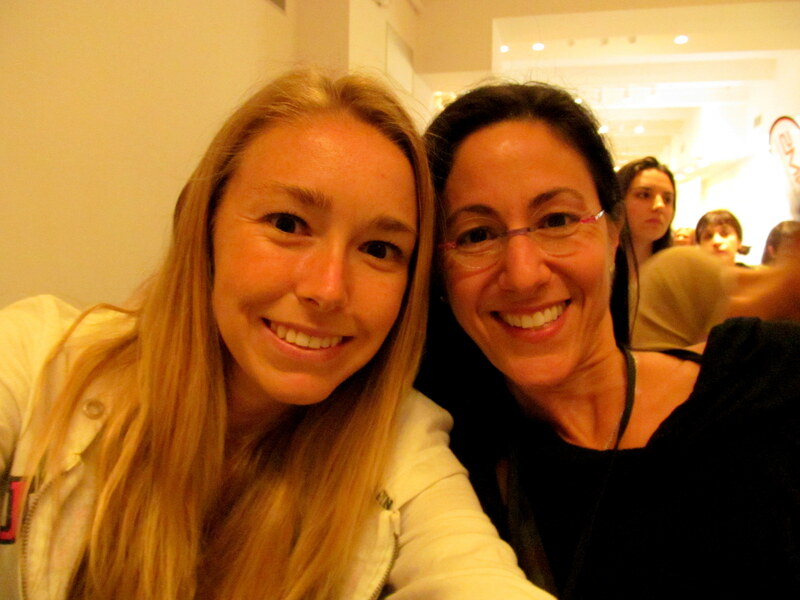 While we ate, we participated in a focus group, which had me totally nerding out. To be the subject of interest for a company like Reebok was, and still is, surreal! This was the point when we got to see stuff that isn’t even out yet – even up to a year out in terms of launch timing! All I can say is, keep your eyes peeled, because starting in July you’re gonna be seeing some great things from Reebok. I made myself a spinach salad beast with steak and chicken, accompanied by a veggie wrap, whose innards were promptly emptied on top of my salad. After lunch and the focus group we went downstairs to Reebok’s labs to learn about the path of the sneaker from idea to shoe. Bill McInnis, head of innovation, used to work for NASA! 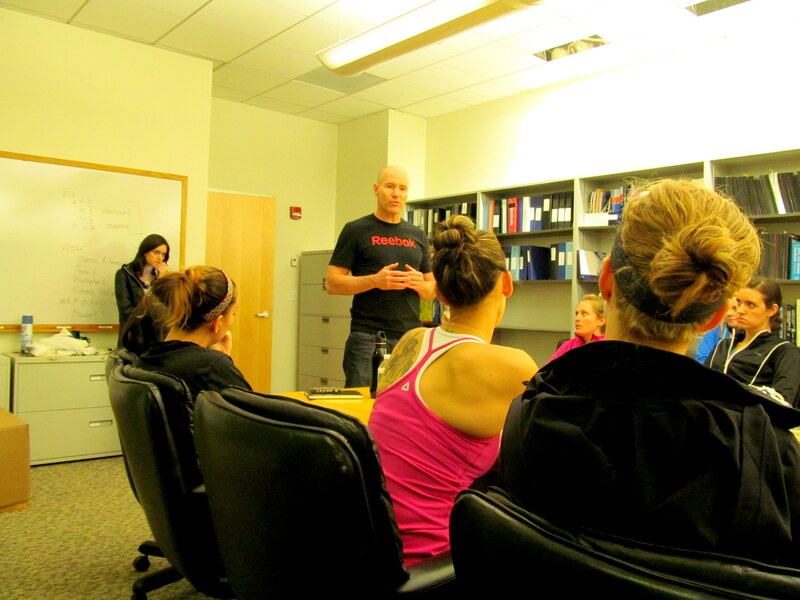 I was amazed by the room we were in when we listened to his presentation. 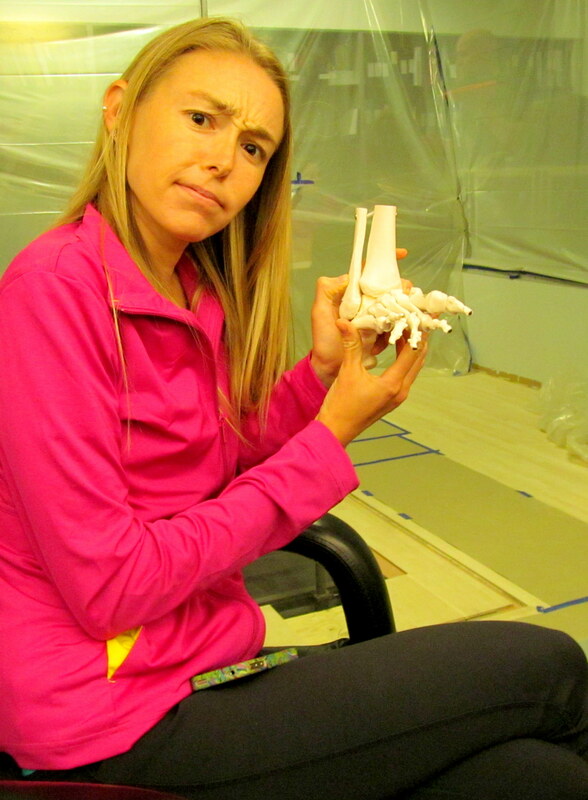 The shelves were full of medical textbooks and models of the foot, ankle, etc. Whenever I look at shoes I see fashion and function, but it never truly hit me until that moment how much science goes into the functional portion of a sneaker. Reebok’s sneakers are tested for 200 to 300 miles before they are released. Gotta know how they’ll hold up in the long term! Bill passed around a model of a human foot to show us how complex it really is – the foot has just as many bones as the hand, about 26, yet most people probably think of the hands as being more complicated because they do so many nimble things like play the piano, type, etc. Goofing off with a foot, because that’s what I do. 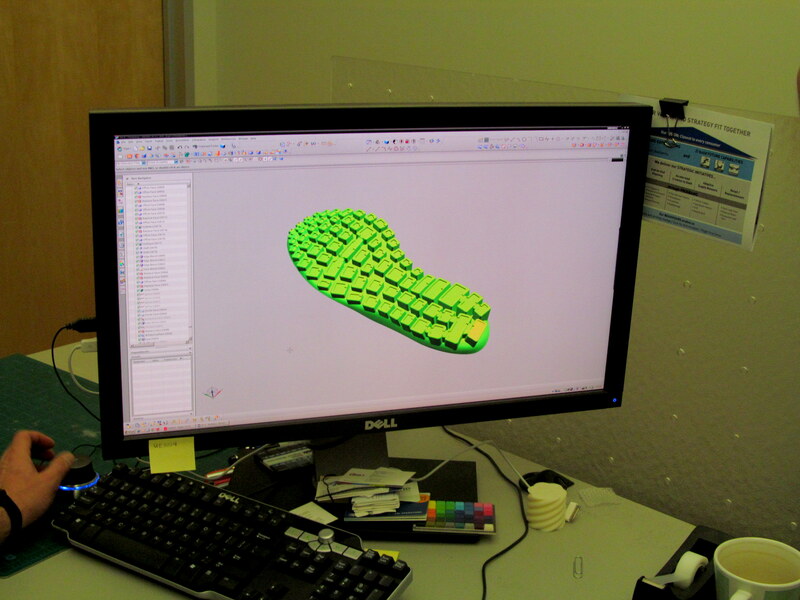 Then we headed to check out the CAD technology behind designing each shoe. We use CAD where I work, so it was cool to see it applied to sneakers! 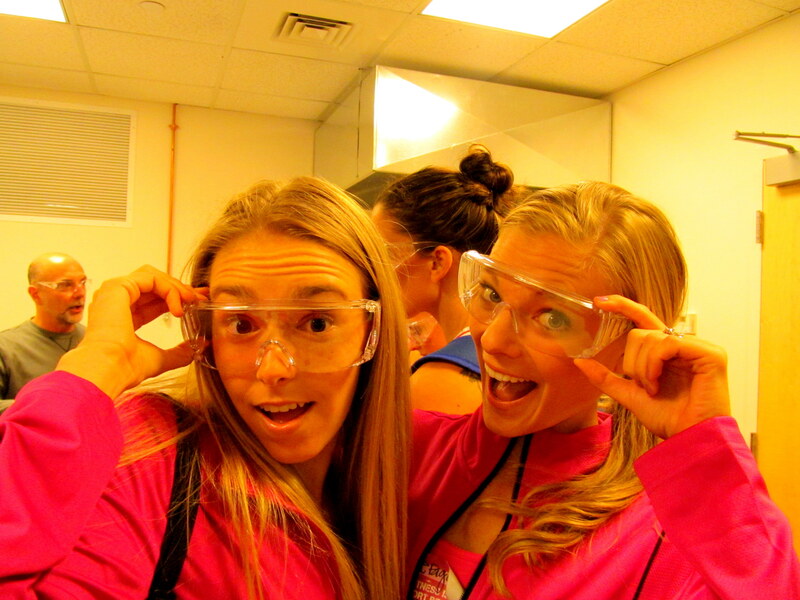 Next we donned safety goggles and headed to the lab where the design on the screen you see above becomes reality – or at least some form of it! Many a geeky goggle photo was taken. A good luck for me and Julie, yes? Reebok actually took on the challenge of creating a sneaker for Igor Vovkovinskiy, the tallest man in America – he’s 7 feet, 8 inches! 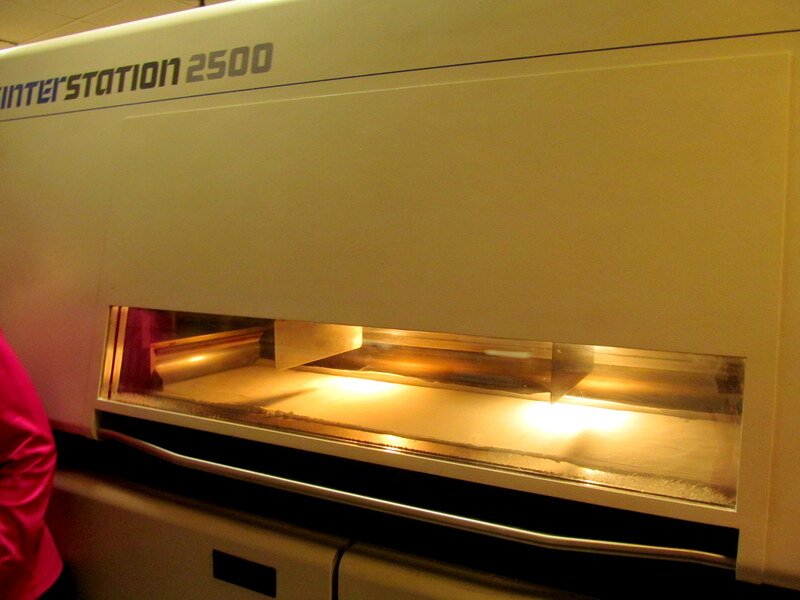 Paul Bates, head of the CAD department, showing us the machine used to make Igor’s shoe. The computer we saw previously sends a design to the above machine, which then gets to work actually making it, using 100% recyclable plastic. It used to be a highly inefficient process – before the “digital age”, a design would be faxed overseas, where it would be interpreted visually by a human and made into a mold. That would be sent back and, usually, several rounds of back-and-forth corrections would have to be made due to misinterpretations. Now we have computers that know exactly what to send and machines that know exactly how to read it! All of these were spit out by the machines you’re seeing here, after the CAD technology sent the design their way. Another type of machine, but this one does the same thing. 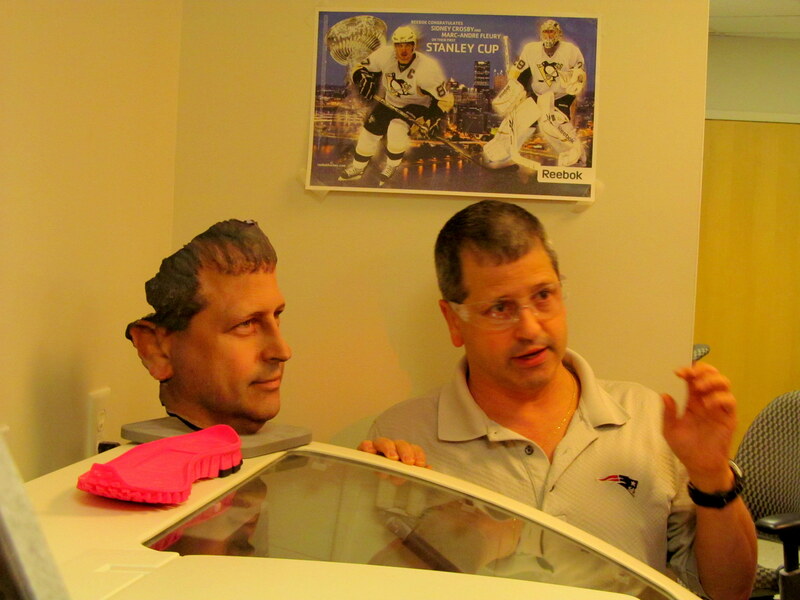 The Reebok employee below works with this technology on a daily basis and even used it to make a scary-accurate rendition of…himself! He also made us some cool little gadgets to take home – reminded me of a Rubix cube, only nothing to solve, just plenty to play with! Last but not least, it was time for my most anticipated part of the day…a cardio dance workout with the creator of Dancinerate and Reebok Global Ambassador, Ilyse Baker! Ilyse gives us her background and gets us pumped to dance. Ilyse was gorgeous, so skilled, and a fantastic teacher. Plus, she’s from California. I see so much of what I would like to be in her! 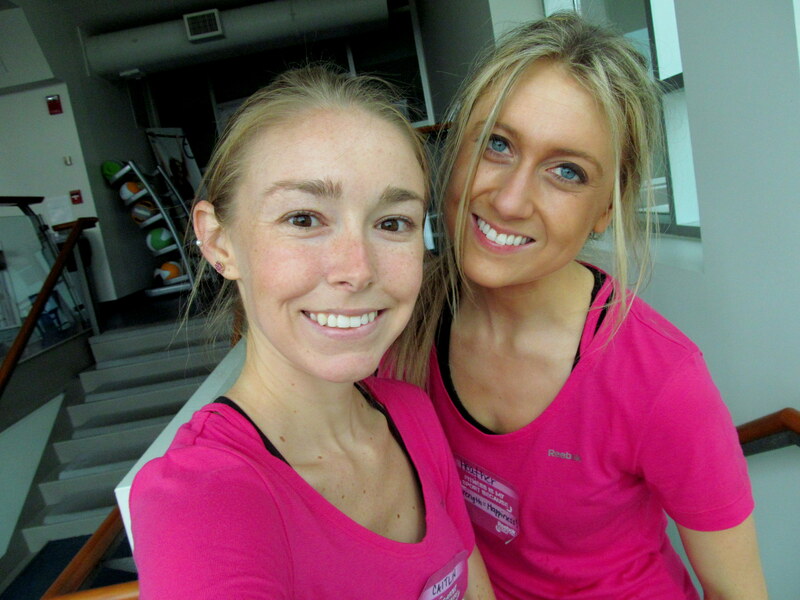 She views fitness as a community and loves how social media plays so well into that. 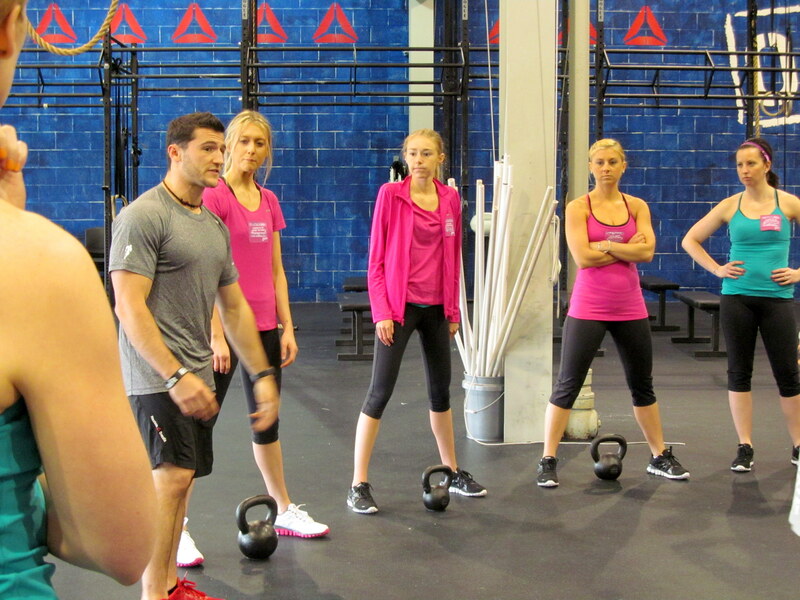 Sounds just like what Reebok thinks of fitness as – and me too! To viewt a lot more of our dancing, check out Sarah’s video recap of our day. It’ll make you feel like you were there and give you a better idea of the kind of dance we did! 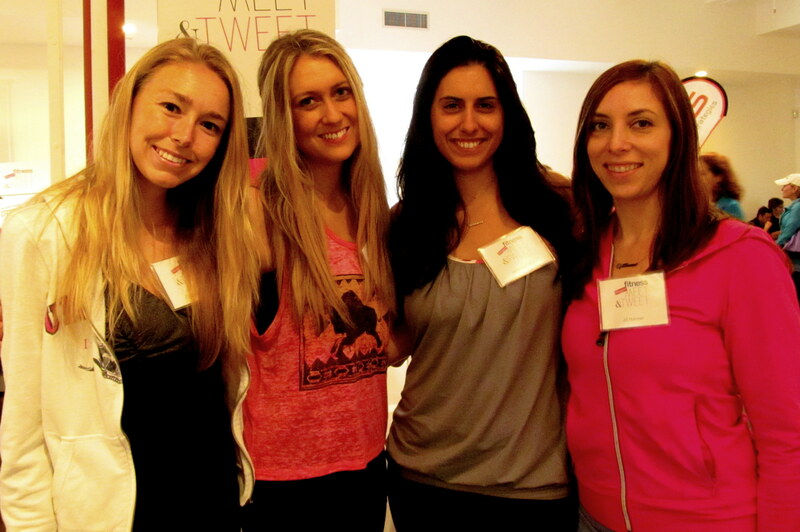 Thanks to Ilyse for coming all the way from LA to teach us bloggers how to break it down! Sadly, our day at Reebok was coming to a close. 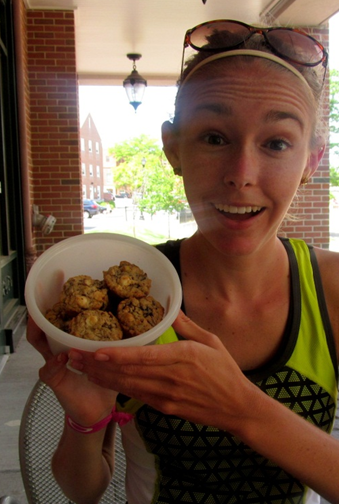 It ended with some special Paleo cookies though, which is always good. They were so hearty and full of nutrients! 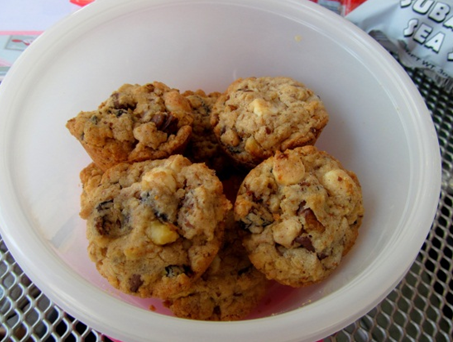 The lovely cookies, and other snacks too! Johnice gave some closing remarks, thanked us for coming (um…thank YOU!!!) and drew two names out of a shoe (how appropriate!) 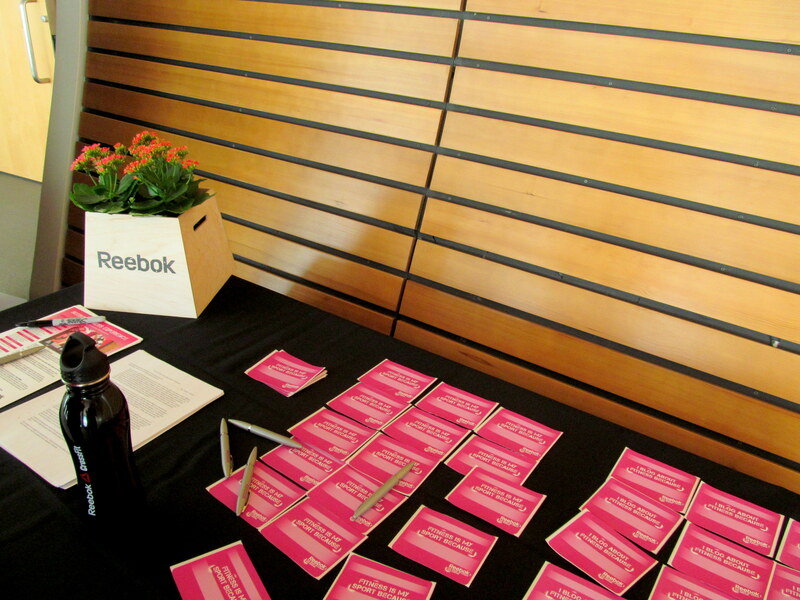 to win a $100 Reebok gift card to the HQ’s store, which was already 50% off for us that day. And guess who won the second gift card?? YAY!! What a perfect ending to a perfect day. I used the card to get myself a couple of tanks (will review in my Reebok fashion round-up), and I purchased presents for my family and Heather as well. I got my sister the top Ilyse was wearing during our dance class! Oh my gosh. What a day. Was that recap long enough for you? It would have been longer if I had started babbling about the clothes and shoes! Don’t worry…that’s coming next! 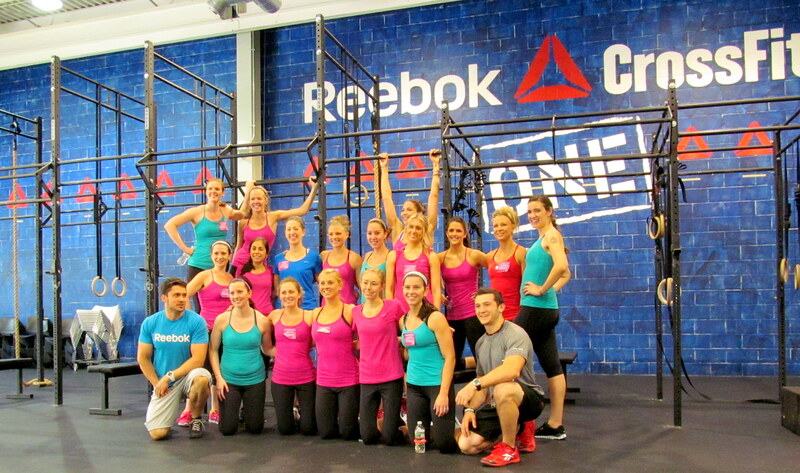 Thank you Reebok for hosting this #RBKFITBLOG blogger event, treating us so well, and showing us such a fun time. 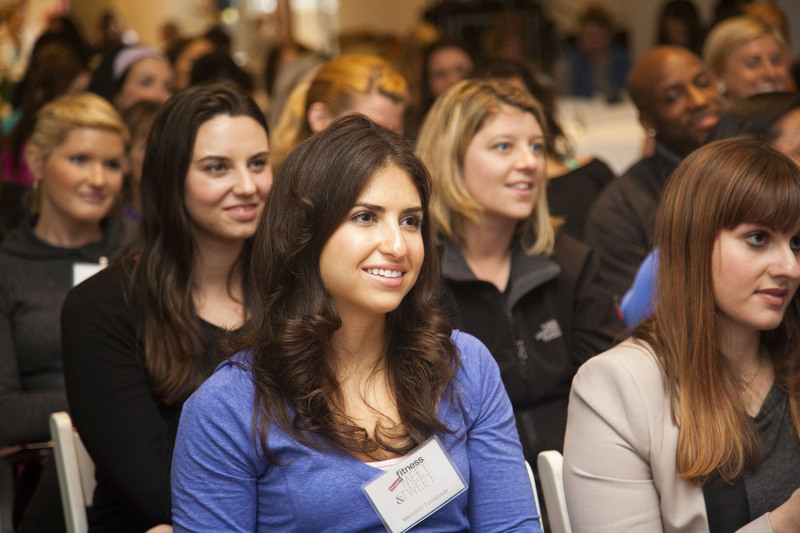 I am so grateful to have been included with all the amazing women who were also invited! 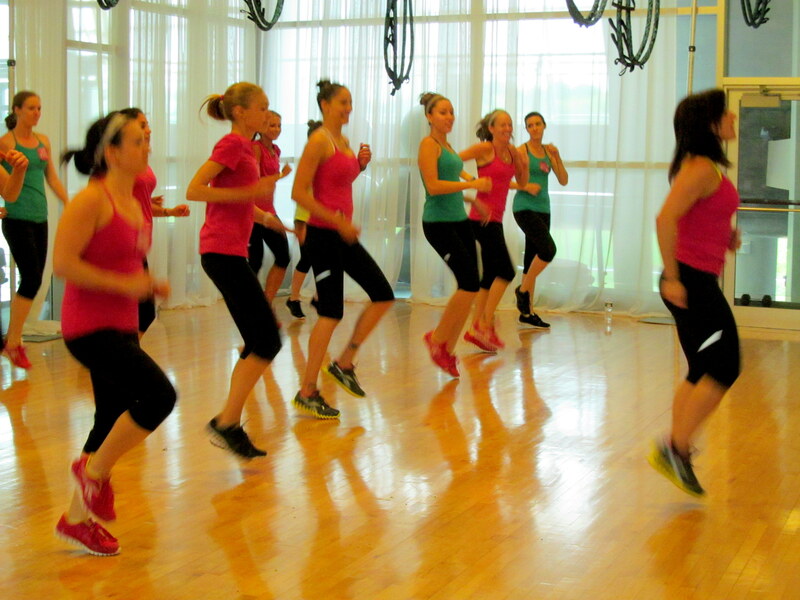 Would you have wanted to try Crossfit or a cardio dance workout? Do you already do either or both? 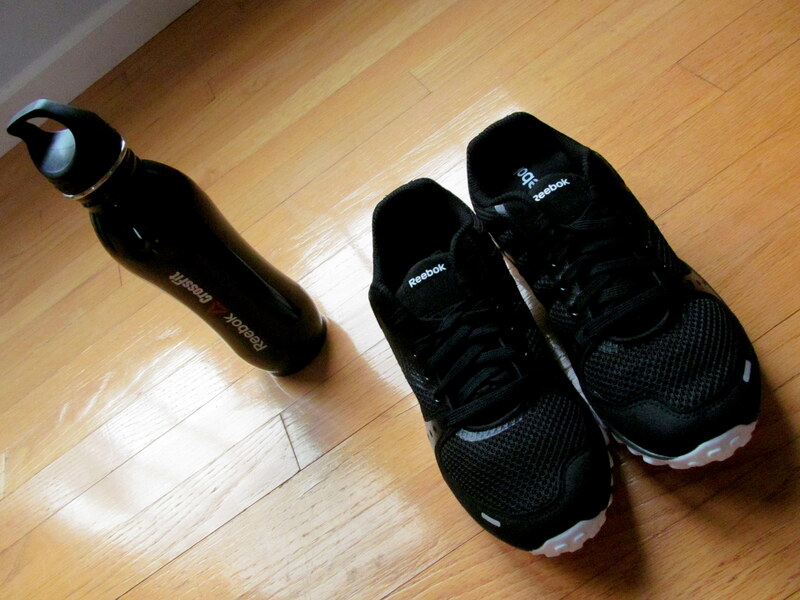 Which of the facts about Reebok that I shared here do you find most intriguing? What did you learn? 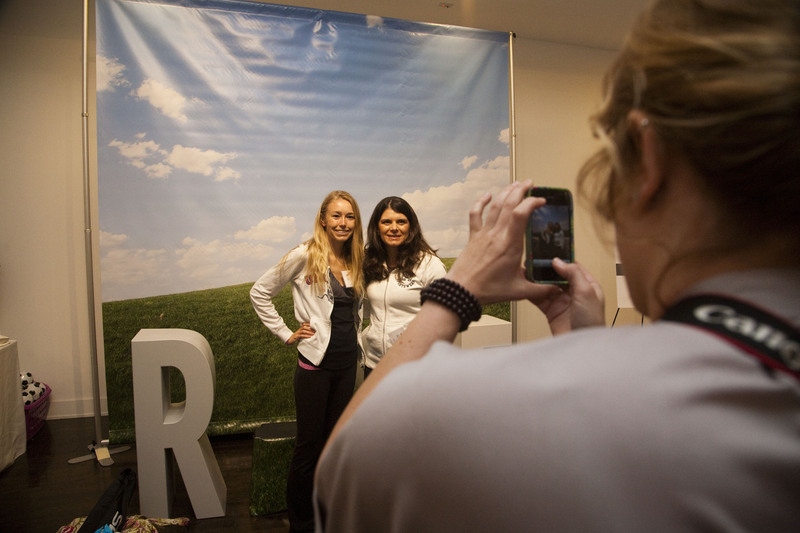 Did you spot any of your favorite bloggers in my photos? HI GUYS! I just wanted to let you know that I AM ALIVE. I have been living life at 80,000 MPH and though it’s NOT what I’m used to, it’s all been worth it to live what have truly been some of the best days of my life. And it’s not over yet! I’m about to head out to an amazing vegetarian/vegan restaurant with my best blend Heather called Garden Grille, and am staying over at her house tonight to unwind, work on getting my pics ready to share with you guys, and get much needed sleep! 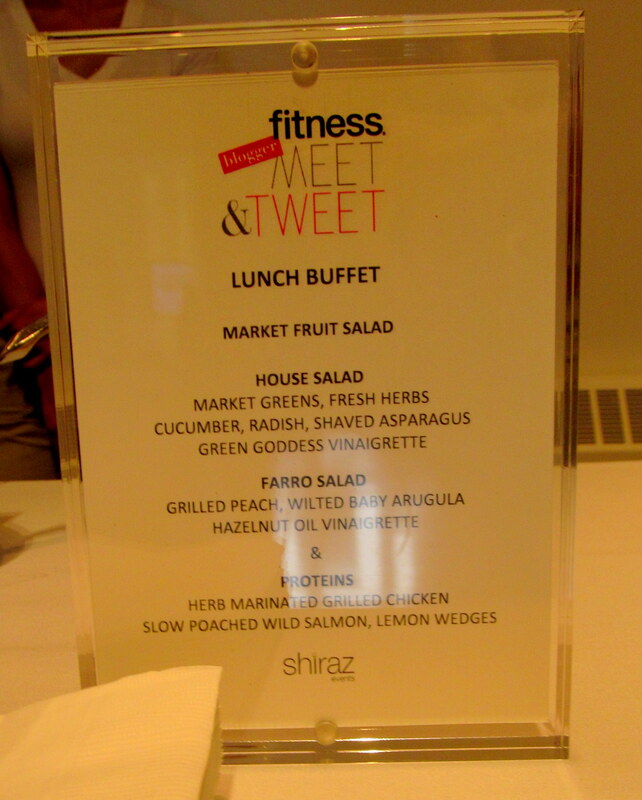 On Wednesday, I attended the FITNESS Magazine Blogger Meet & Tweet. I got to hear some great bloggers speak, and meet the faces behind some blogs that I have been reading for as long as three years. SURREAL! 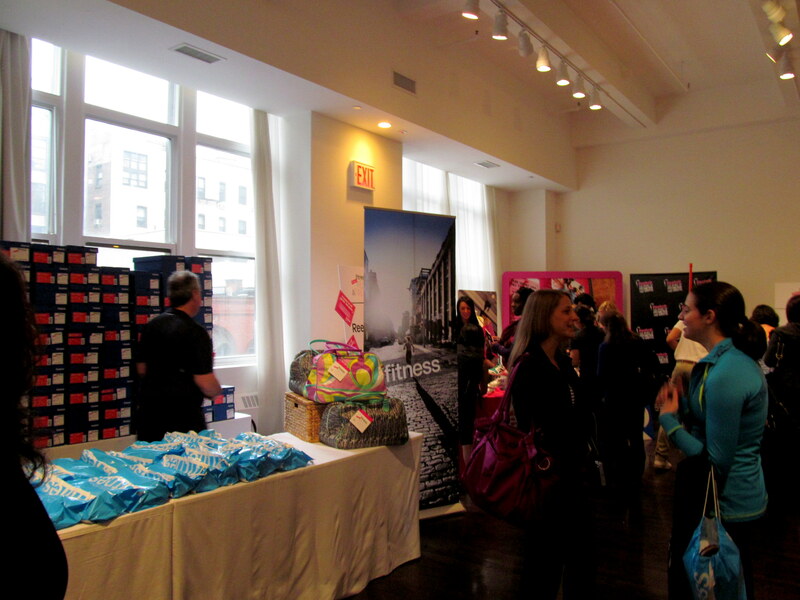 I also got the chance to try so many fantastic new products from brands like Oakley, Reebok, and many more. I capped the day off with one of the best meals of my life at Pure Food & Wine. Heather and I are running to dinner. I can’t wait to give you guys amazing posts that share my adventures with you. In the mean time though, head over to my Twitter and check out the zillions of tweets I’ve been putting out over the past few days. 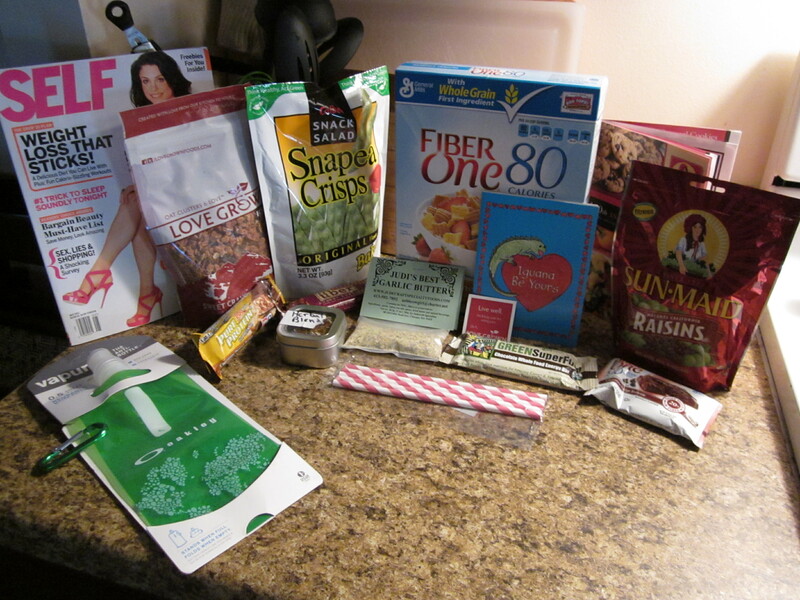 MANY include pictures, as well as fascinating fitness and blogging tips and secrets! 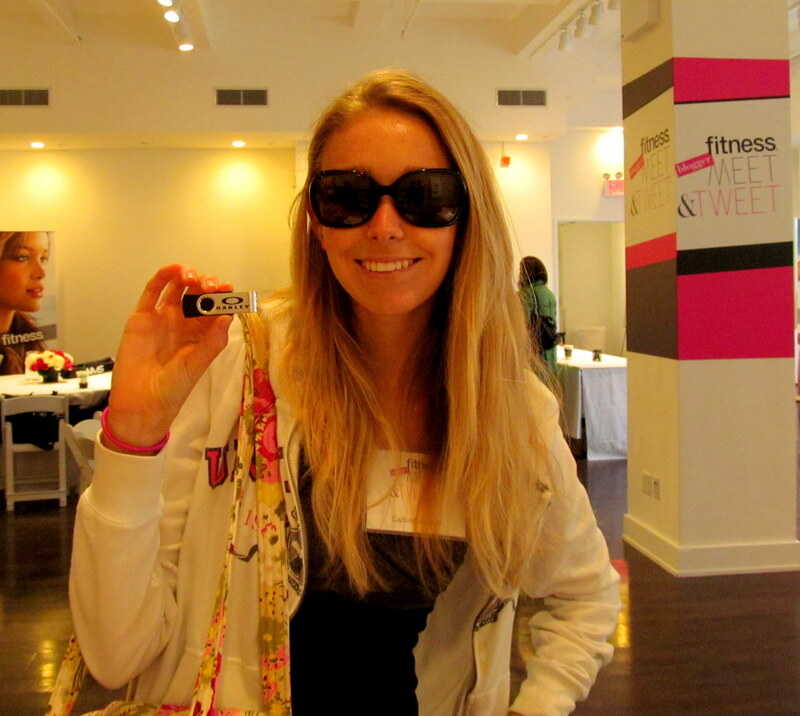 You can also see what other bloggers have been saying about the last few days by searching the hashtags #fitblognyc and #RBKFITBLOG. What part of my adventures are you most excited to hear about?! 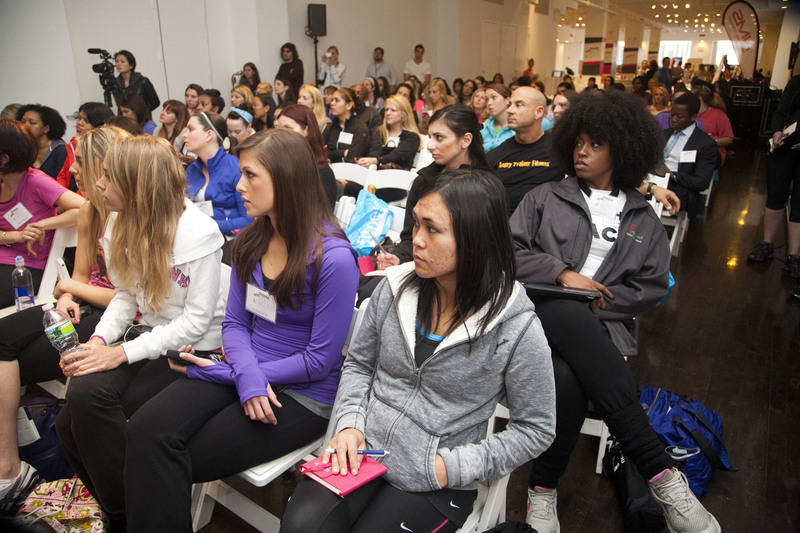 How much do you already know about Reebok and/or FITNESS Magazine? 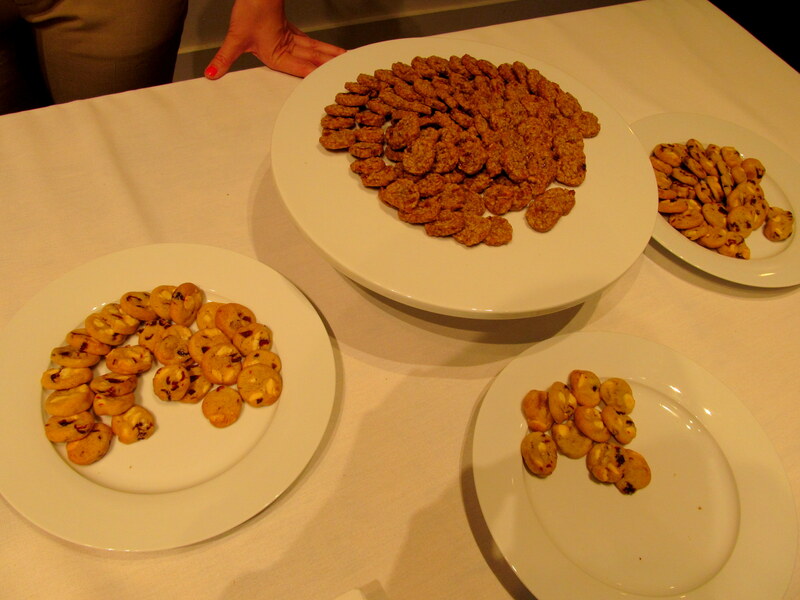 You may recall hearing about Share Our Strength from my two recaps of the organization’s Taste of the Nation event in New Haven, CT. Many other bloggers have covered the event at other locations as well. 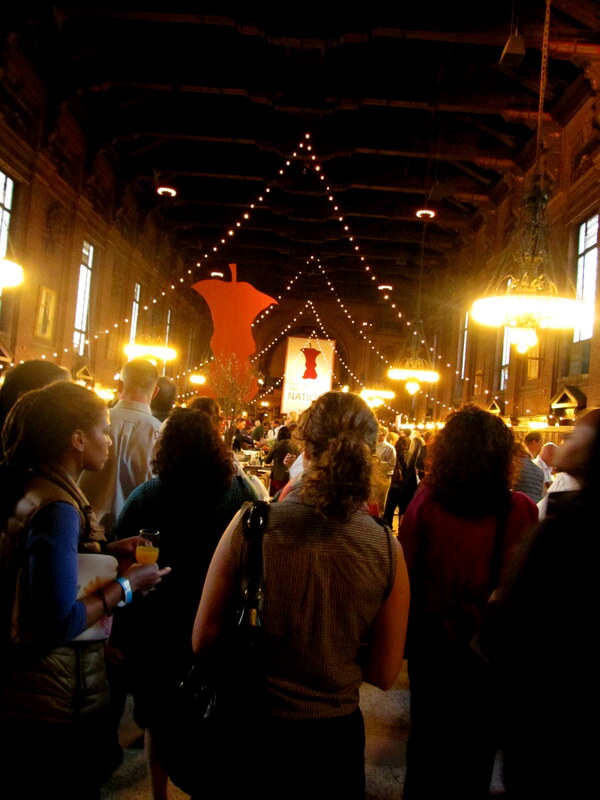 The organization strives to end childhood hunger in America by 2015 (its motto is No Kid Hungry), and the funds raised from admission and each event’s silent auctions go towards grants, public partnerships, and educational programs. Certainly a worthy cause! Taste of the Nation in New Haven. This Thursday May 10 from 6-9pm, Taste of the Nation comes to Hartford. 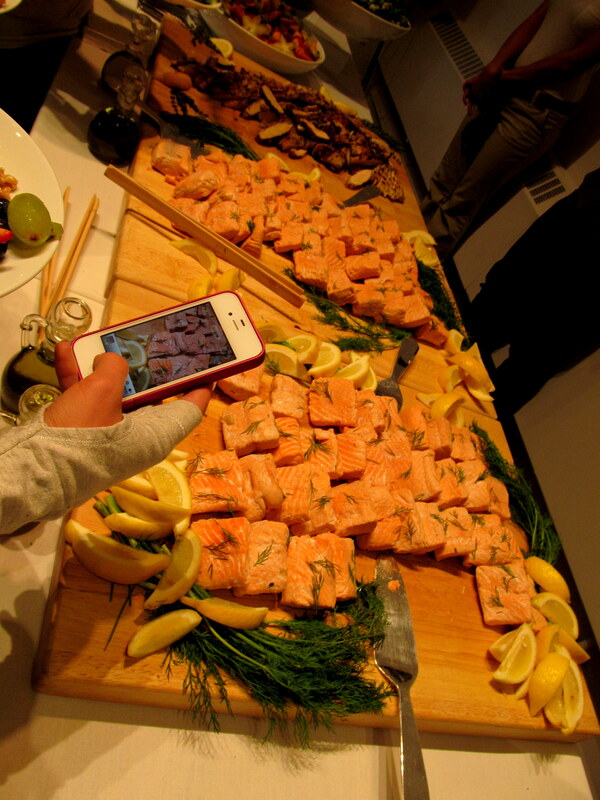 Marquee Events & Catering at 960 Main Street is the site of this year’s edition of the always-spectacular event. Check out its website for everything you need to know, including photos from the 2011 TON Hartford, as if you needed any further convincing about going! I will be away that day and unfortunately can’t make it myself…I’m trying so hard NOT to look at the website’s amazing list of restaurants and beverage reps that will be there! Some of my favorites include Barcelona, Besito, Bricco Trattoria, Catsup & Mustard, Cuvee, Esca, Firebox, Max Restaurants…you get the idea! And plenty of other buzzed-about places that I’ve always wanted to try like On20, Treva, and Salute will be present too. 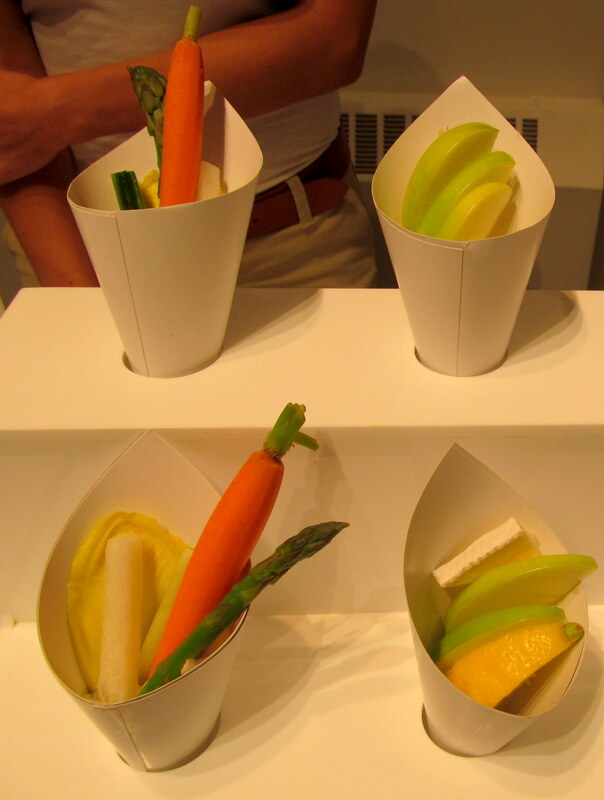 An offering from Barcelona Wine Bar at TON New Haven 2012…I wonder what they will be dishing up in Hartford?! 1. What motivated you to co-chair TON Hartford this year? My childhood friend, Heather Partridge, invited me to the [Share Our Strength] event 5 years ago. Billy Grant [of Billy Grant restaurants, and fellow Event Co-Chair] was auctioning off a dinner for 10 cooked in your home. I won the live auction. Billy and his Manager, Sarah (check out her interview below! 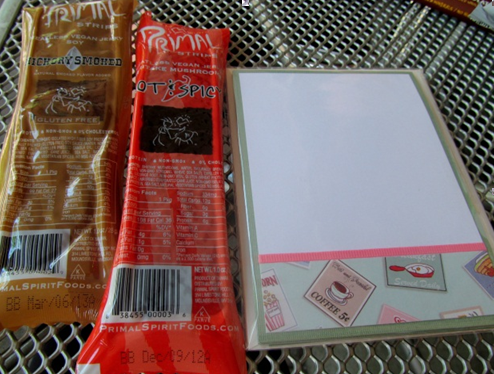 ), came to my house to go over all of the details. Once they realized I was an event planner, they asked me to join the committee. After joining the committee my first year, I was asked to co-chair. 2. What are the responsibilities of the event co-chair? I touch on everything except the restaurants. Billy Grant’s Manager, Sarah Maloney, handles all the restaurants (THANK GOD). 2. 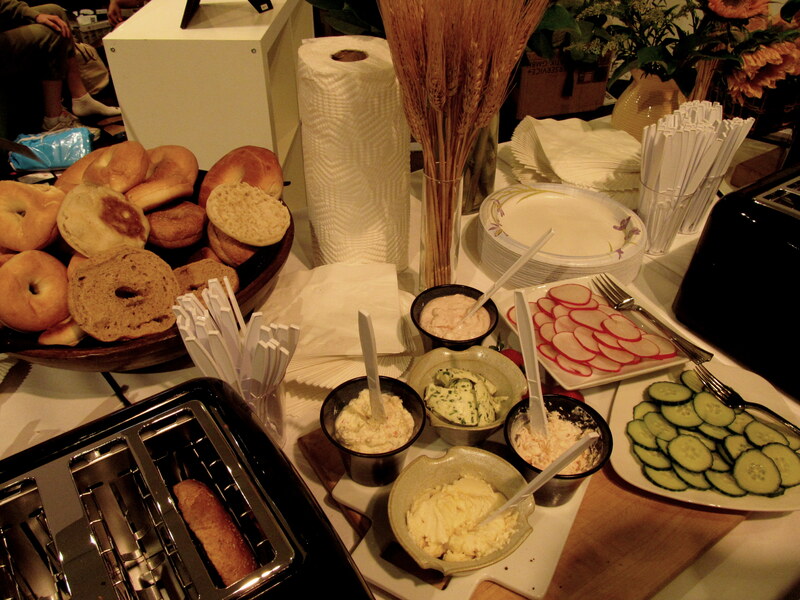 What do you think are the most important qualities a TON Hartford exhibitor restaurant should possess? Table flare is huge! Some restaurants really go all out! Some with huge flower arrangements, ice luges, TV monitors with scrolling pictures of their restaurants. 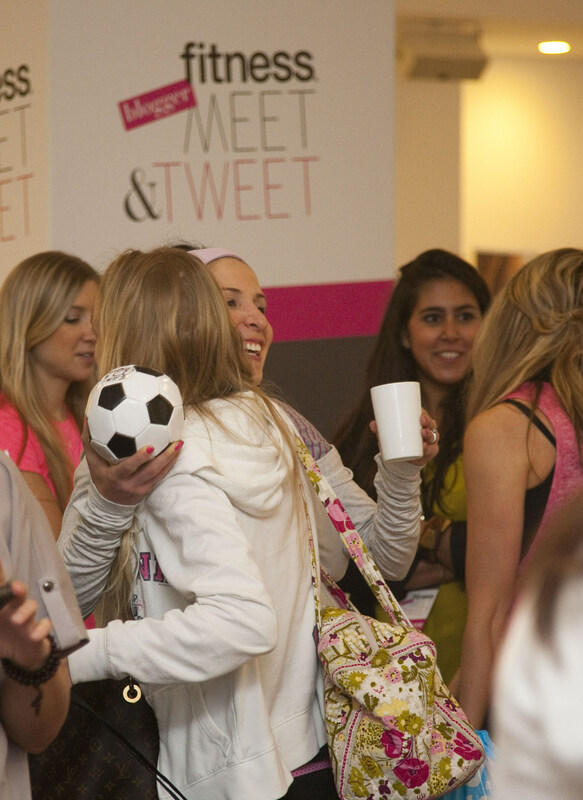 Whatever will catch the eye of guests walking around the event that creates interest! Also every year each restaurant brings a great representative that works the table that can interact with guests…you don’t always get to see a chef cooking your food so to see them out and cooking for you right there is so much fun!!! 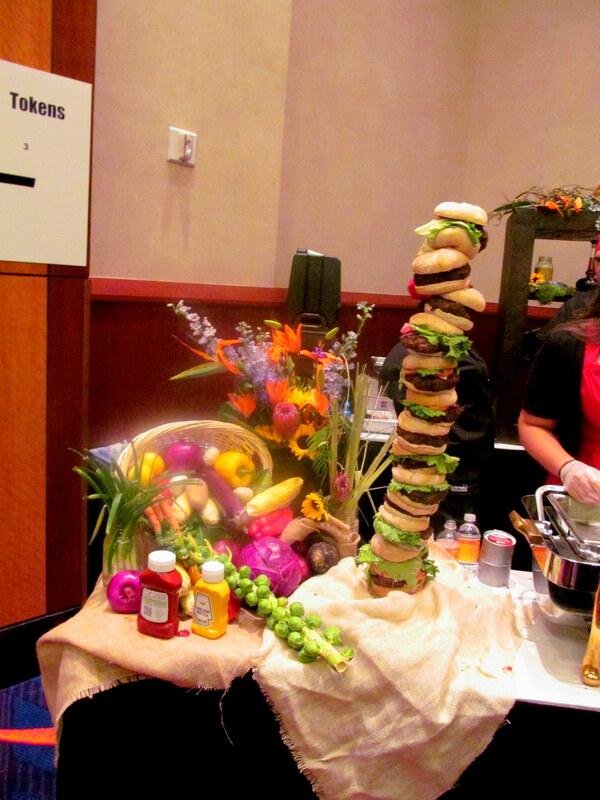 Plan B’s table display at Mohegan Sun WineFest 2012 – will they live up to this display at TON Hartford?! 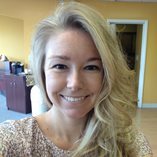 And finally, let’s hear from someone who works directly for a non-profit called End Hunger CT – Volunteer Chair Dawn Crayco! 1. What made you decide to be a volunteer chair with TON Hartford? 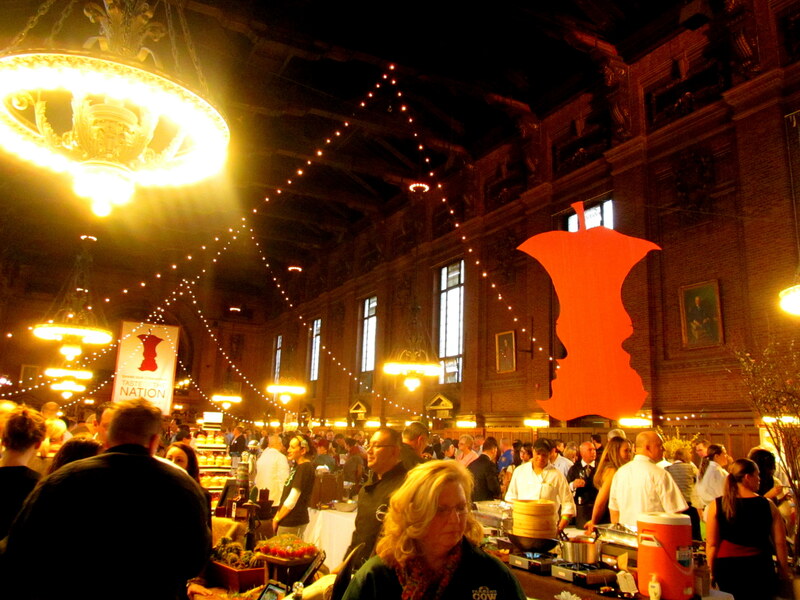 I spent a couple of years volunteering for Taste of the Nation Hartford at registration. I must have done something right because shortly after my second year I was asked to fill the vacant volunteer chair position on the committee. I have a great time mobilizing people looking to “give back” at the event and find the energy of the committee and volunteers is contagious. That is what keeps me coming back. 2. Tell me more about End Hunger CT. Are you affiliated with Share Our Strength at all, or do you just share common goals? End Hunger Connecticut! 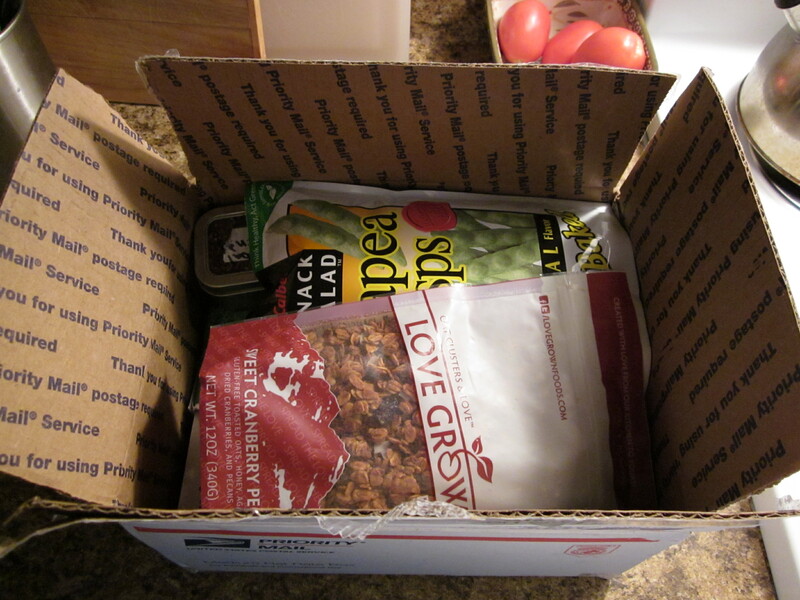 is a statewide anti-hunger and food security organization. By focusing on advocacy, outreach, education and research around the federal food programs, EHC! serves as a comprehensive anti-hunger resource for policymakers, community organizations, and low-income families. The goal of EHC! 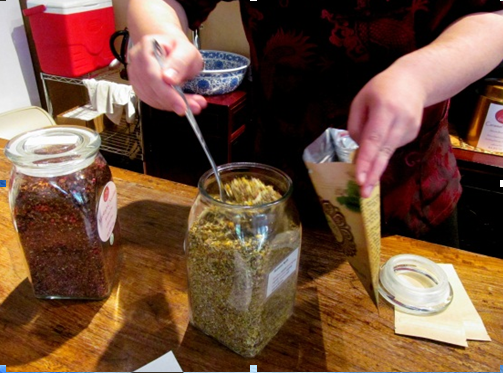 is to improve the levels of food security and nutrition among Connecticut families while creating and supporting policies that move families toward self-sufficiency. 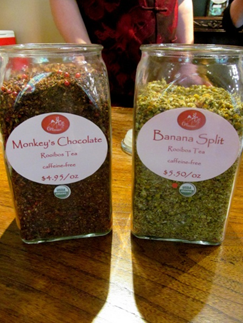 A long time grantee of Share our Strength initiatives, like Taste of the Nation, EHC! 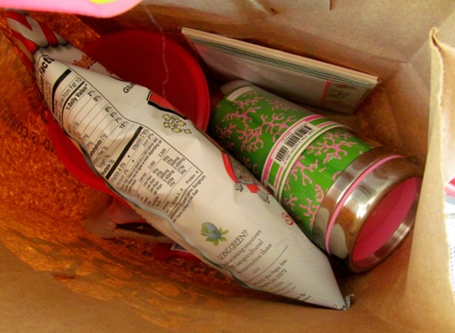 is the organization’s lead partner on the Connecticut No Kid Hungry Campaign. Connecticut No Kid Hungry® Campaign was launched in March 2011 with Governor Malloy and Share our Strength to end childhood hunger in the state by 2015. Now in its second year, the campaign is focusing on increasing participation among eligible children in the School Breakfast Program, Summer Food Service Program (SFSP) and the Child and Adult Care Food Program’s (CACFP) Afterschool Meal Program. Please visit our new websites to learn more about these programs: www.ctsummerfood.org & www.ctschoolbreakfast.org. 3. 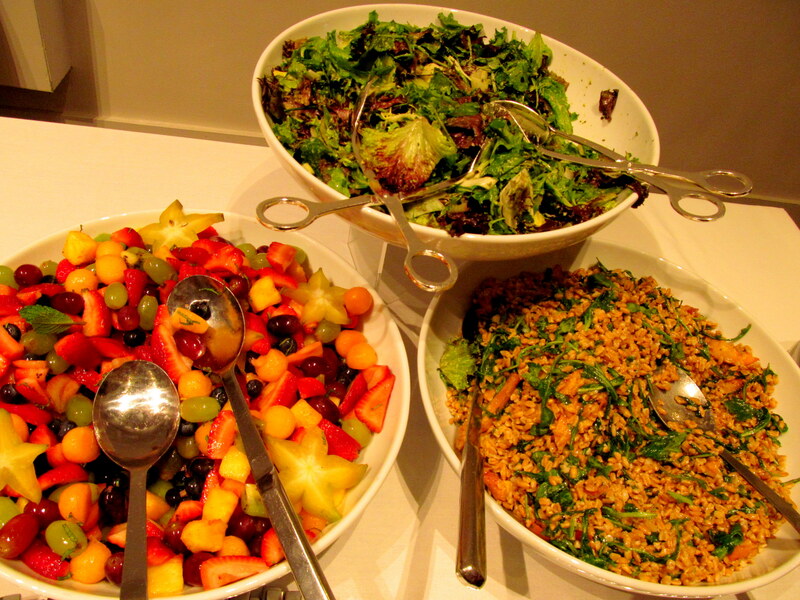 What is your favorite restaurant out of all the attendees? No “they’re all my favorite” answers allowed! 😀 I can honestly say that I do not have one favorite restaurant; however, I do flock to restaurants serving my Italian favorites like gnocchi, ravioli, and anything cheesy. I’ll try anything new at least once but you’ll see me getting seconds and thirds at restaurants like Grants, Restaurant Bricco, Bricco Trattoria, and Salute. Thank you to these amazing volunteers for taking time out of their busy schedules, especially the week of the event, to answer my questions! Tickets to TON Hartford are $75 for general admission and $125 for VIPs. 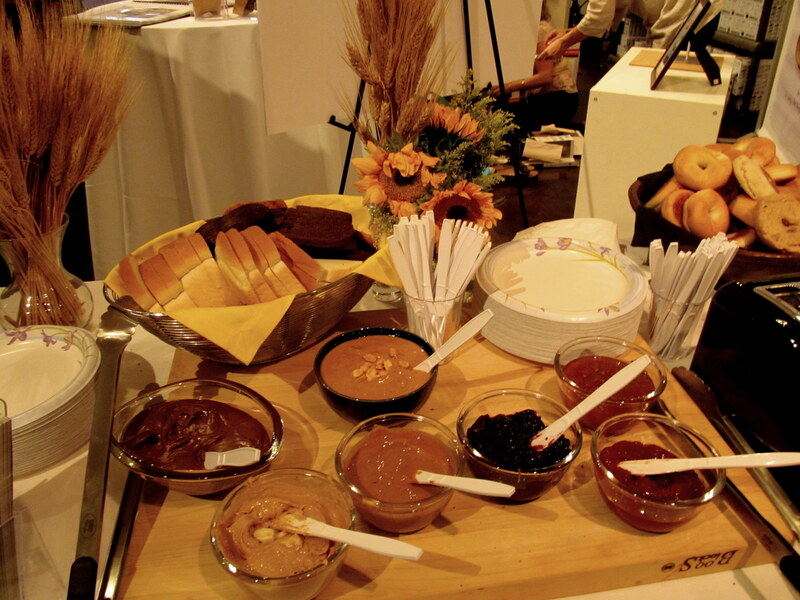 Having attended a Taste of the Nation event myself, I can tell you with confidence that the admission price, though it may seem high, is COMPLETELY worth it! Especially for the chance to try so many restaurants where you would normally spend almost $50 per person on a meal anyway! So what do you say? Will you be headed to TON Hartford at 960 Main St in Hartford this Thursday, 5/10, from 6-9PM? Have you ever been to a similar event or fundraiser?